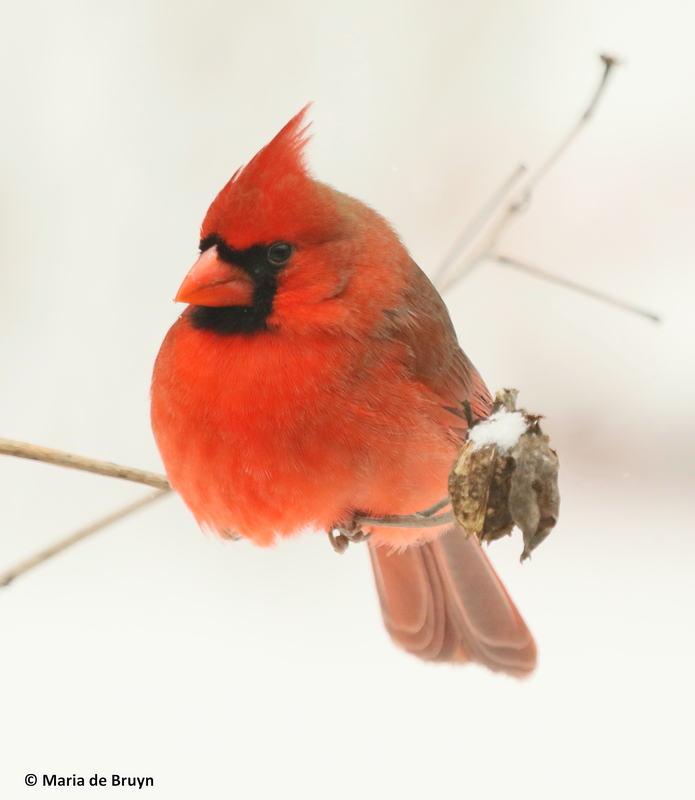 On the last day of January 2019, I thought it would still be ok to post a couple blogs on some surprises I encountered the past year. 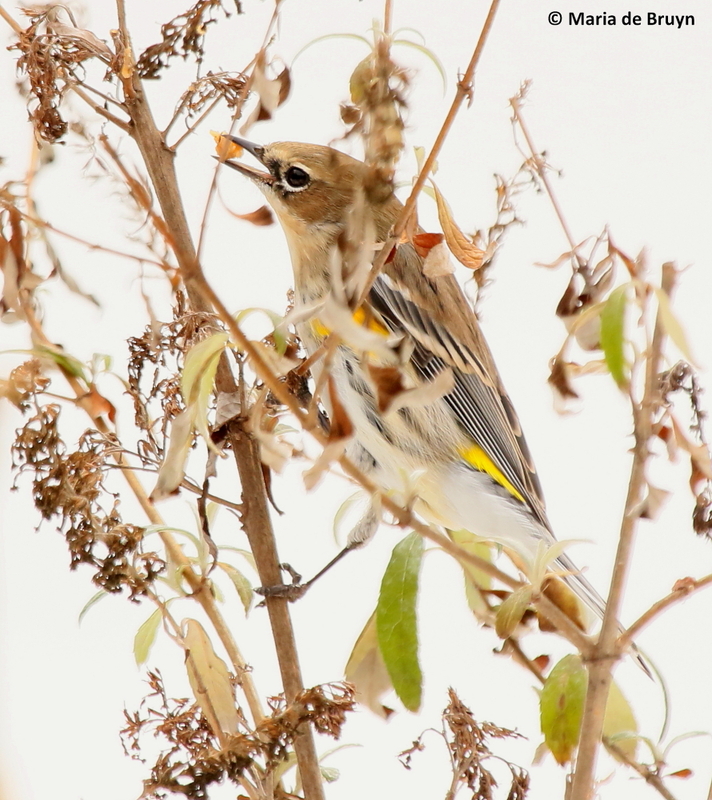 Almost always when I go out on nature walks, I encounter something new – a species of wildlife or plant that I have not seen before or an interaction between species not previously observed. So, I wanted to share a few of those delightful surprises from 2018. 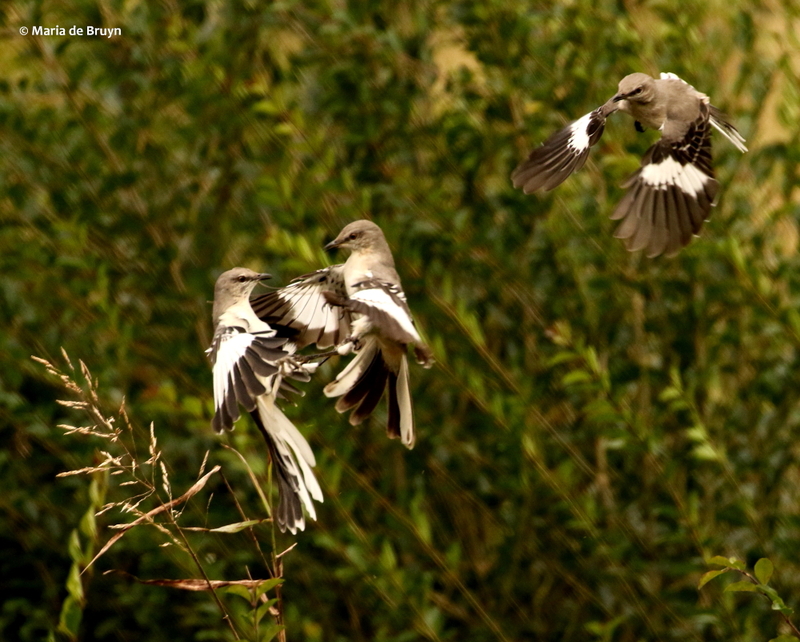 In this blog, I focus on birds; in the next part, other kinds of wildlife will be featured. 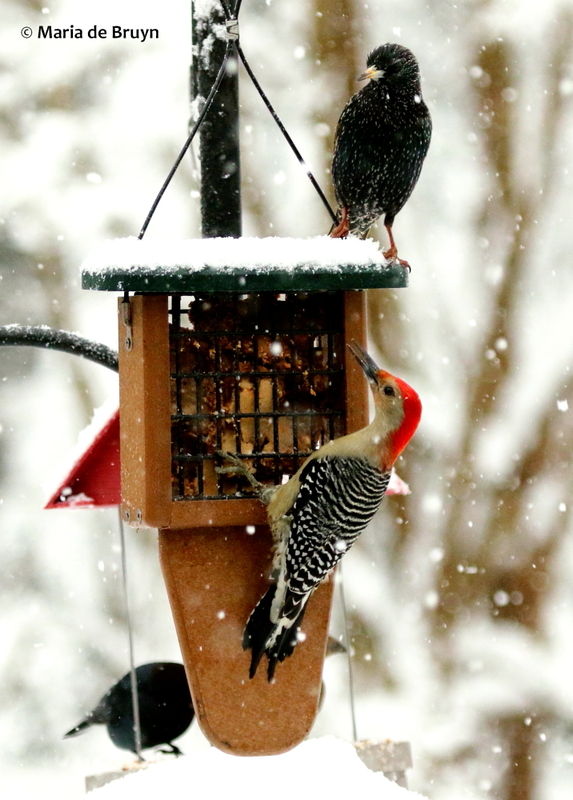 As I mentioned in a previous blog, my own front yard was the scene of my biggest surprise last year when a snowstorm brought feeder visitors whom I had never seen before and who rarely come to the state where I live. 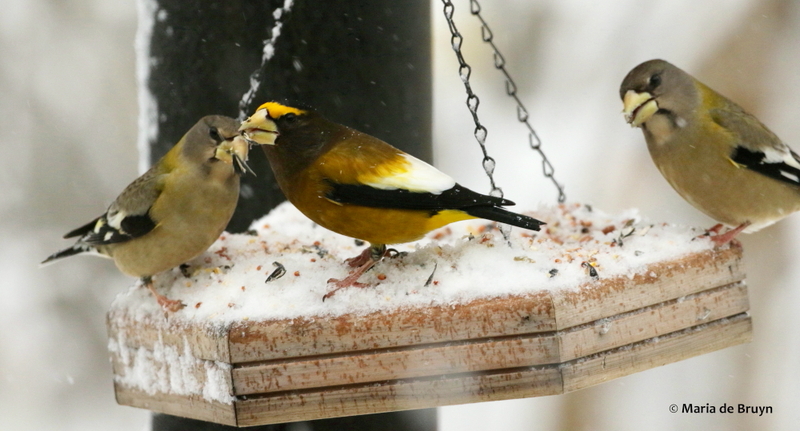 The evening grosbeaks were just stunning. 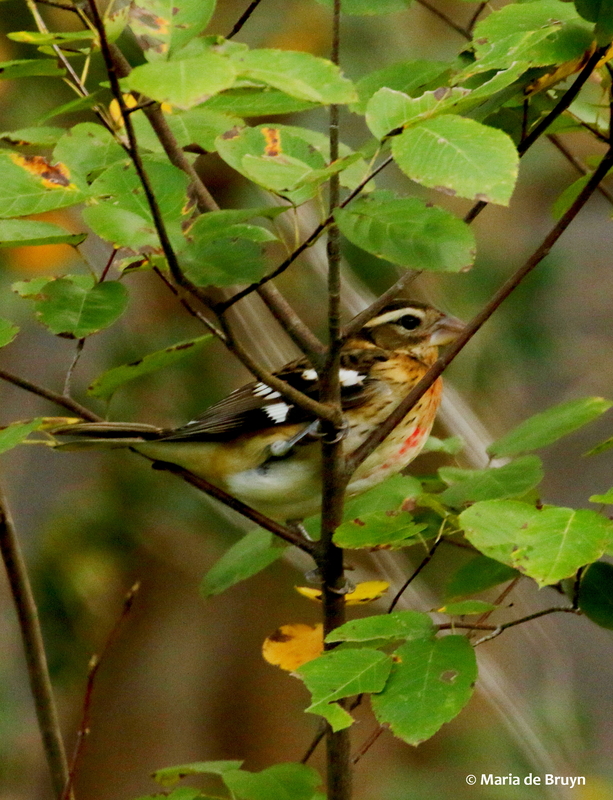 They were not the only grosbeaks who treated me with their beauty, however. 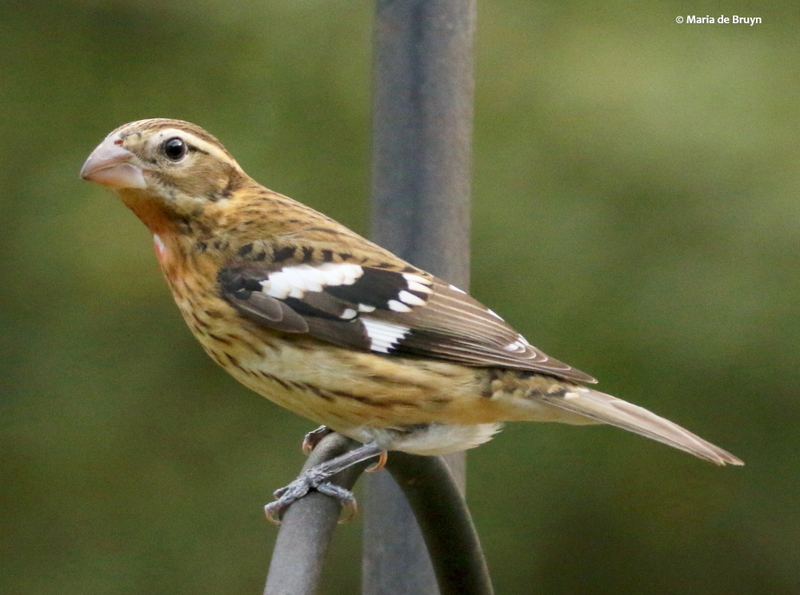 I’ve had rose-breasted grosbeaks (Pheucticus ludovicianus) visit the feeders before, but they still always elicit my appreciation with their bright colors. 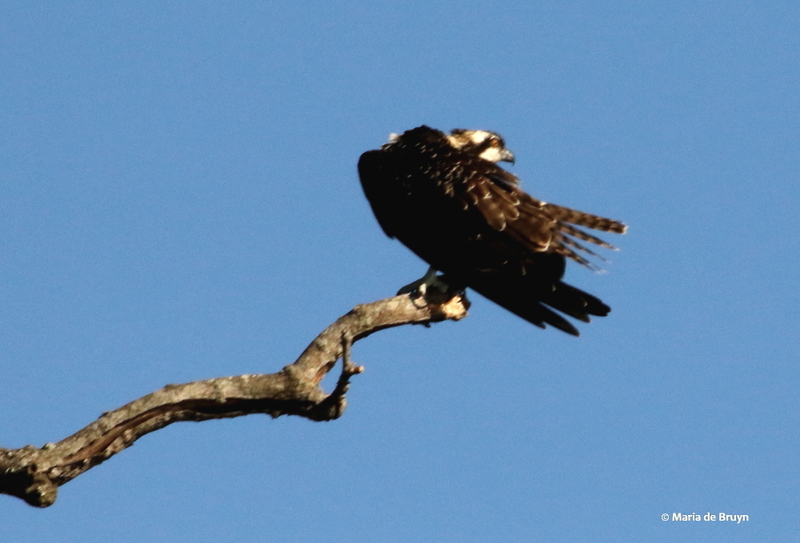 In late October, an osprey (Pandion haliaetus) made me stop for a photo as the other birds of its species had already gone south for the winter. 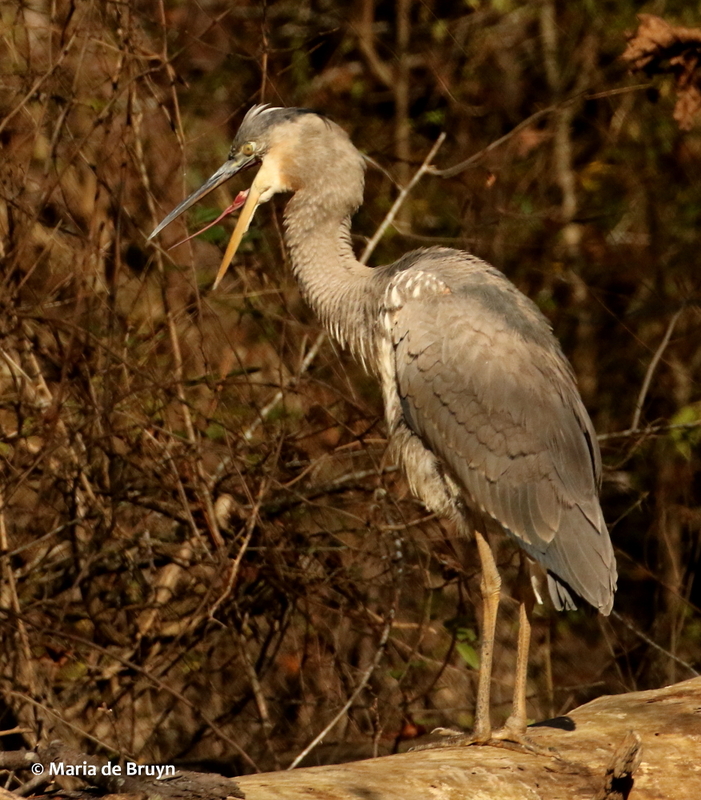 The bird was perched on a branch extended over a pond and had to unfortunately contend with a persistent crow that was harassing it. 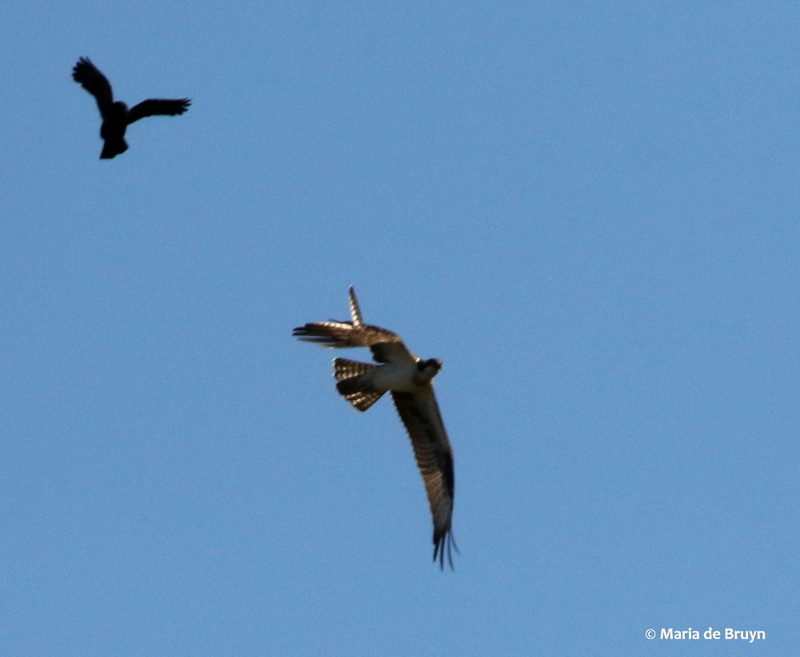 After some time, the sea eagle finally took off with the crow in pursuit – it seemed that the osprey might have injured its wing and perhaps that accounted for a delayed departure to warmer climes. 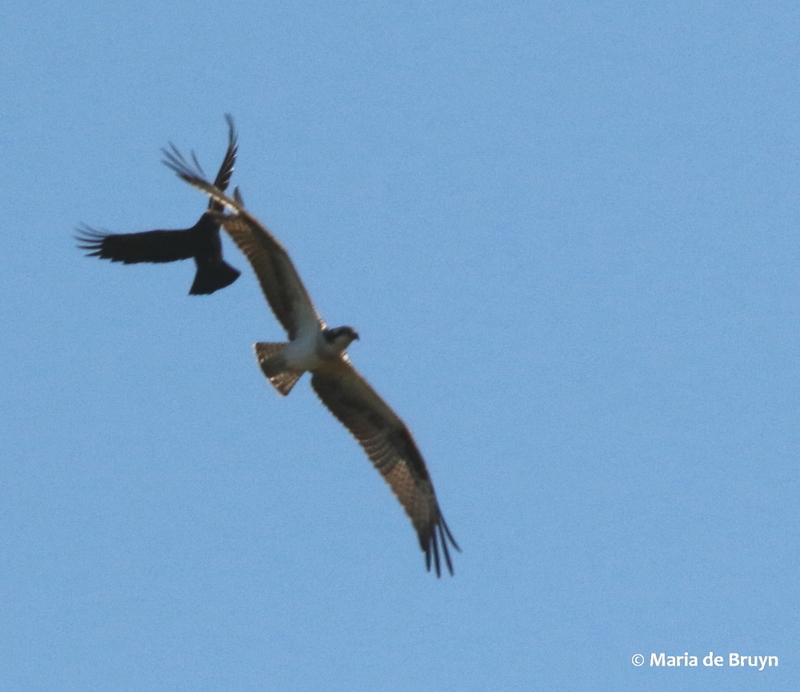 Although the pursuit photos are not high-quality, you can see a gap in the osprey’s wing and perhaps it was waiting for healing before it undertook a very long journey. 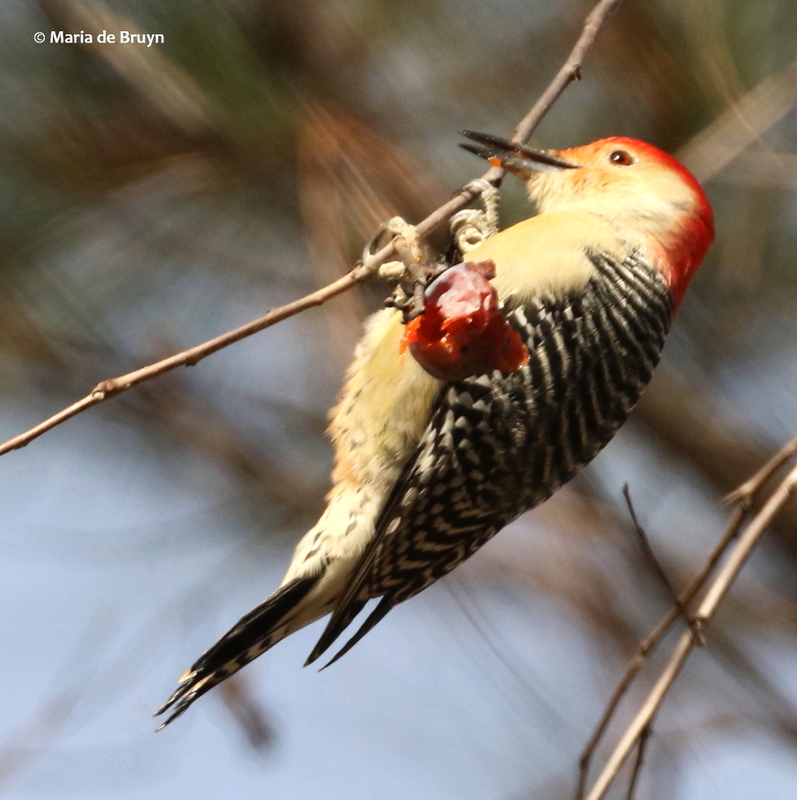 On another day, I was near a wetland when an unexpected visitor flew onto a branch above me. 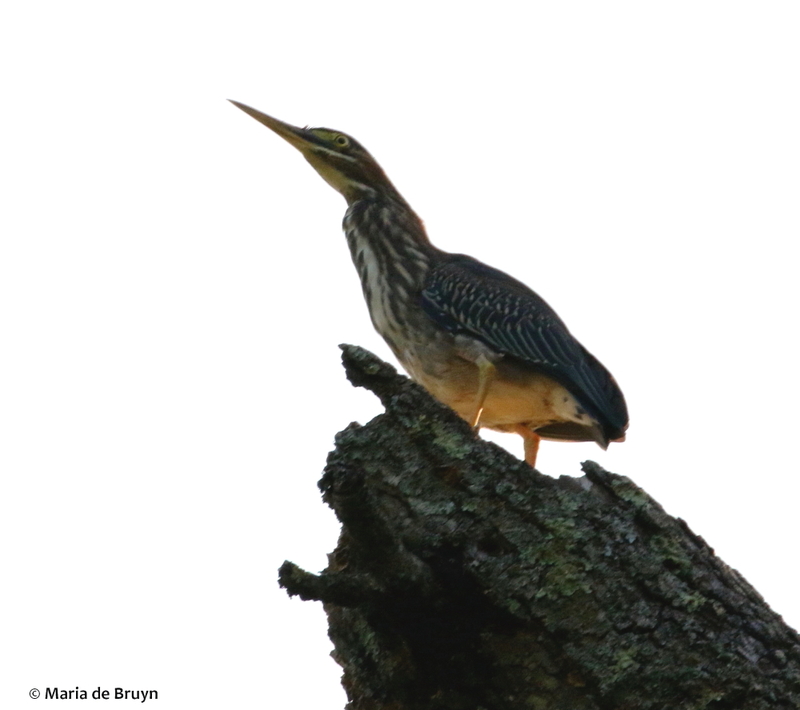 Green herons (Butorides virescens) usually keep their distance from me; I regretted that it was overcast and the lighting was not wonderful for my close-up portrait of this colorful immature bird. 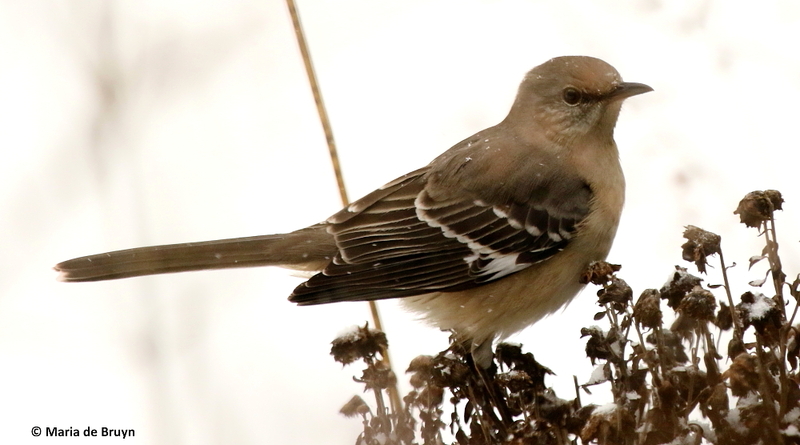 A more muted bird, but lovely nonetheless, is the Northern mockingbird (Mimus polyglottus). 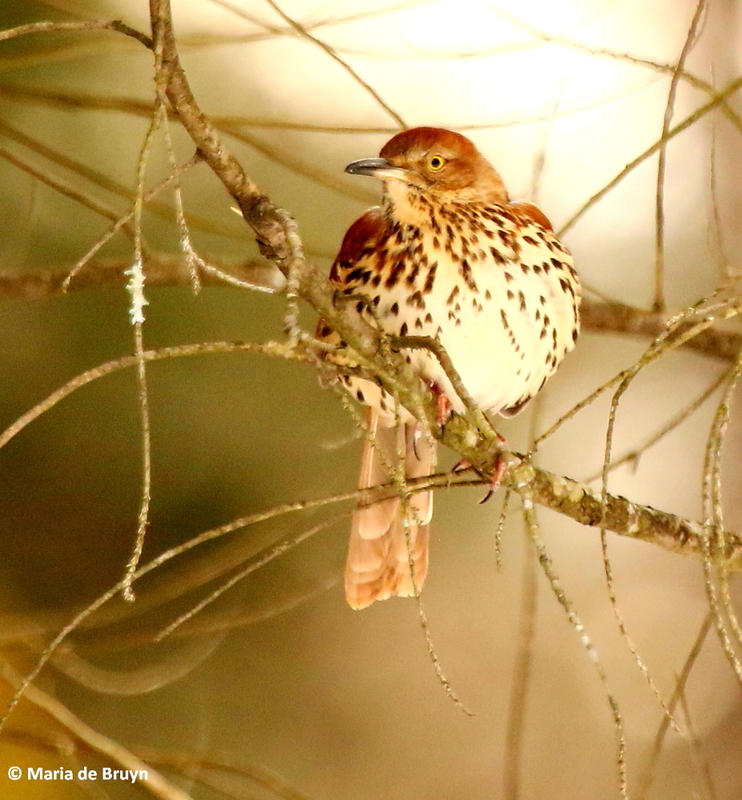 When I saw this individual in late December, I was thinking that it must be difficult for them to find food as the vegetation shrivels and insects are in hiding. 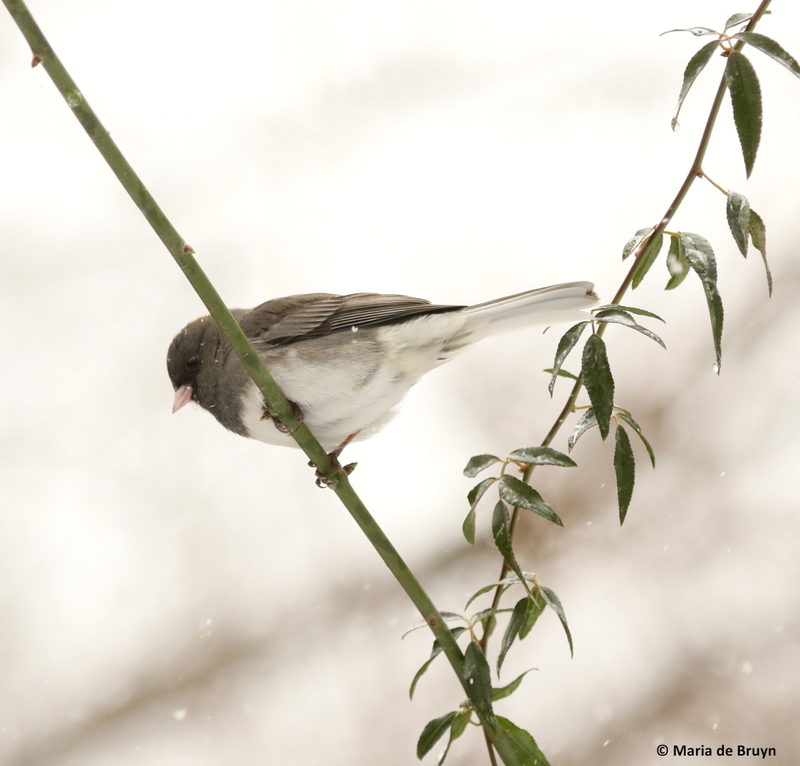 At that moment, the bird dropped to the ground and was foraging – coming up with a bug to prove that they still could find sustenance in the cold temperatures! 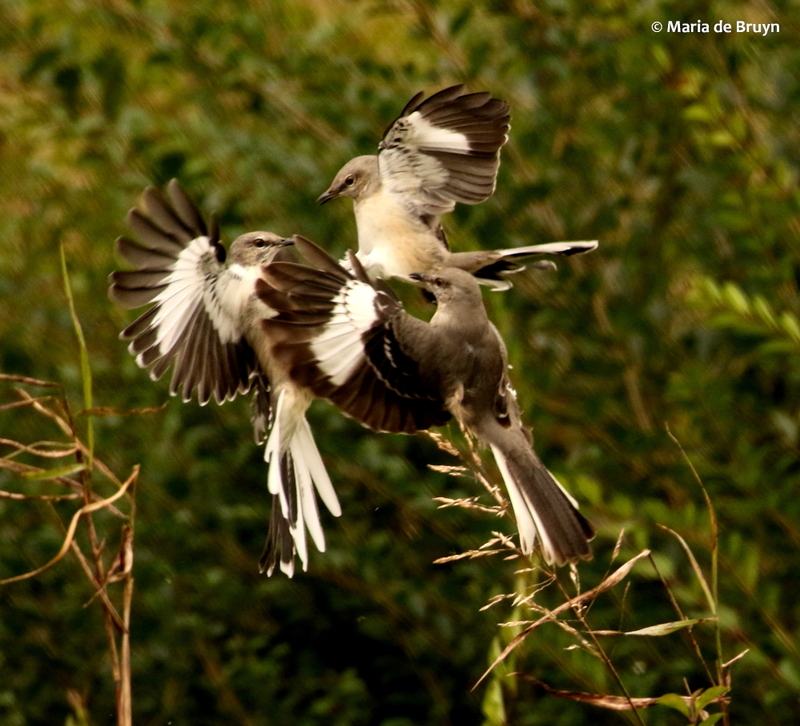 The mockingbirds are often solitary except for breeding season. 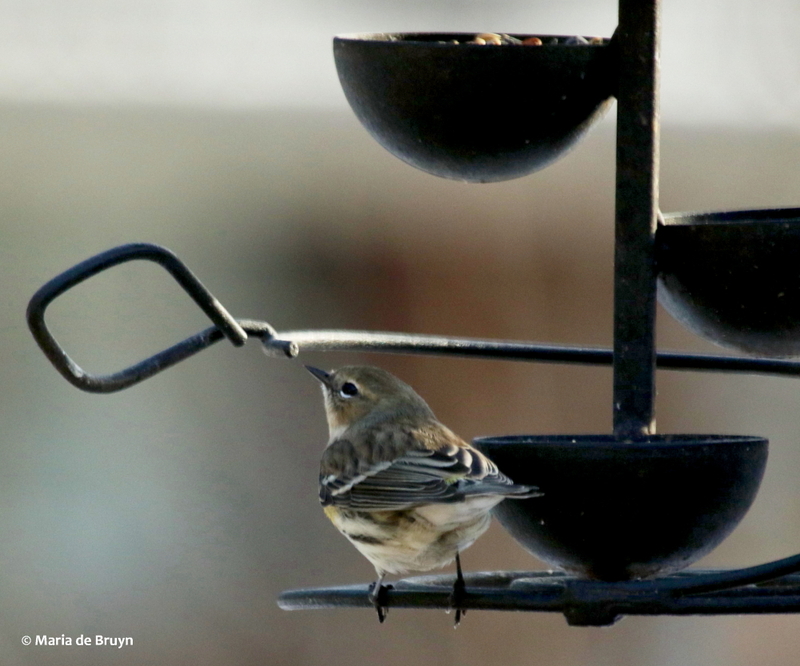 Some people complain that they are aggressive towards other birds at their feeders but those in my yard are not that way at all. 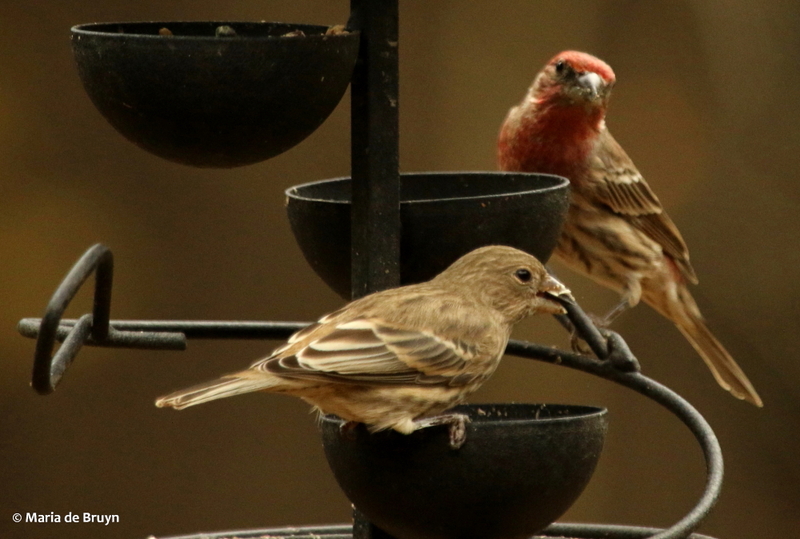 They share space at feeders and don’t chase anyone else away. 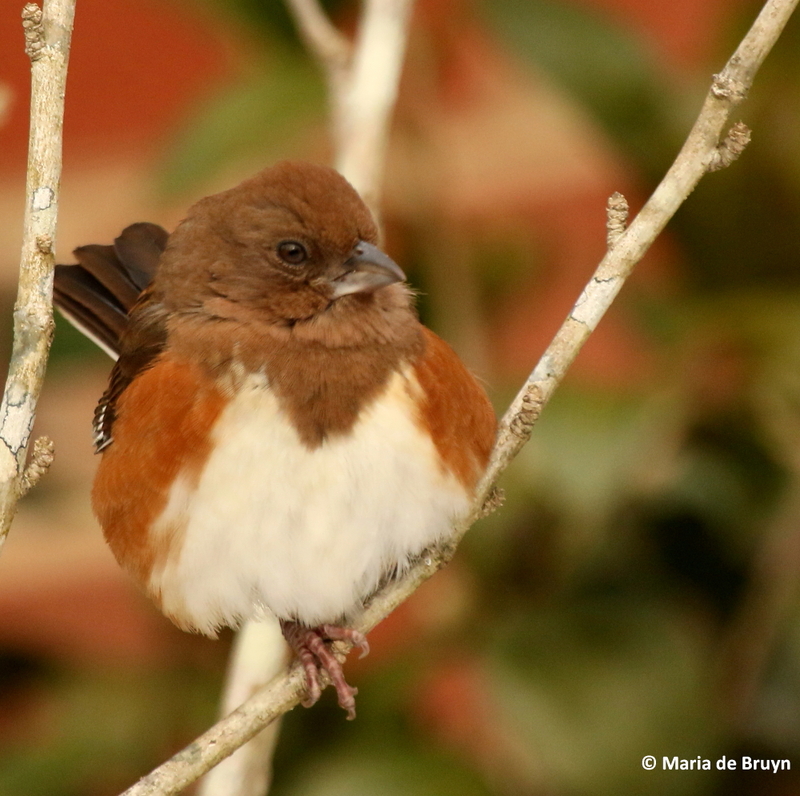 When it is mating and nesting time, however, they can become quite territorial and are very protective of their nests. 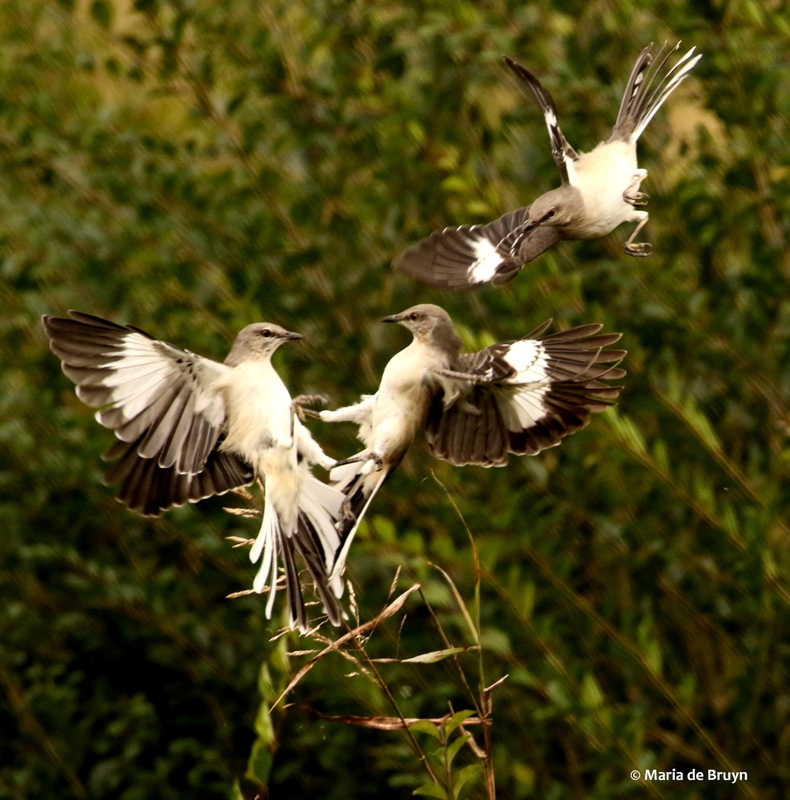 This seasonal “grumpiness” was brought home to me one day along a country road when I witnessed a pair of mockingbirds driving a third bird – rival? Intruder? 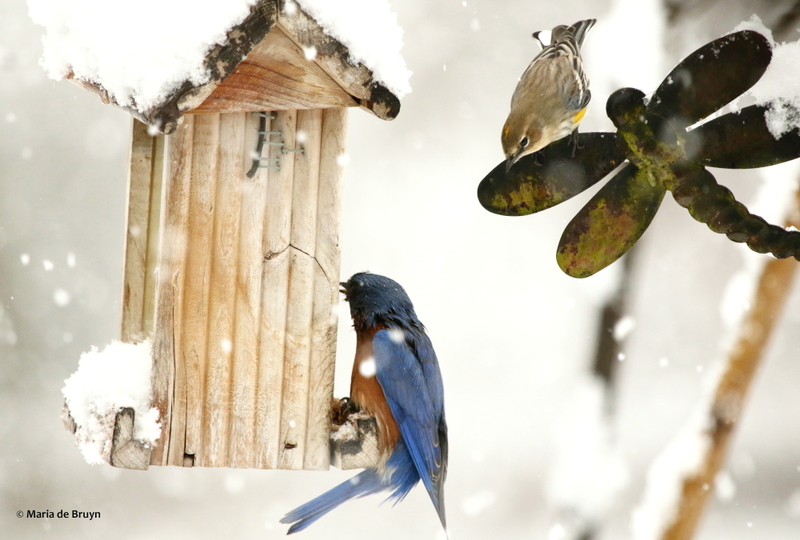 – away from their roosting spot. 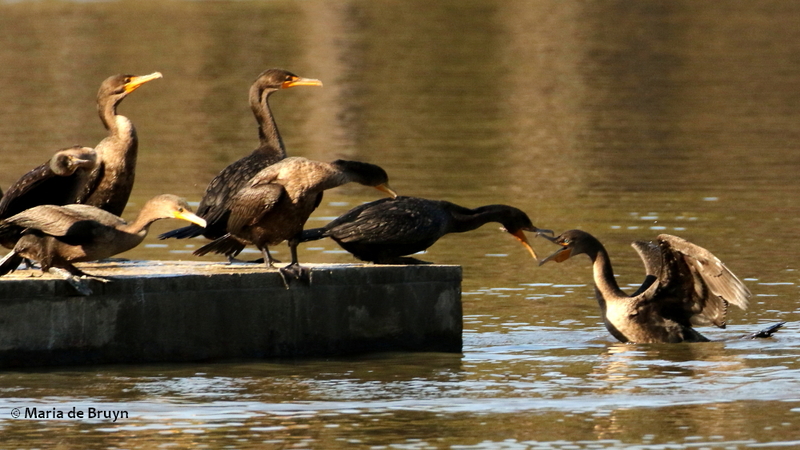 When large flocks of gulls and double-crested cormorants (Phalacrocorax auratus) visited a small local lake because of a shad die-off, I had the chance to watch them for a while. 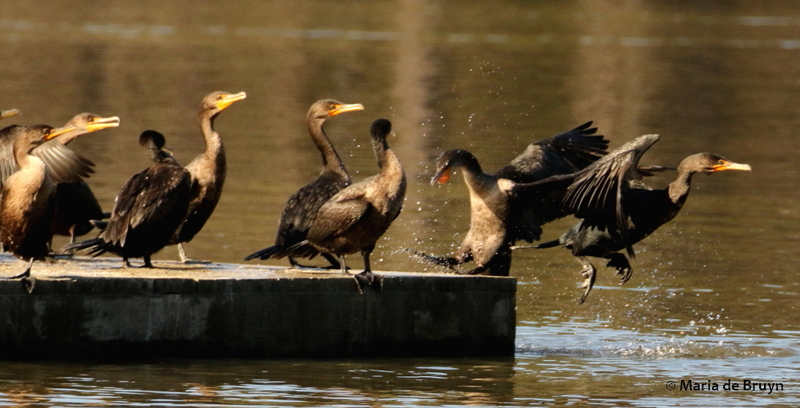 One day, it was interesting to observe how one cormorant wanted to jump up on a floating platform, but another bird didn’t want him/her there. 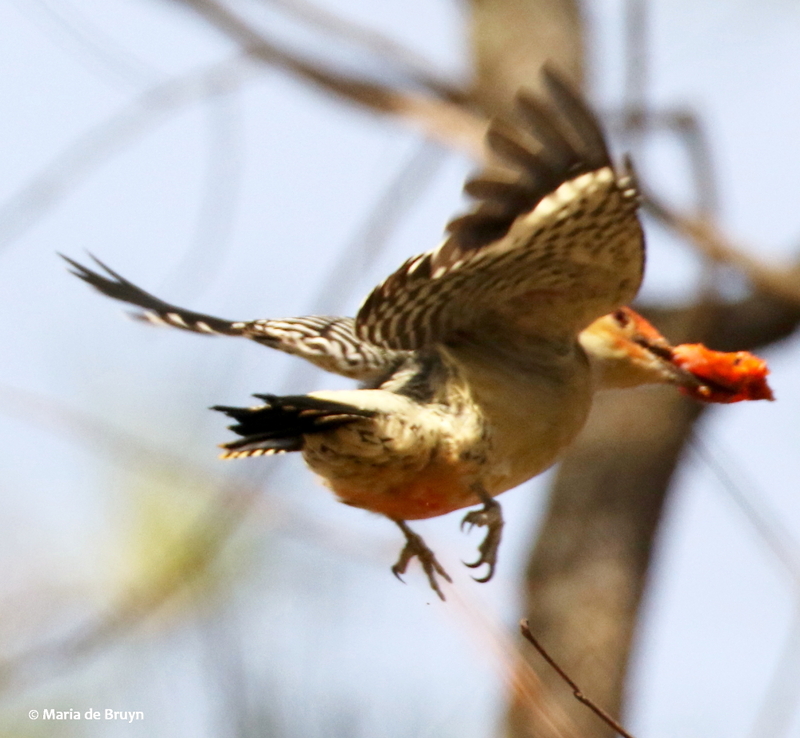 They faced off with open beaks – the bird wanting to get out of the water won. 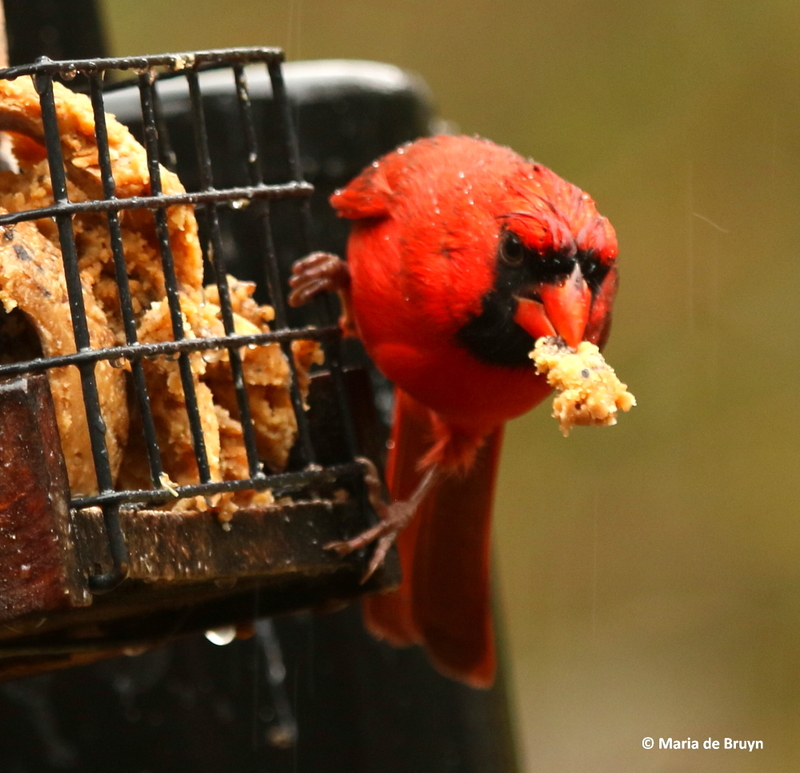 It’s always interesting to me to watch birds as they forage for sustenance. 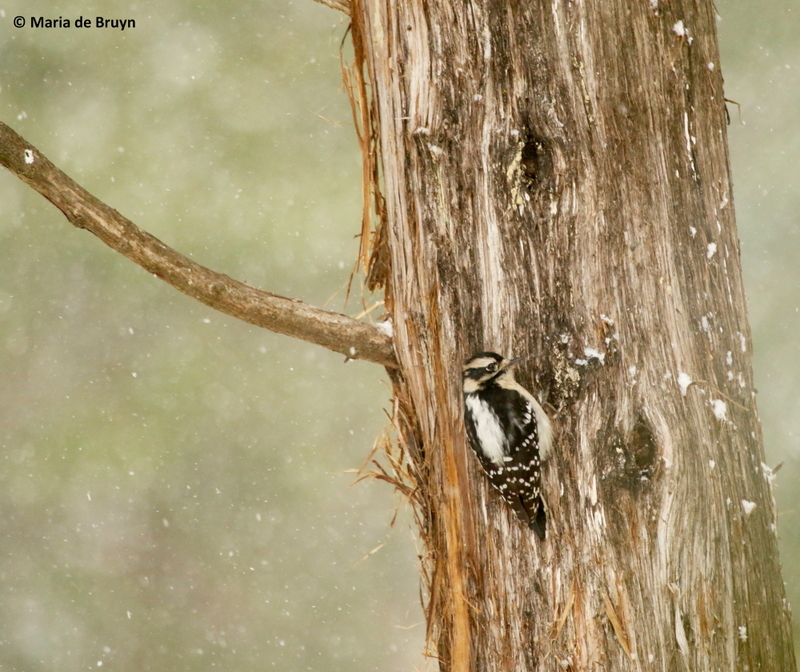 When I think of woodpeckers, my thoughts immediately turn to nuts and insects, which I think of as their staple diets. 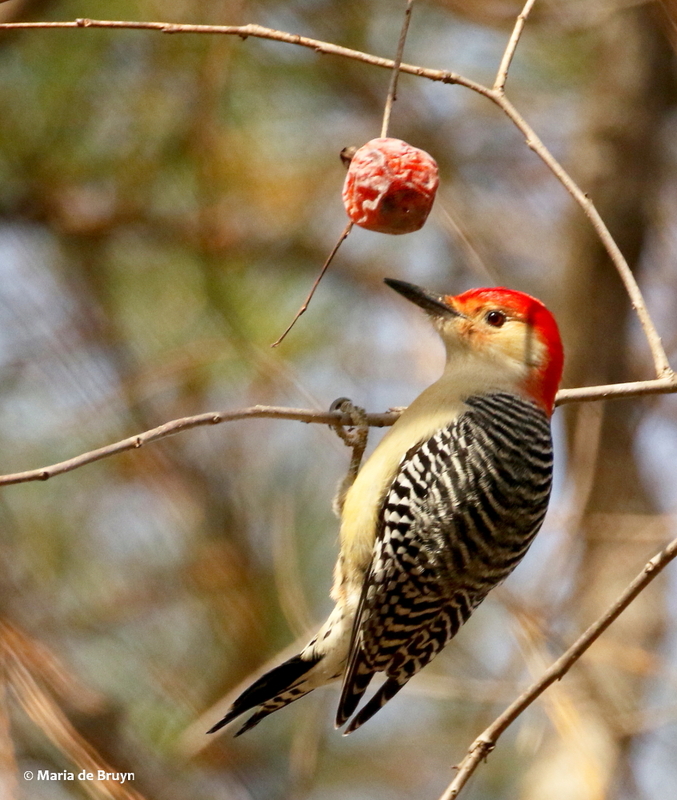 So it was a surprise to me to see this red-bellied woodpecker (Melanerpes carolinus) dining at length one day on nice ripe persimmons – a bird with a sweet tooth! Well, I probably shouldn’t say “sweet tooth” but “sweet tongue”. 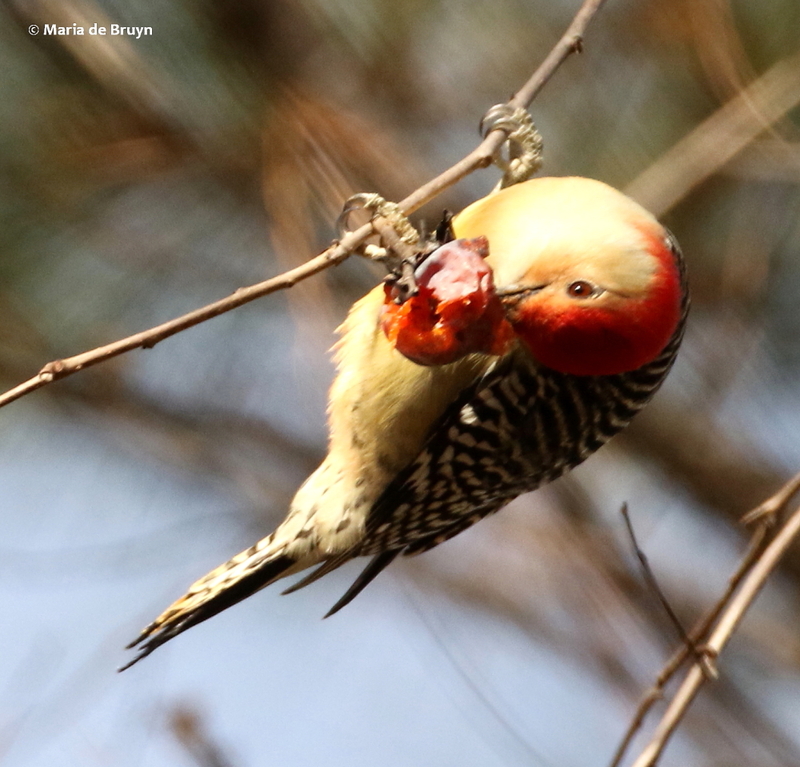 Woodpeckers don’t have teeth but they have exceptionally long tongues that can be wrapped around their brains inside their skulls when not being used to extract insects and other food morsels from crevices. 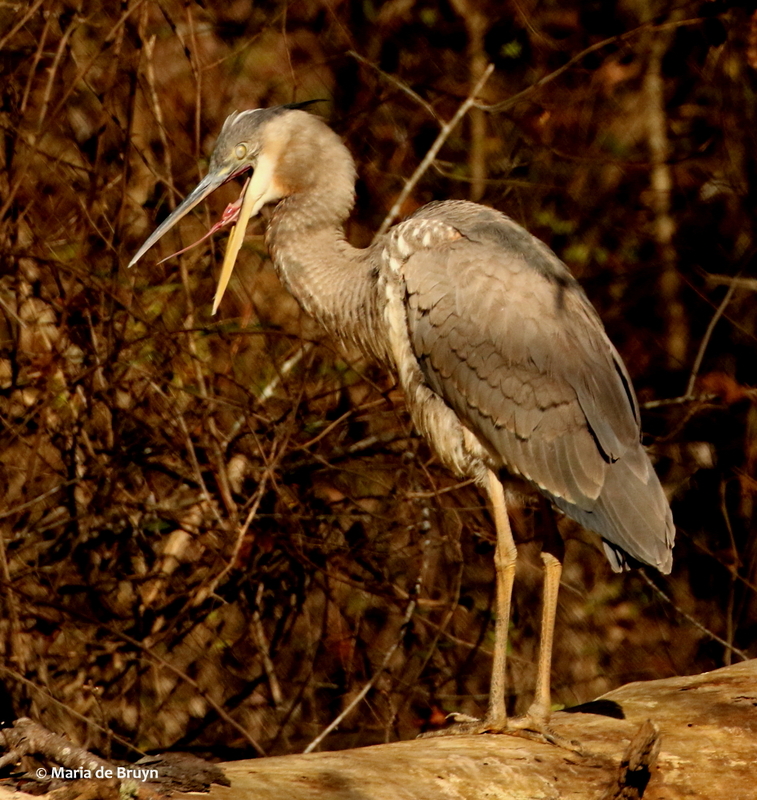 Another bird that has a long tongue is the great blue heron (Ardea herodius). 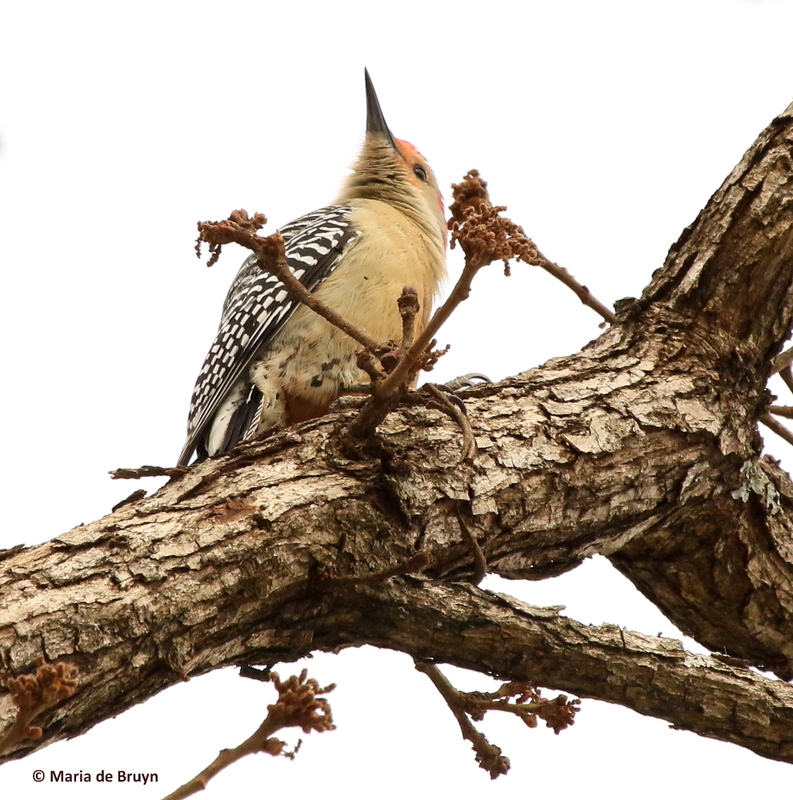 One day, I came across this bird on its favorite roosting log obviously trying to dislodge something that had gotten stuck – or perhaps something that tasted foul. 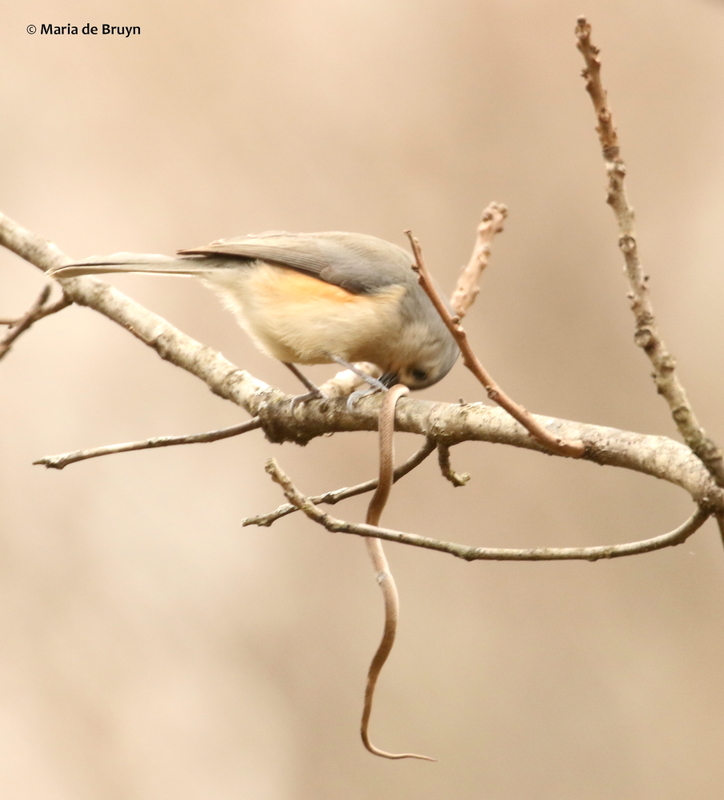 I hadn’t really seen the species’ tongue before, so the bird gave me some good views. 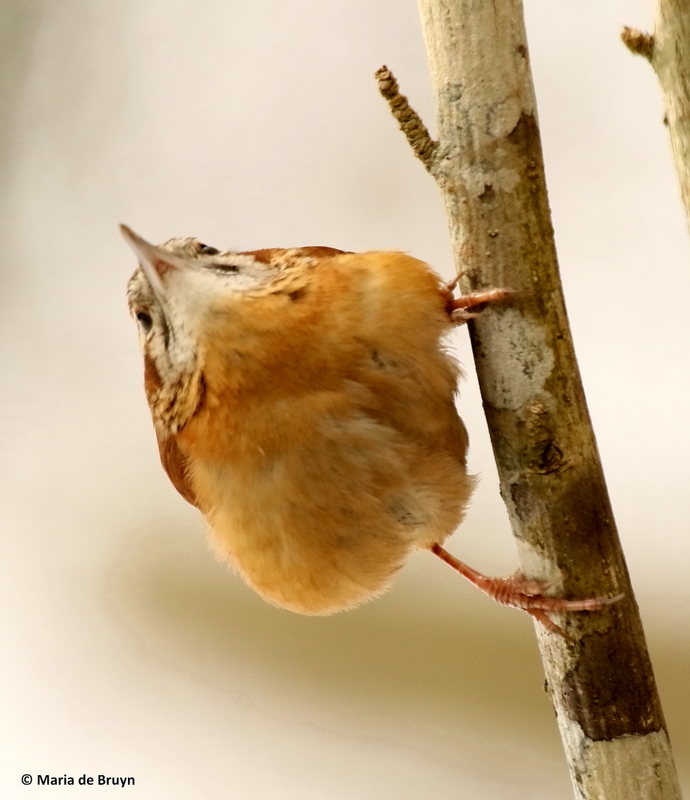 The effort of shaking its head also led it to protect its eye with the nictating membrane. 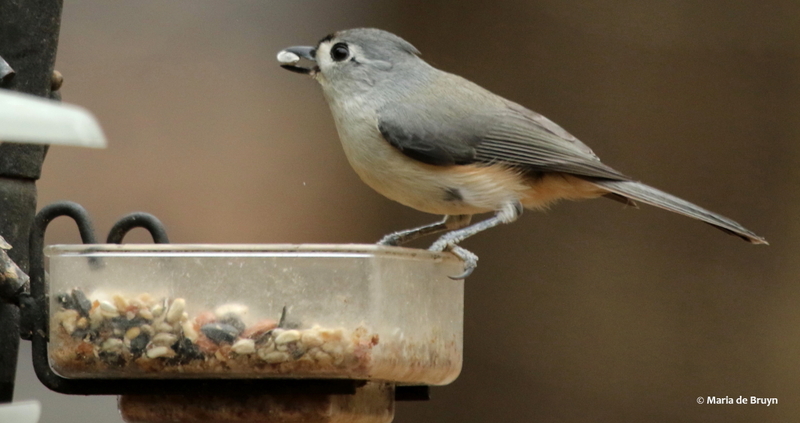 Because tufted titmice (Baeolophus bicolor) visit my bird feeders daily to get nuts and, to a lesser extent, seeds, I associate them completely with that type of diet. 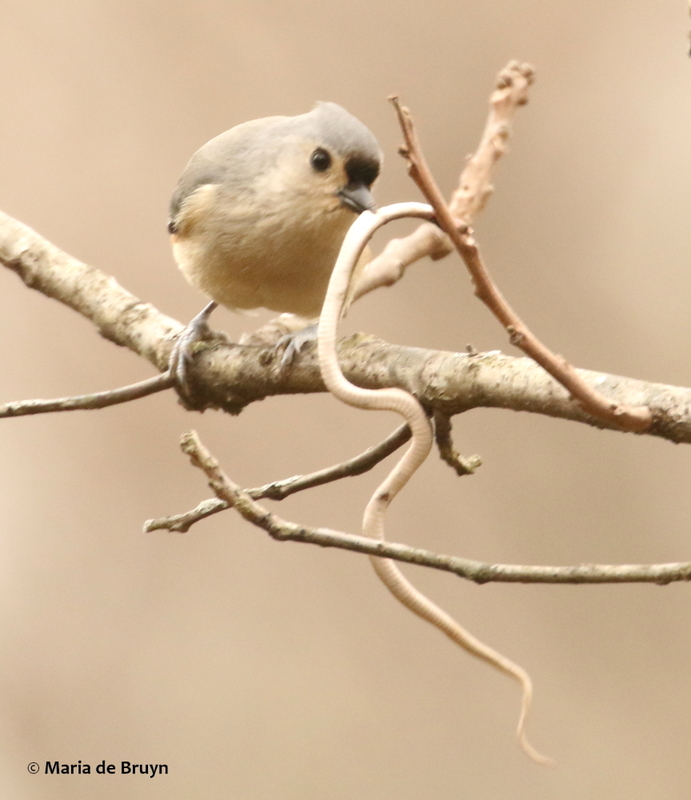 It was that assumption that made me do a double-take when I spotted a titmouse on a walk with a long spaghetti-like object dangling from its beak. 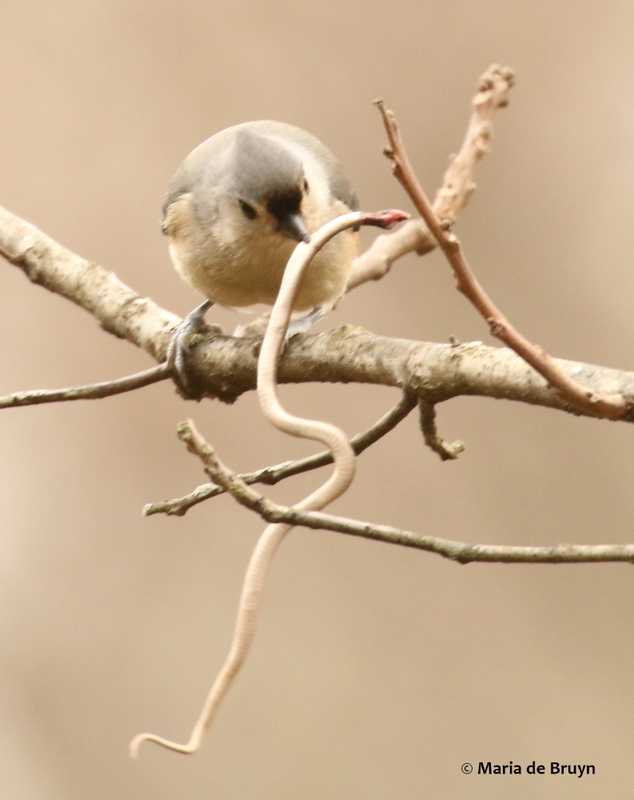 It didn’t seem like a grass stalk so when I lifted my camera to look through the zoom lens, I discovered it had a worm snake (Carphophis amoenus amoenus) in its beak – a finding that really did astound me. 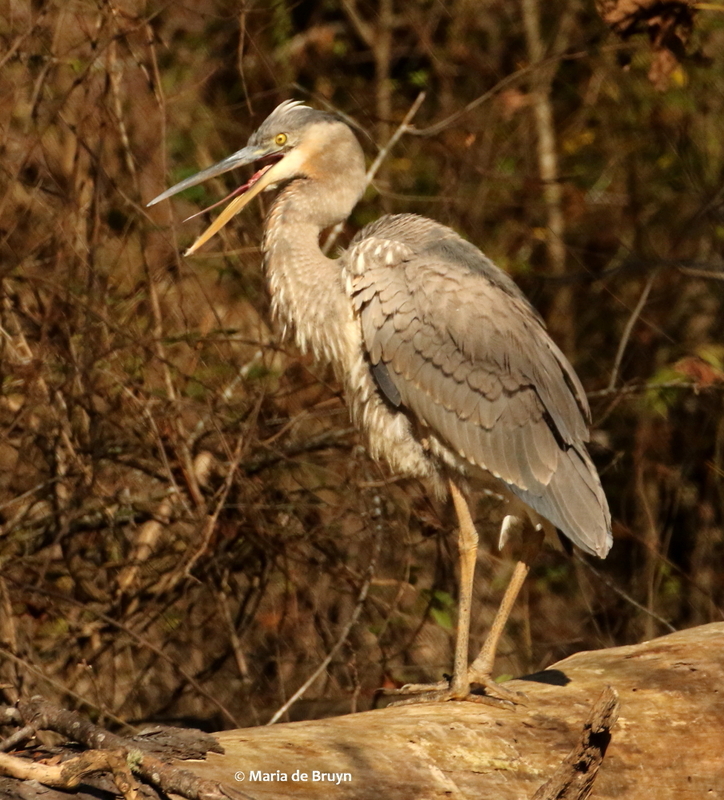 As I took photos, the bird finally flew further away and unfortunately dropped the reptile when it came close to a creek. 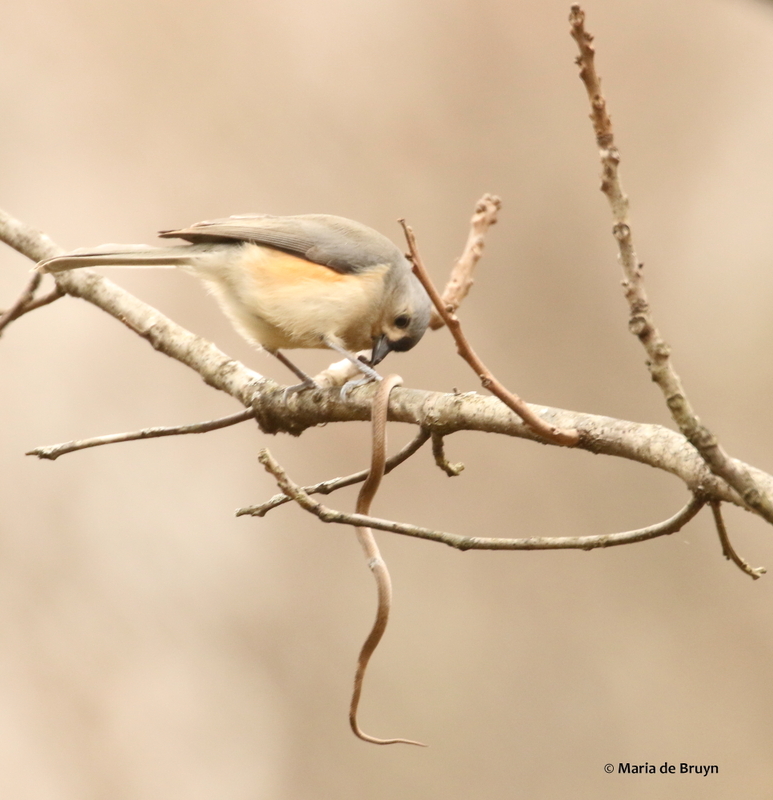 I felt a bit guilty, thinking I might have disturbed its meal but after waiting about 5 minutes, the bird suddenly flew up with the snake back in its beak! 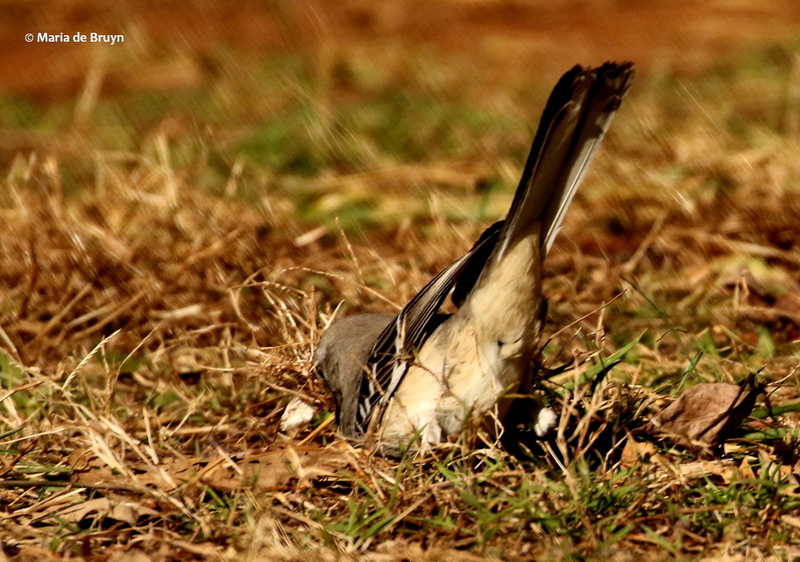 It obviously really wanted to hang on to that prize! 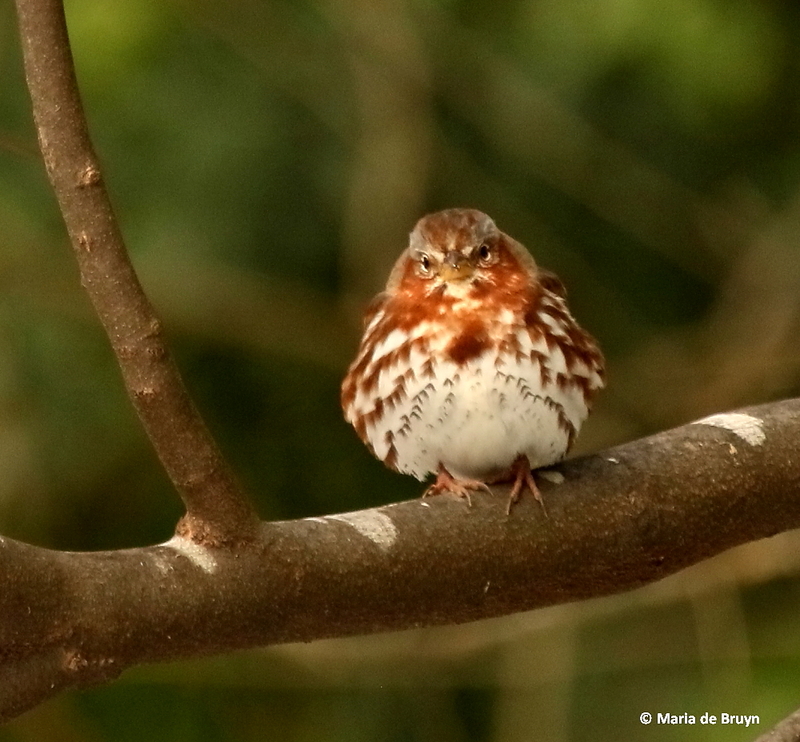 And now on to part 2 of my 2018 surprises – some more reptiles and amphibians, bugs and mammals! I thought I had published this blog in early February and just discovered that I had only saved a draft. 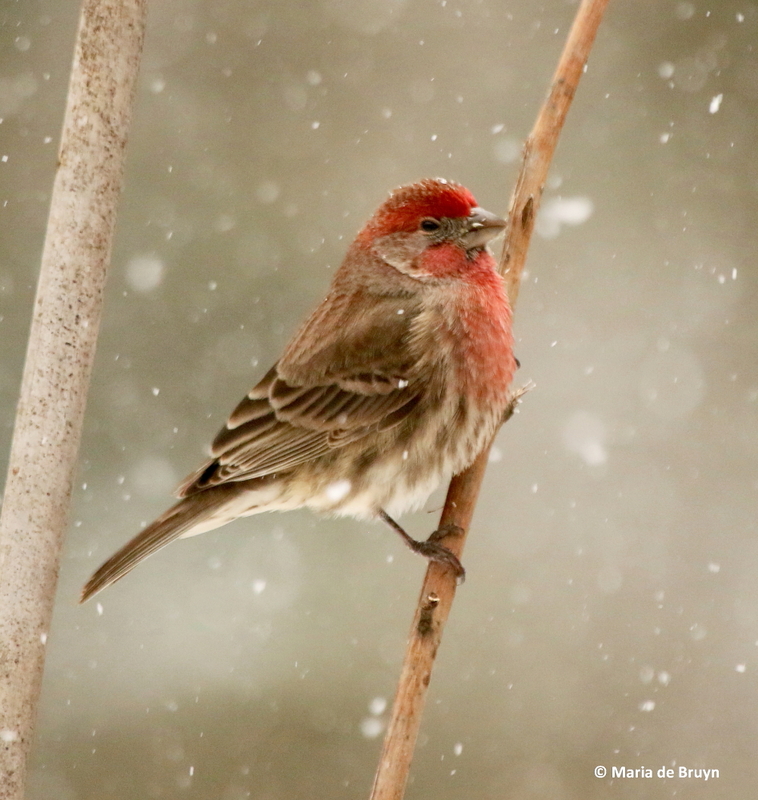 Since we had snowflakes last night (in April! 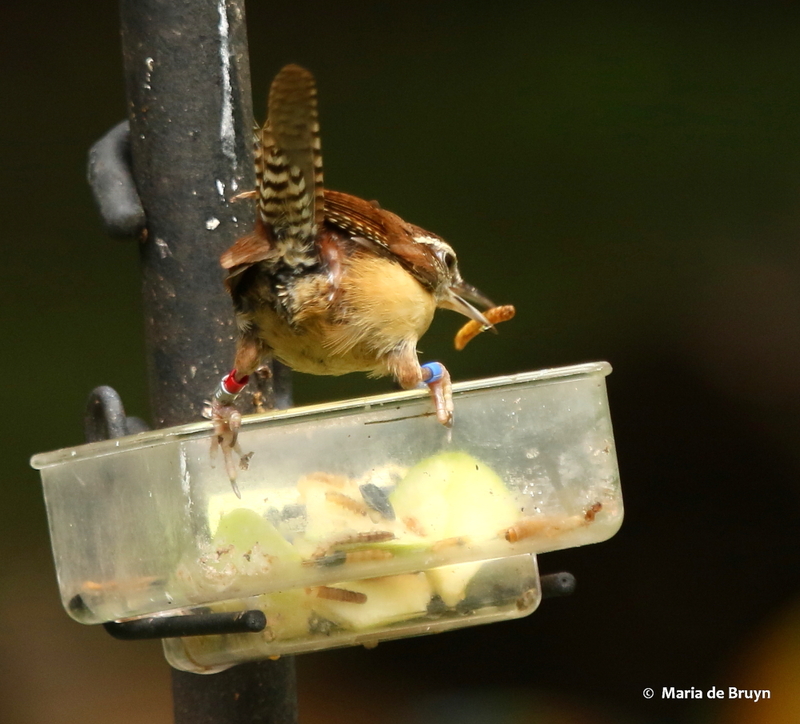 ), I’m going to go ahead and post this now – a break in the series about Costa Rica! 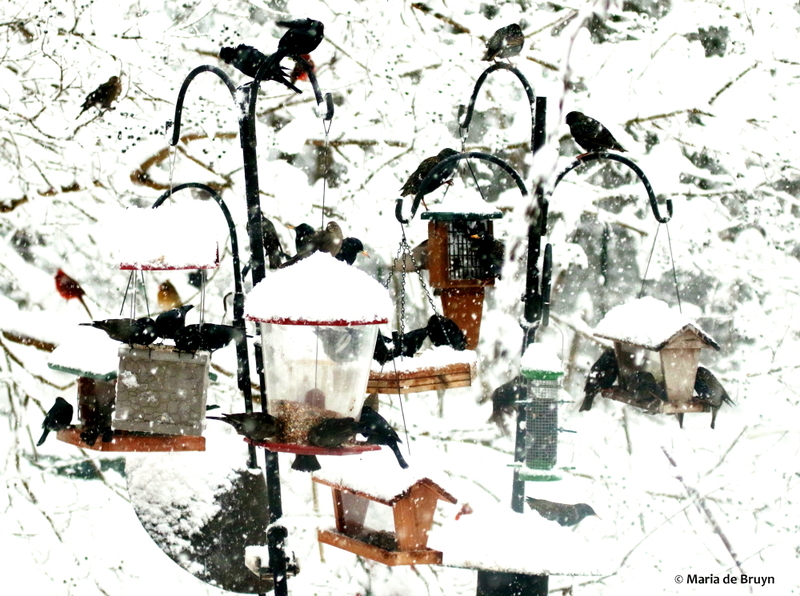 When the snow began falling during our day of one-foot accumulation, the feeders were inundated by some of the dark-colored bird species who tend to come in crowds. 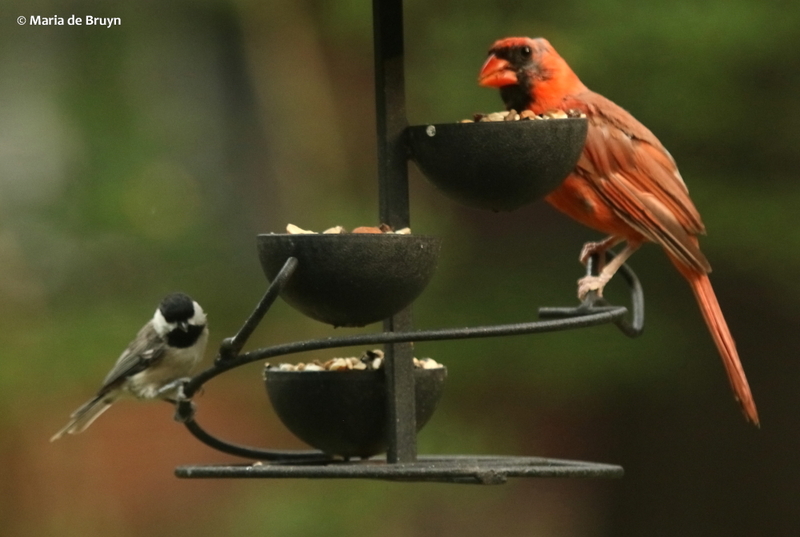 At first, they were peacefully sharing space. 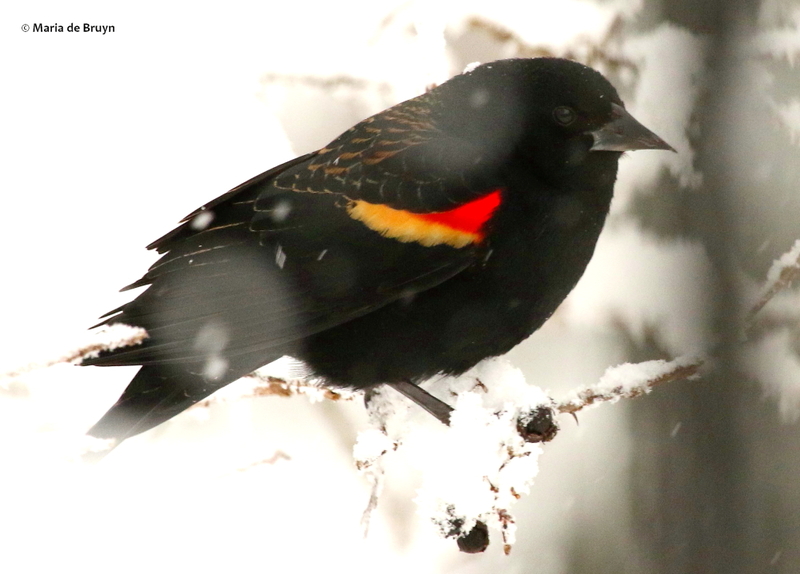 Although I sometimes have a couple dozen red-winged blackbirds (Agelaius phoeniceus) at the feeders, during the storm only one pair showed up for a brief visit and the other birds left them alone. 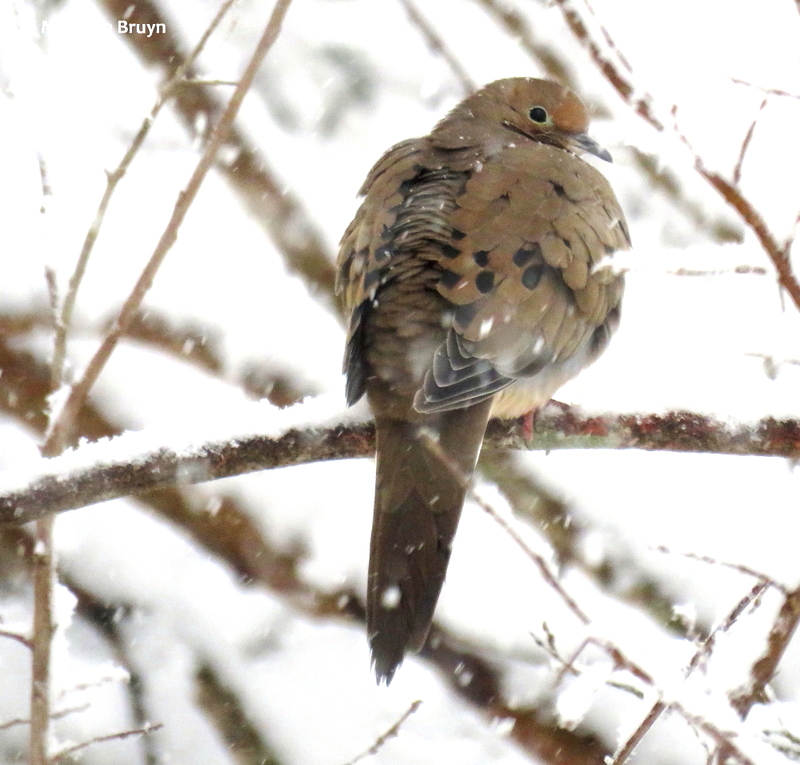 The mourning doves (Zenaida macroura) often share feeder space with other birds, including those that are smaller than they are. 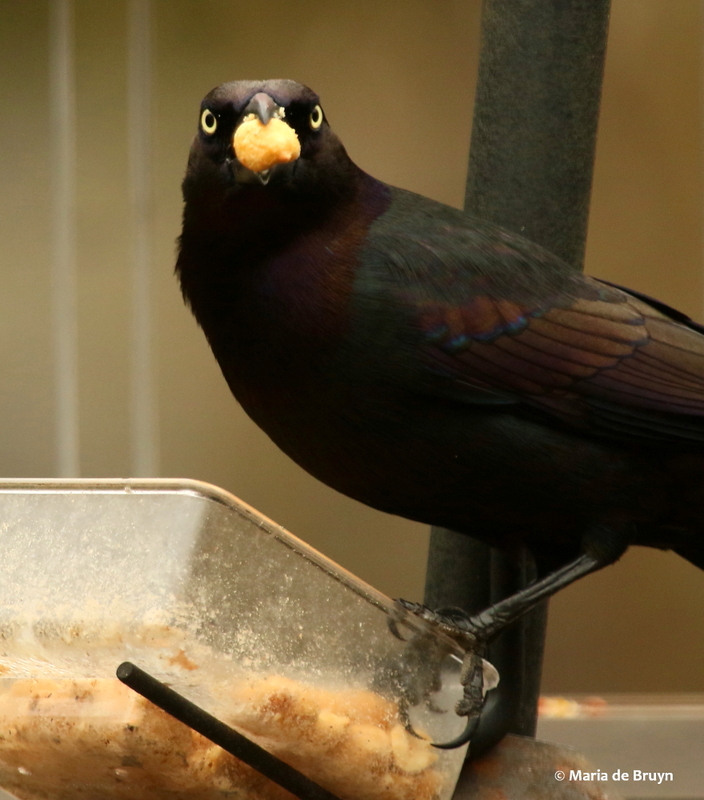 The common grackles (Quiscalus quiscula) are known to other people as domineering birds at the feeder, but those in my yard have always been polite, even though they seem to have a permanent expression that expresses anger. 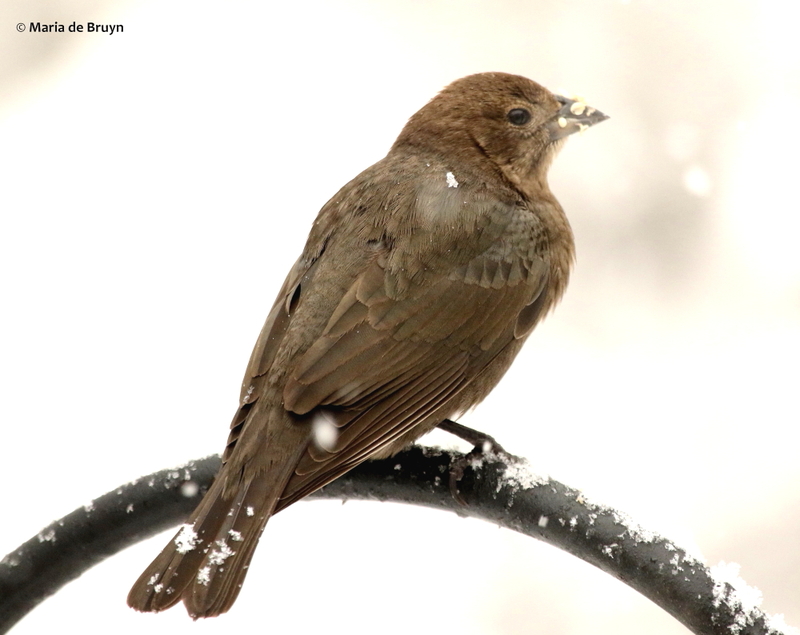 The brown-headed cowbirds (Molothrus ater) sometimes share space nicely and sometimes fuss at one another as they vie for a good perch. 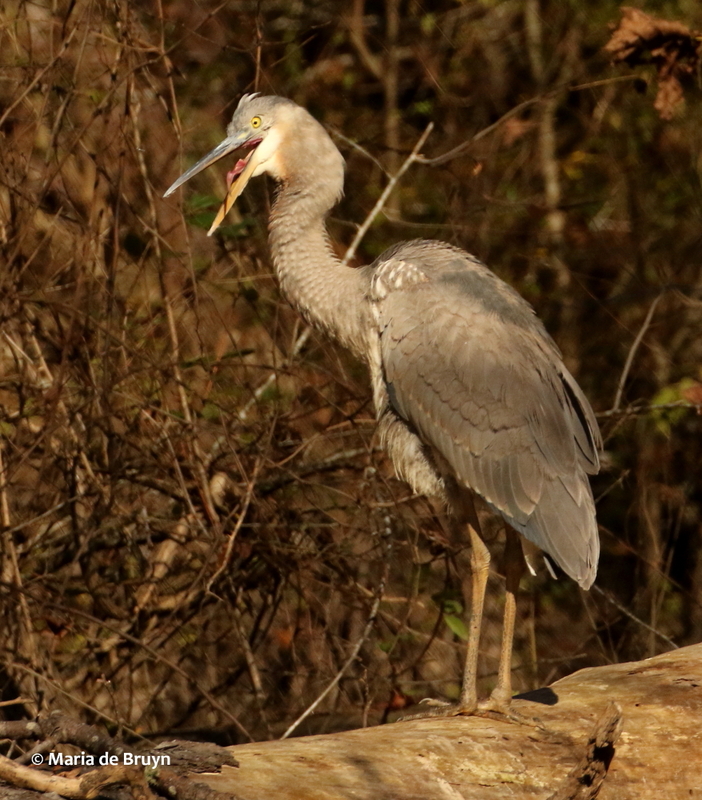 They don’t try to chase off other species though and are not apt to “yell” at other birds. 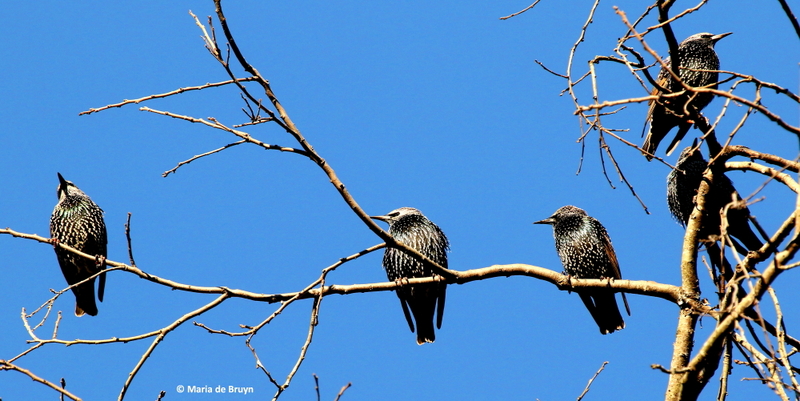 The birds who do “yell” are the European starlings (Sturnus vulgaris). 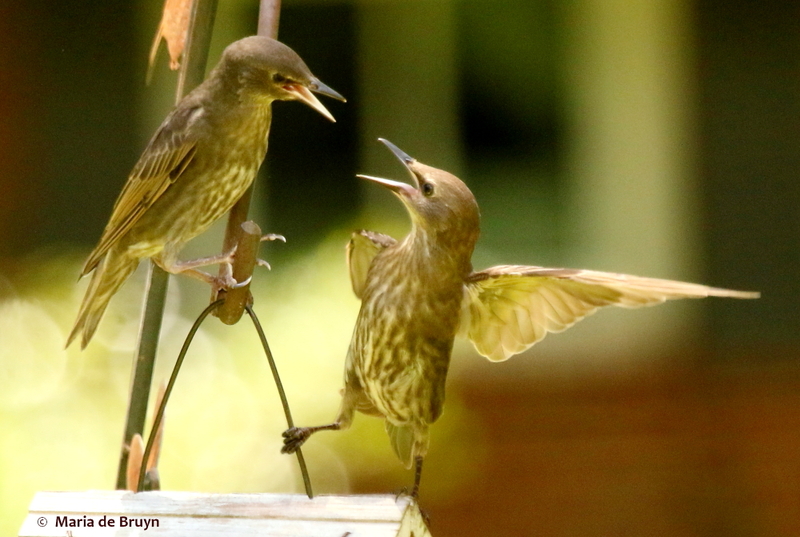 Young ones yell at their parents after fledging, begging to be fed. 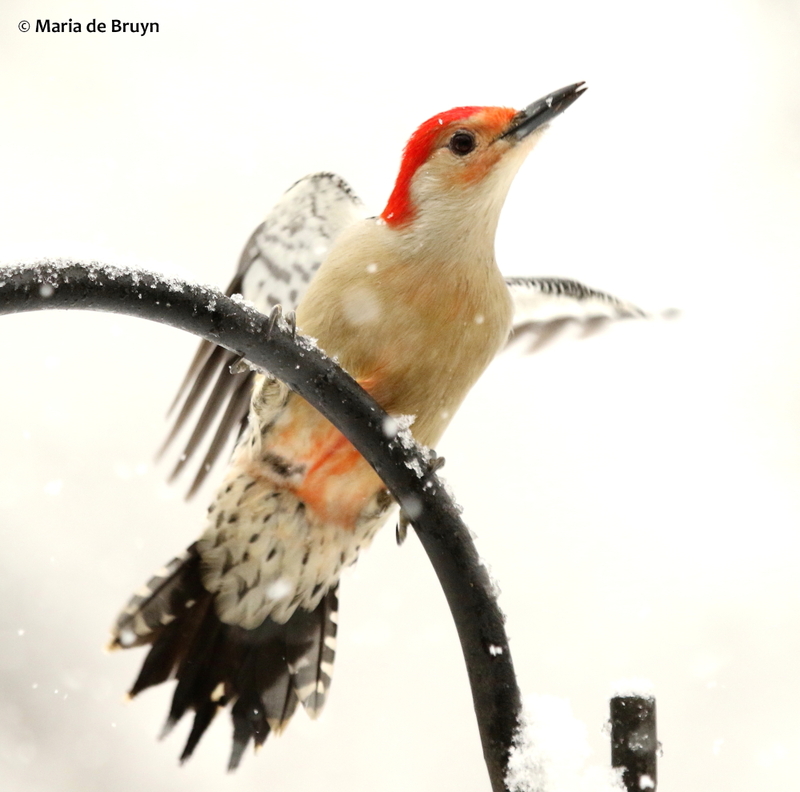 Adults yell at each other when they are trying to all crowd together onto a feeder. And adults yell at other species to drive them away so they can have all the space for themselves. 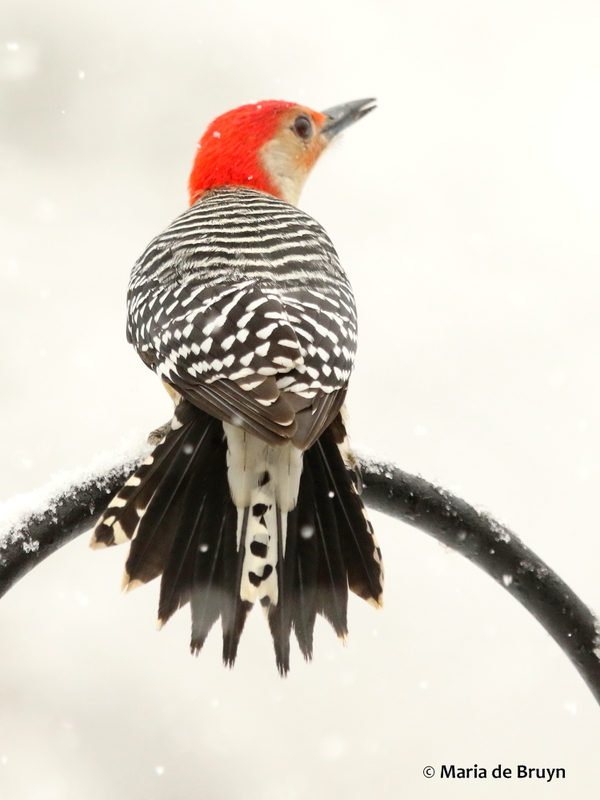 At my feeders, however, they have found their match in the male red-bellied woodpecker (Melanerpes carolinus). 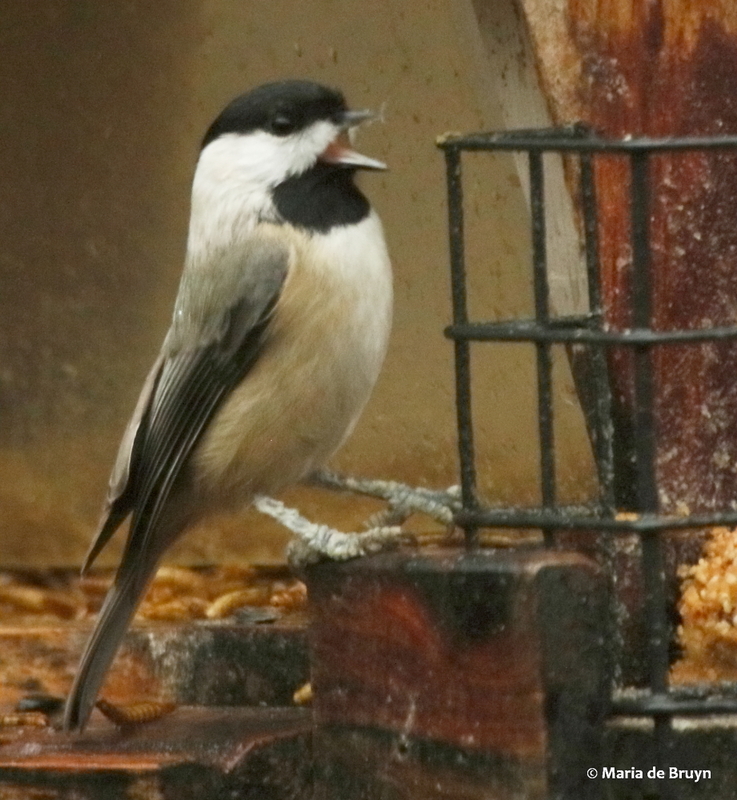 One day, I watched as they managed to intimidate him for a few minutes, but he then returned to the feeder and refused to give up. 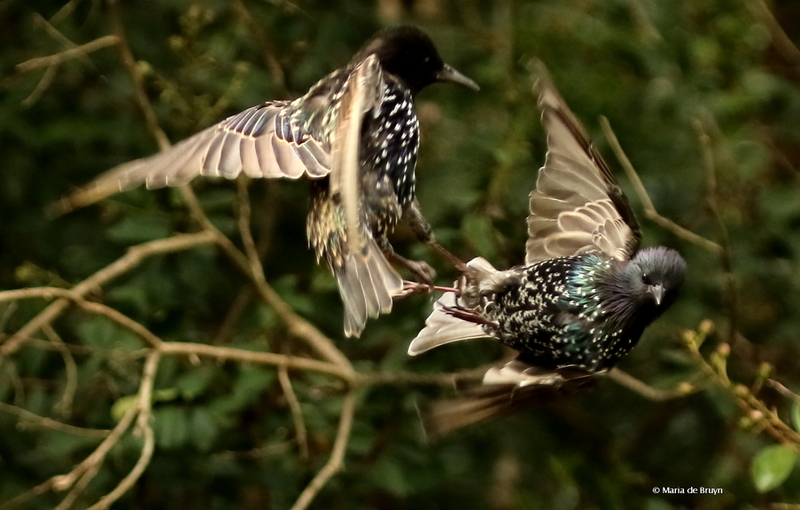 Now he is no longer frightened of them and stands his ground when a starling does its best to make him move. 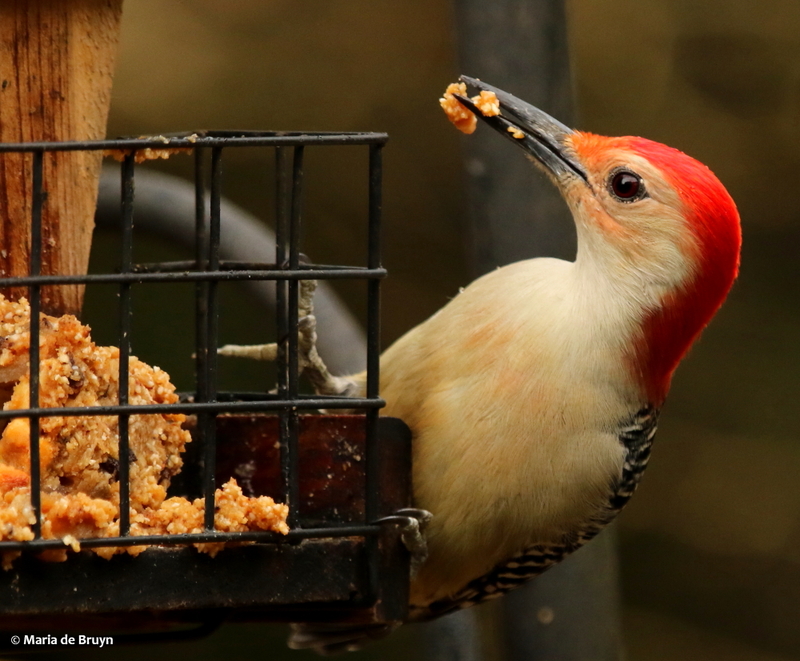 It turns out that studies have shown that the red-bellied woodpeckers are the birds most apt to resist attempts by other birds to displace them from feeders. 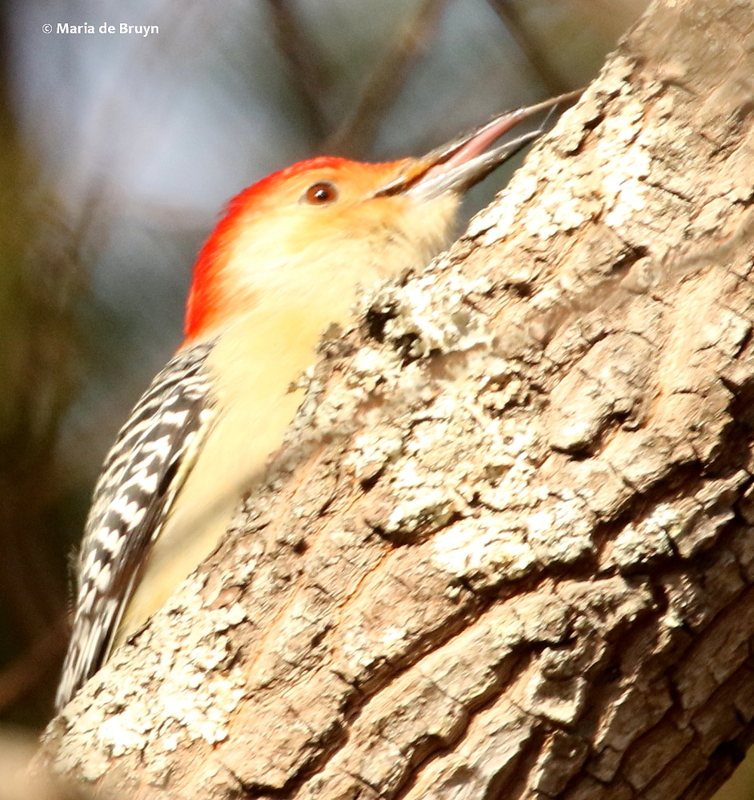 The red-bellied woodpecker also was not intimidated by me at one point. 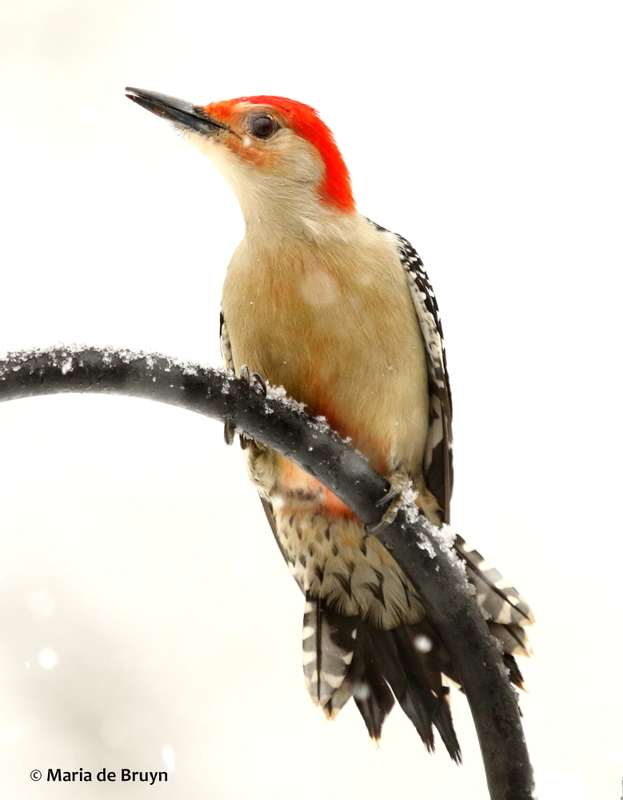 He doesn’t like it when he flies in and notices at the last moment that I am sitting or standing on the porch; often he will swerve away and wait for me to leave. 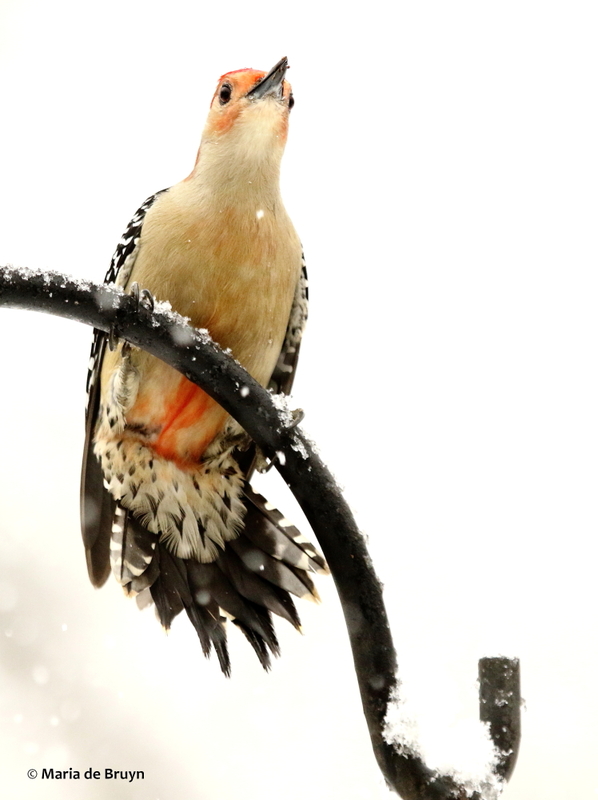 During the snow storm, however, he decided to display his displeasure with my close presence, both from a frontal and dorsal view! 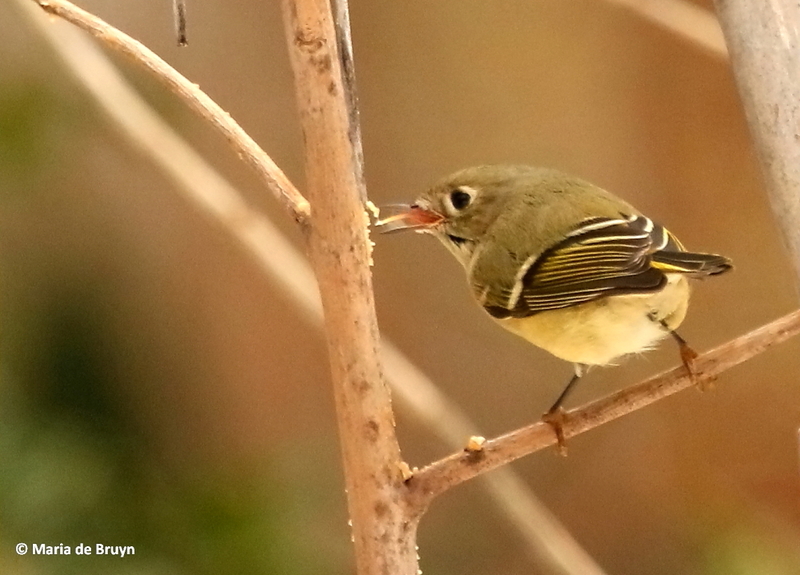 I guess that the little bird spats do make for sometimes more interesting birding observations. 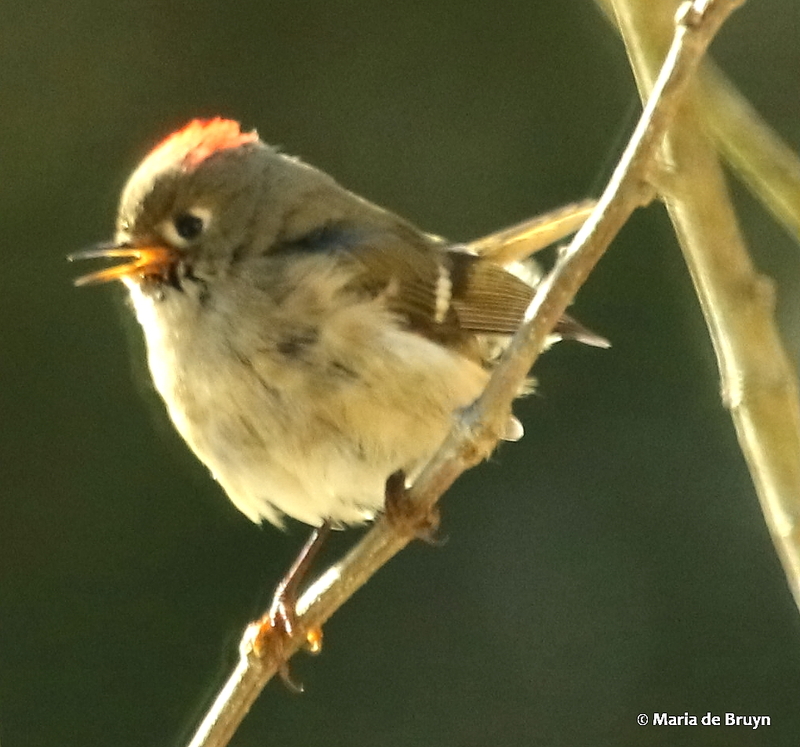 Seeing the tiny ruby-crowned kinglet (Regulus calendula) warning off a rival a few days before and after the snow melted did show off a gorgeous and brave little bird. 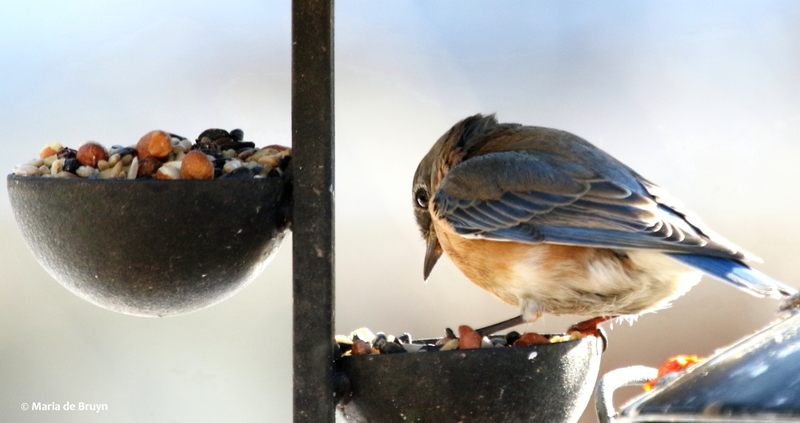 I’m looking forward to seeing what the springtime observations of animal behavior will reveal. 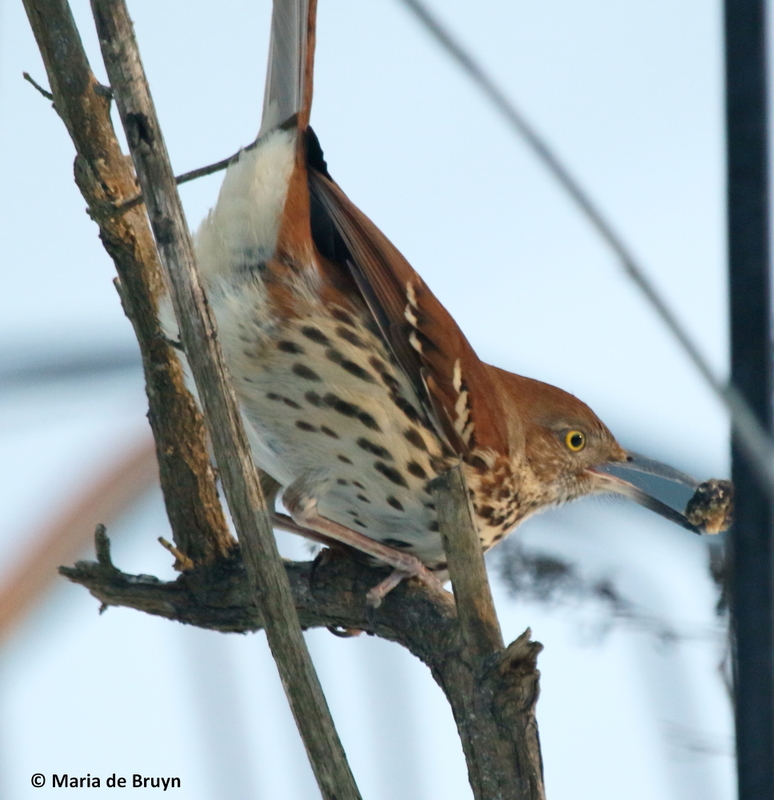 A primary source of nutrition for many birds is nuts.This high-calorie food provides them with dietary fat, which can be especially welcome during the colder months. 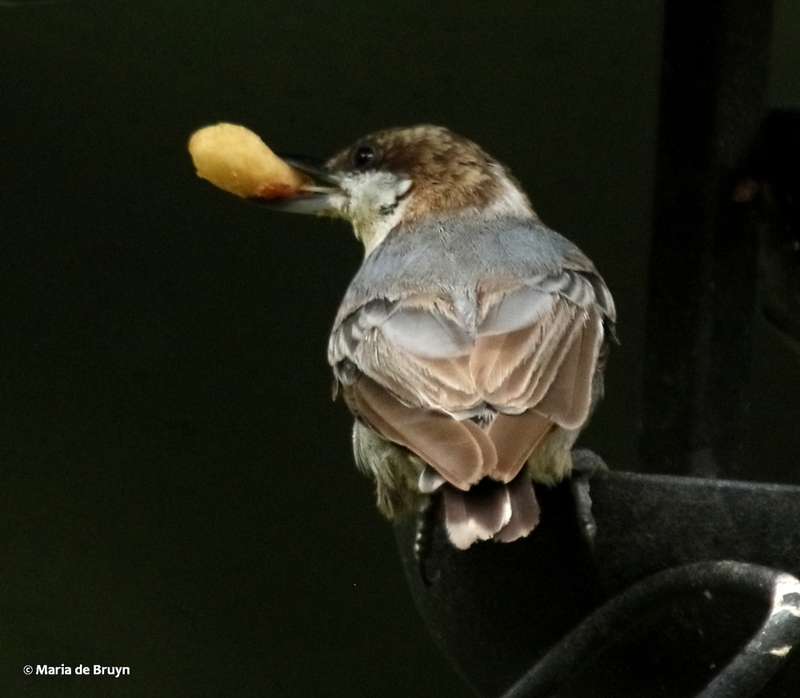 As nuts ripen, you can see the birds flying by, carrying acorns and beechnuts, as well as seeds of various kinds. 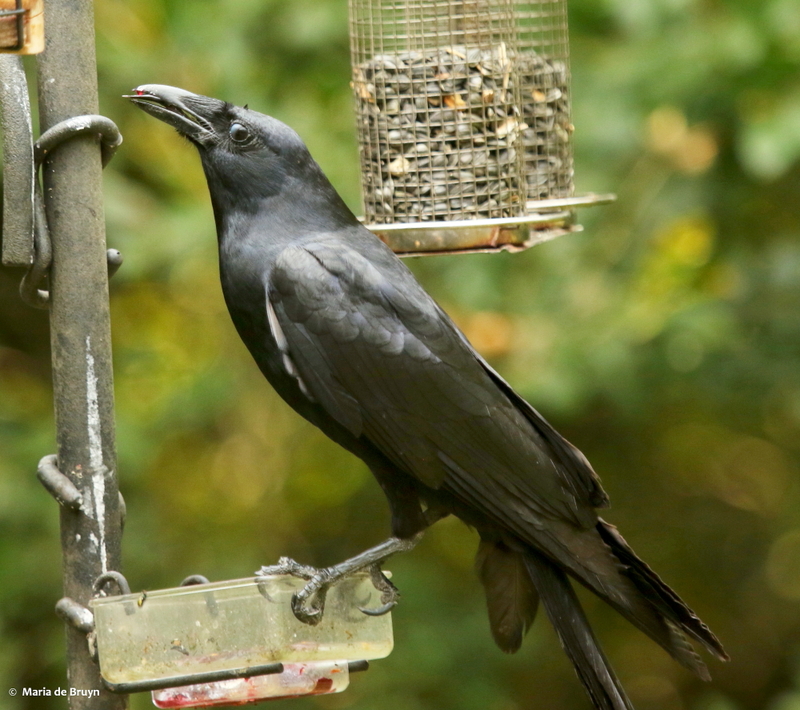 Some birds are especially suited to eating nuts with their thicker, cone-shaped bills, which are shaped to help them crack open pods and seed cases. 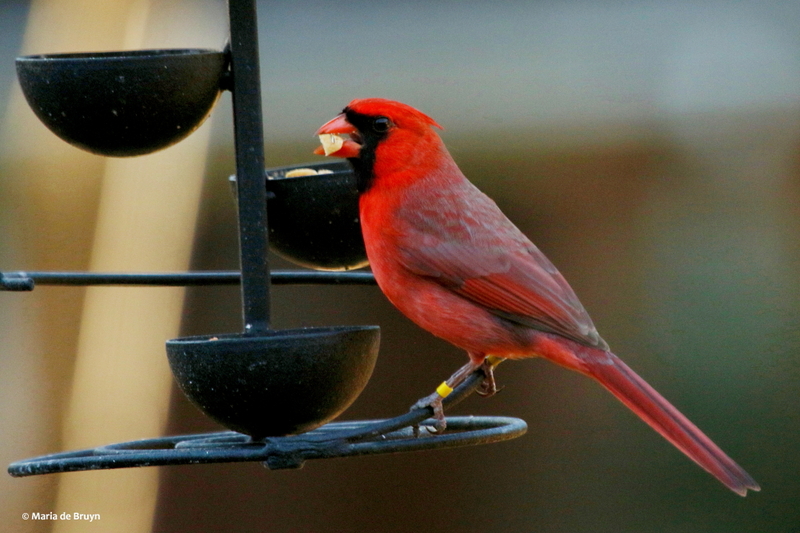 Northern cardinals (Cardinalis cardinalis), sparrows, grosbeaks, finches and woodpeckers are seed and nut lovers. 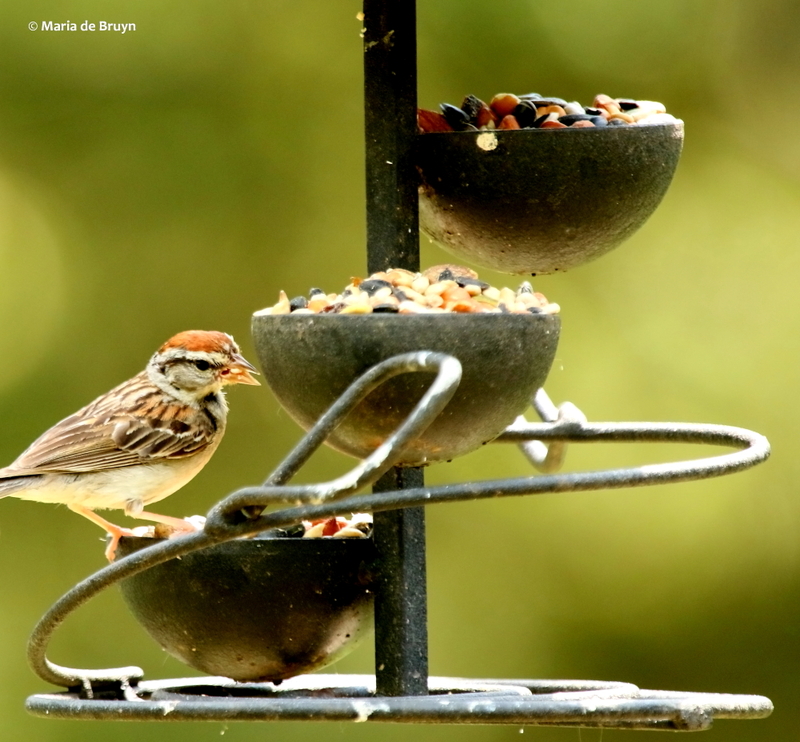 I had been lax in providing my yard birds with these culinary treats except for sunflower seeds and the seed pods in my yard trees. 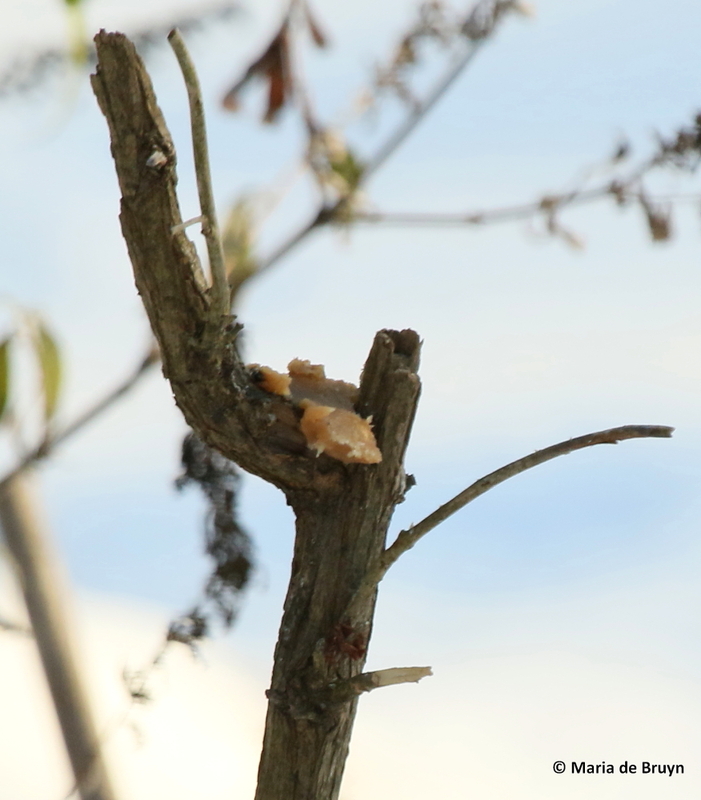 So one day early last year, I purchased a nut and seed holder and proceeded to give them peanuts, which are not actually nuts but the seed of a legume (Arachis hypogaea). 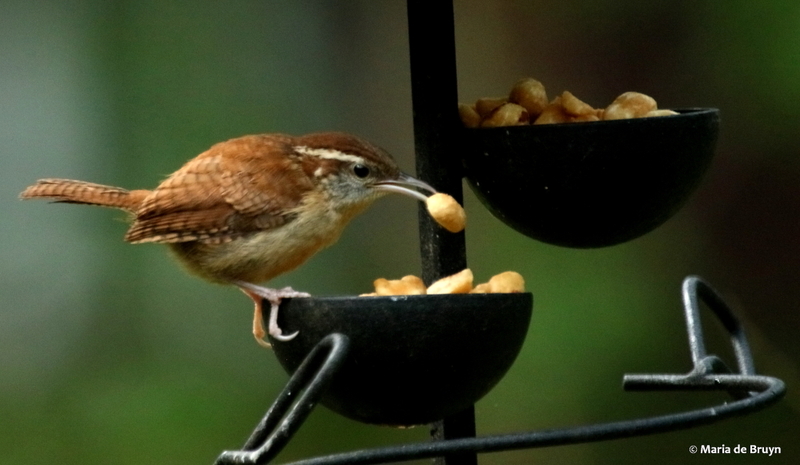 This makes no difference to the birds like the Carolina wren (Thryothorus ludovicianus) of course. 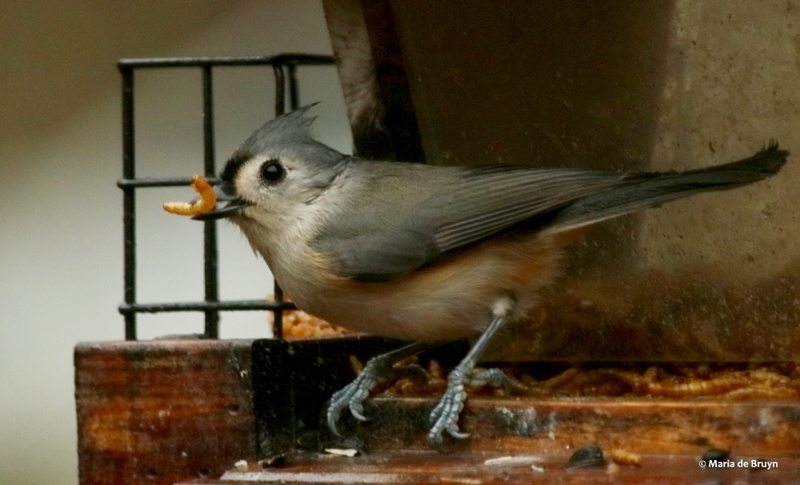 I first tried peanuts in the shell and an occasional blue jay and tufted titmouse would stop by. However, they didn’t seem to want to put much time into removing the nuts from the shells and I didn’t really want the shells littering the ground either. 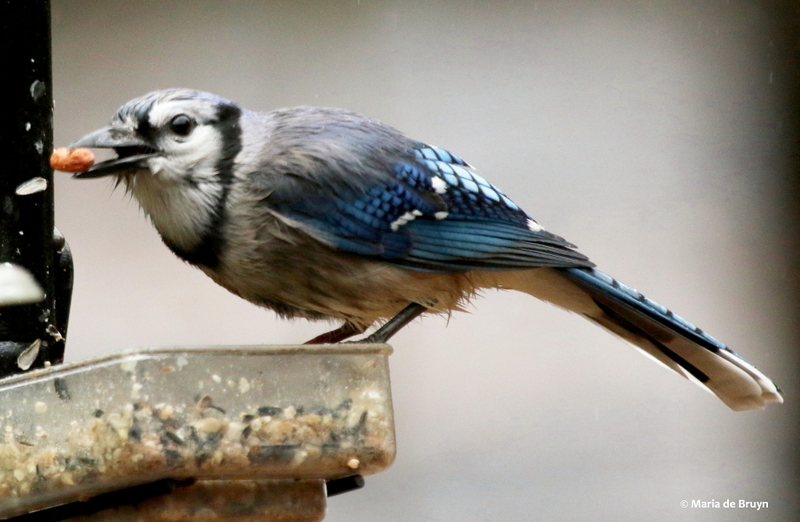 Then in the spring I put out some shelled peanuts from a container I’d bought for my own consumption and the avian visitors were delighted. Reading about peanut feeding informed me that I should avoid giving salted peanuts. I couldn’t readily find unsalted ones at the grocery store, so I began removing the salt, either by shaking the nuts in a paper bag or by washing off the salt. 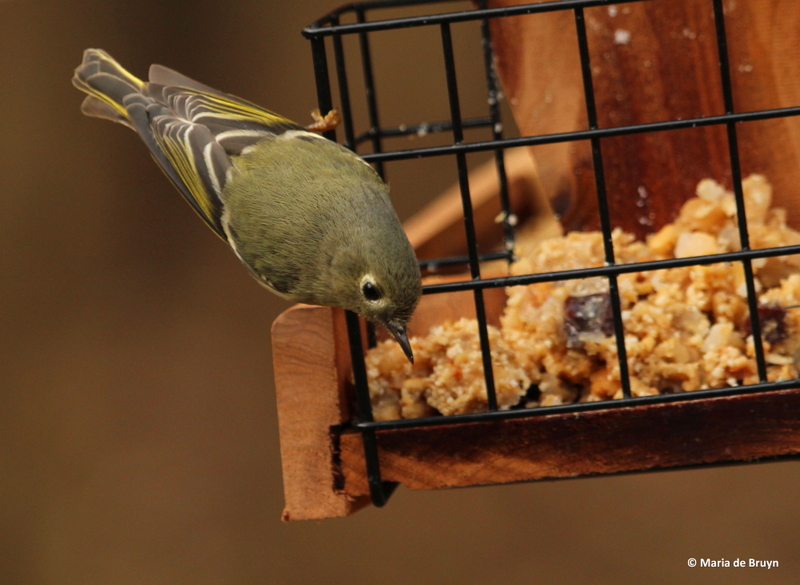 Before they left for the summer, the yellow-rumped warbler (Setophaga coronata) and ruby-crowned kinglet (Regulus calendula) tried the peanuts, too. 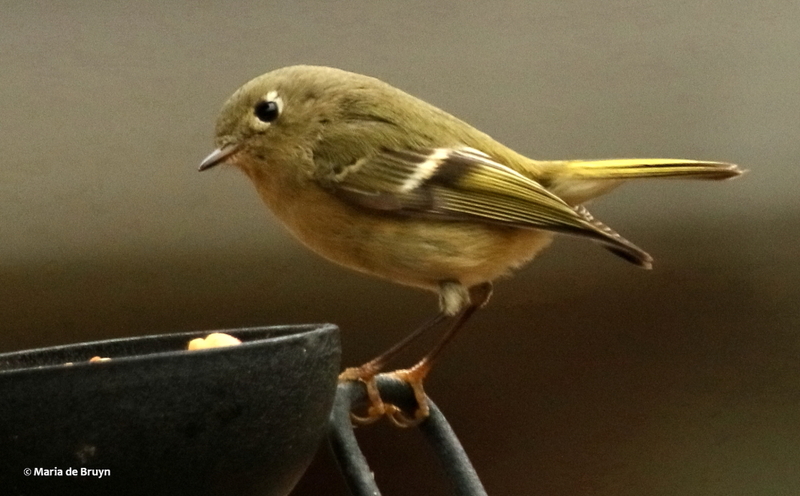 Sometimes I wondered if the kinglet was also not looking for insects around the peanut feeder. 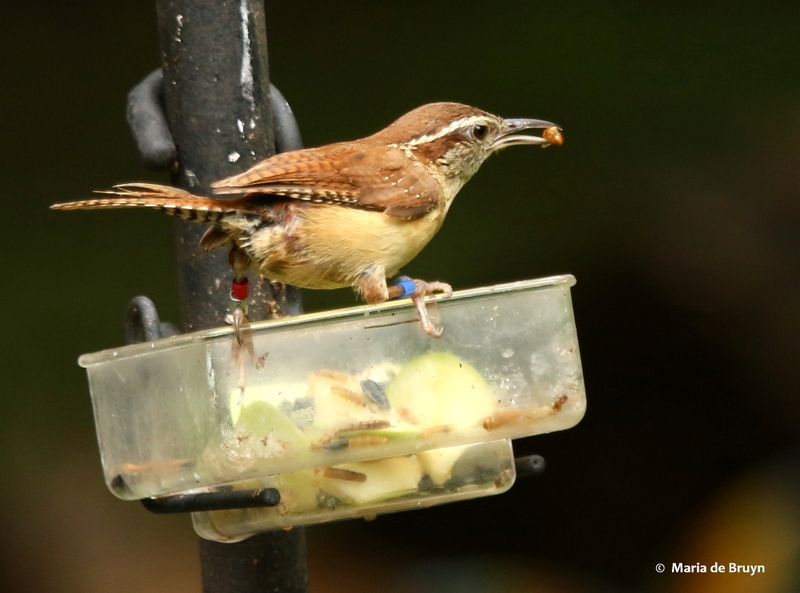 My choice to provide nuts was a big hit; I was rewarded with a procession of individuals of varied species who came by to quickly gulp or carry off a tasty nut. 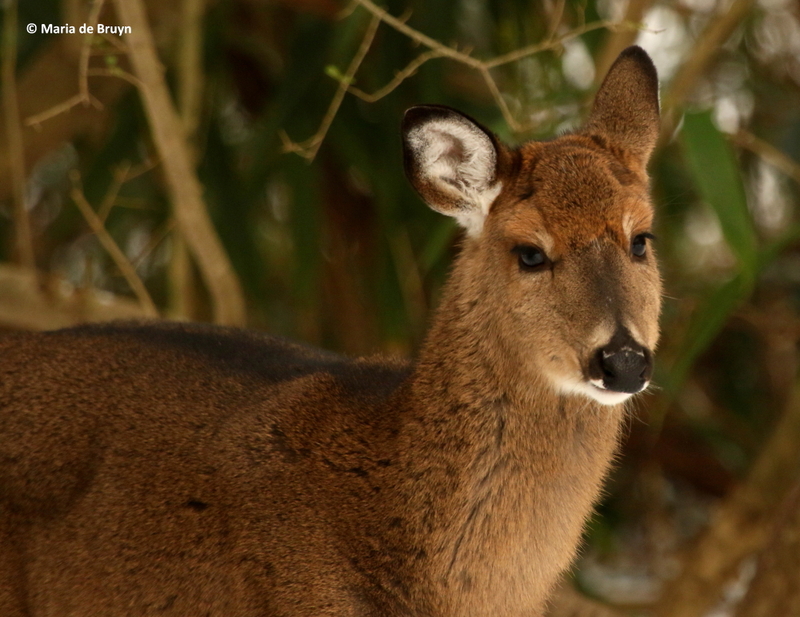 Some are pictured below – they came at different times of the day. 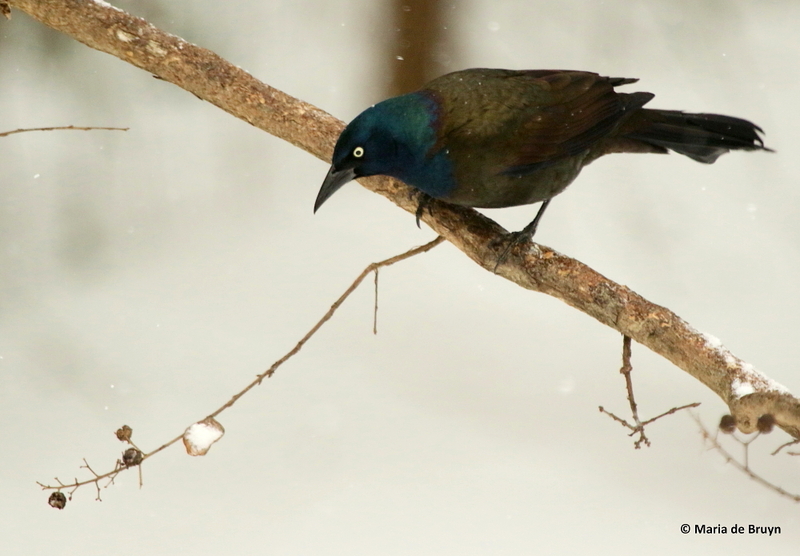 The common grackles (Quiscalus quiscula) will sometimes break down the nuts (and are quite messy about it, compared to the chickadees and titmice), but they will also swallow the treats whole. 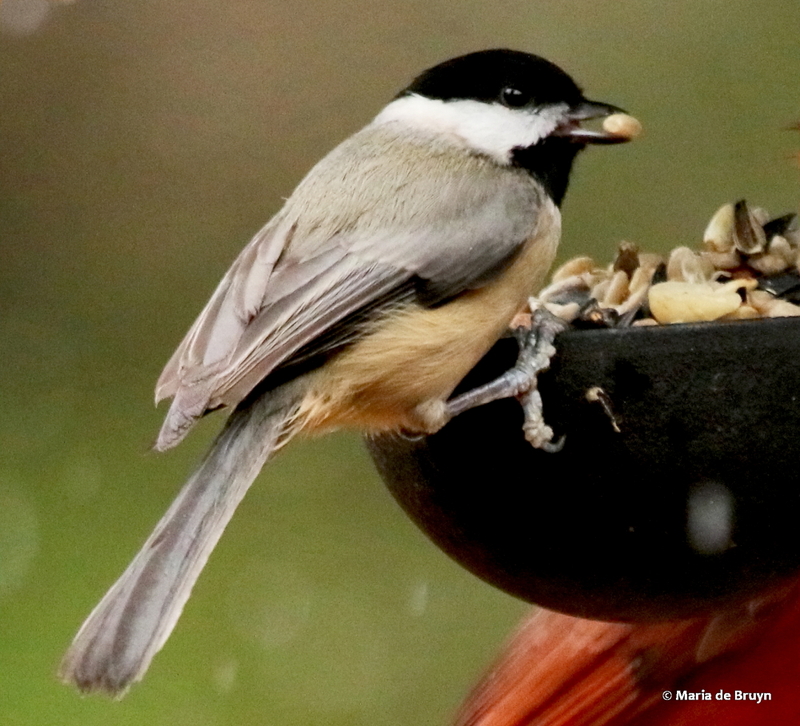 Others are intent on breaking the peanuts into smaller pieces that are easier to get down; this seems especially true for the smaller birds like the Carolina chickadee (Poecile carolinensis) below. 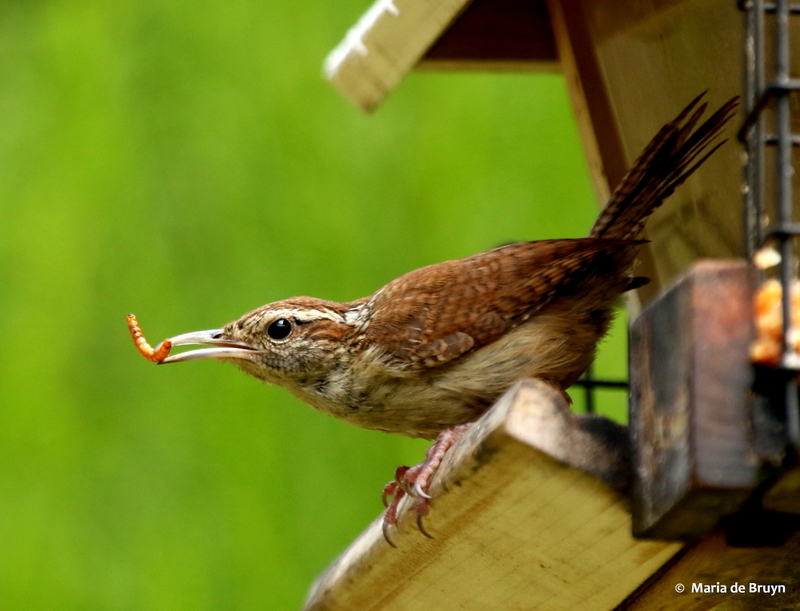 Here we also see Riley, my banded Carolina wren, enjoying a treat. 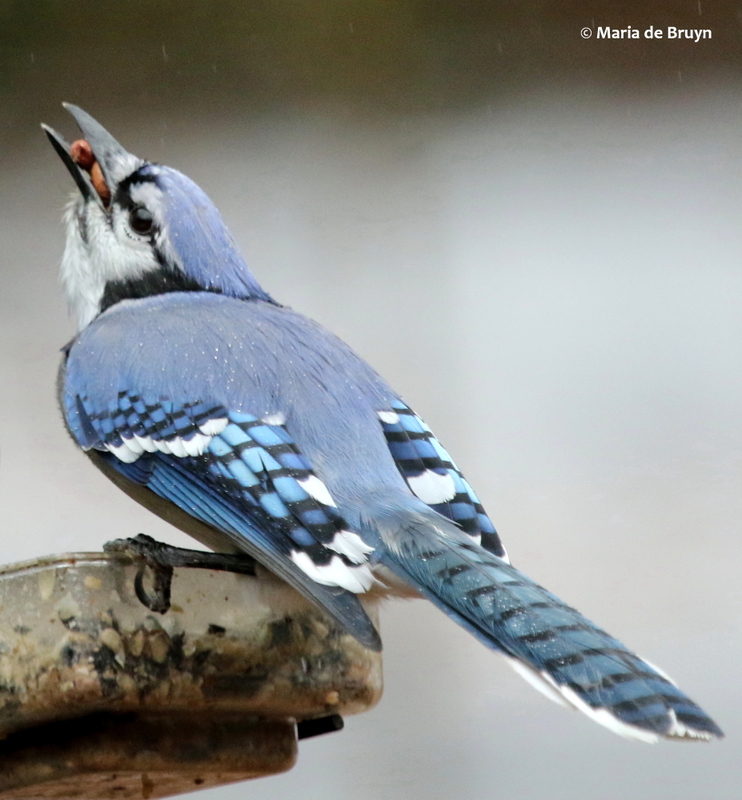 The blue jays (Cyanocitta cristata) often gulp down some nuts quickly and then try to carry off several nuts at a time. 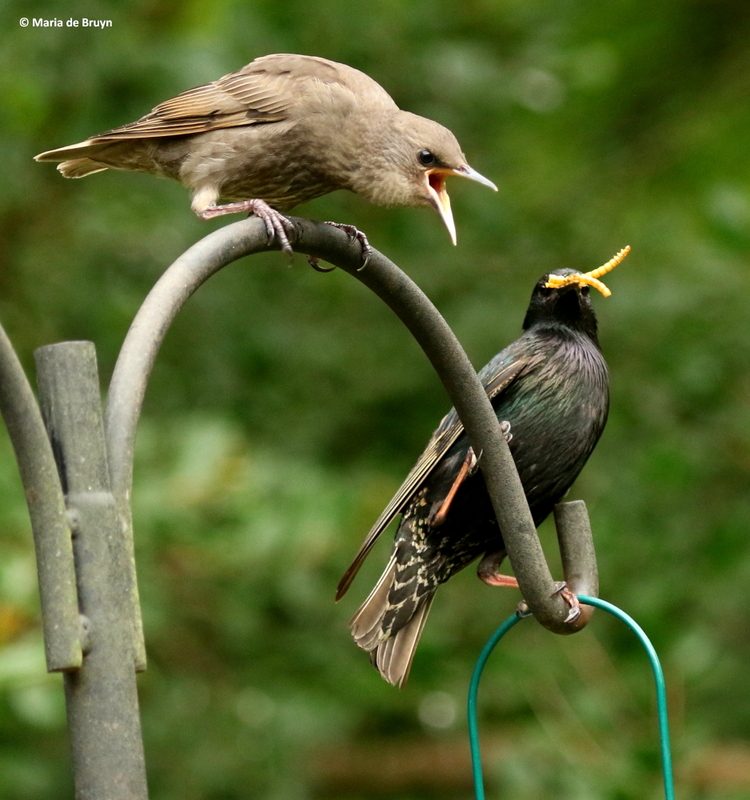 One good thing about the peanuts is that thankfully the starlings (Sturnus vulgaris) and brown-headed cowbirds (Molothrus ater) don’t appear fond of them (they gulp down the dried mealworms, however, as if that food is going out of style). 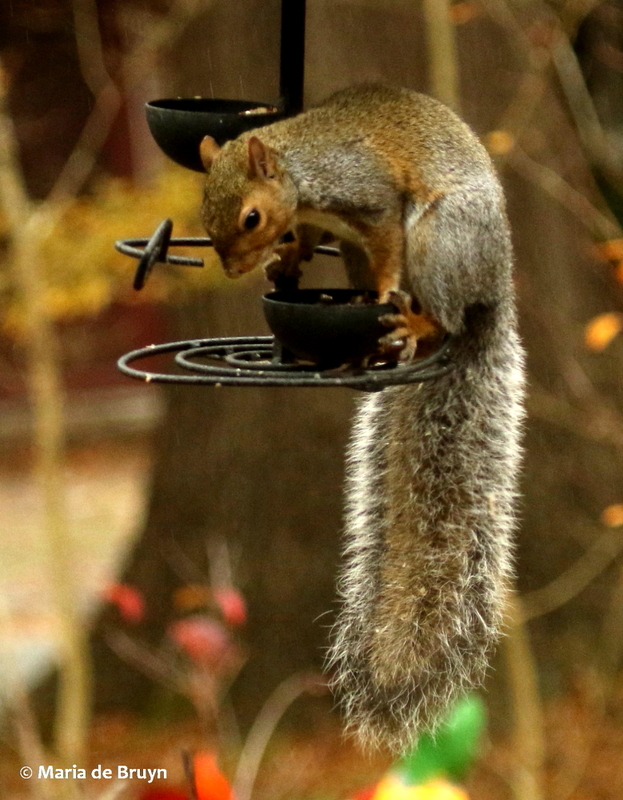 One will occasionally sample a nut, but they never seem to want a second. 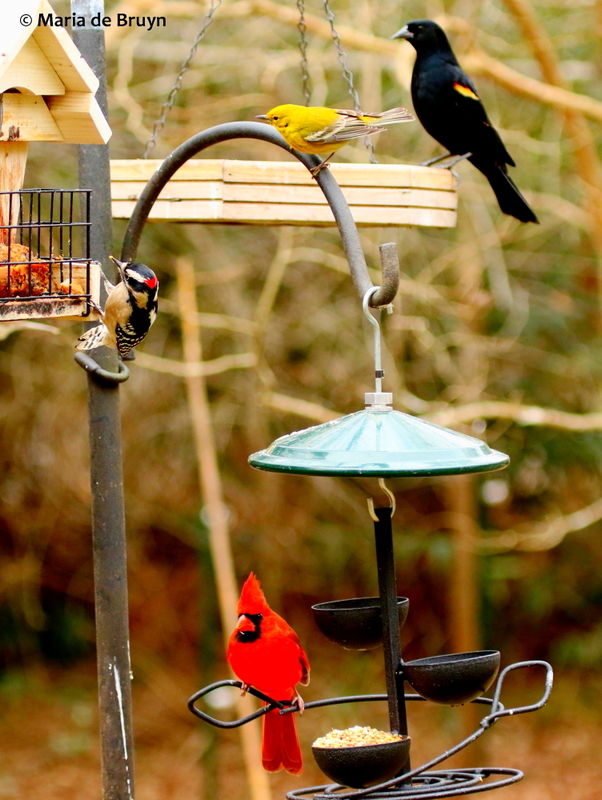 As time passed, I realized that the peanut feeding strategy was rewarding me with frequent avian visitors, but was also rather costly. 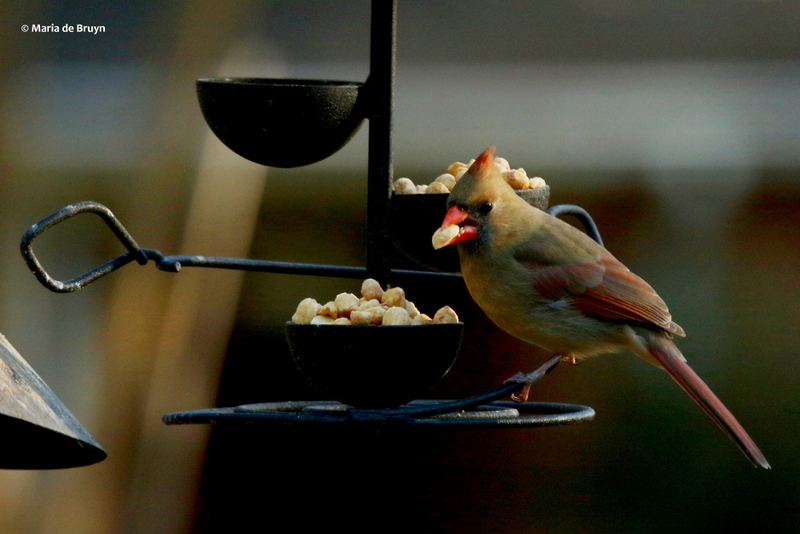 In the autumn, I began putting out a less expensive fruit and nut mix. 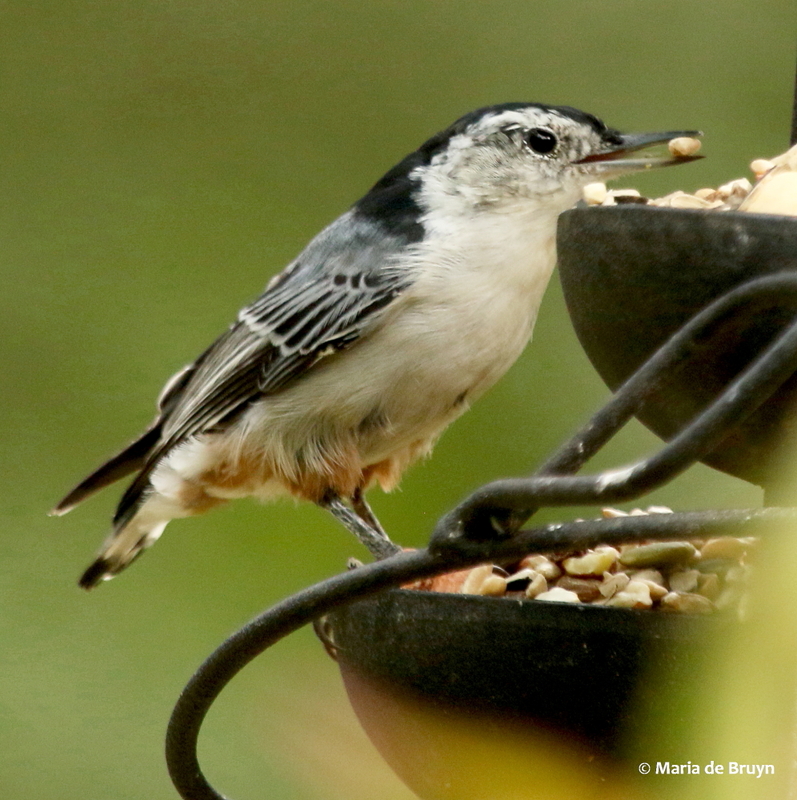 This has also proved very popular and various species of birds are willing to share space at the feeders. 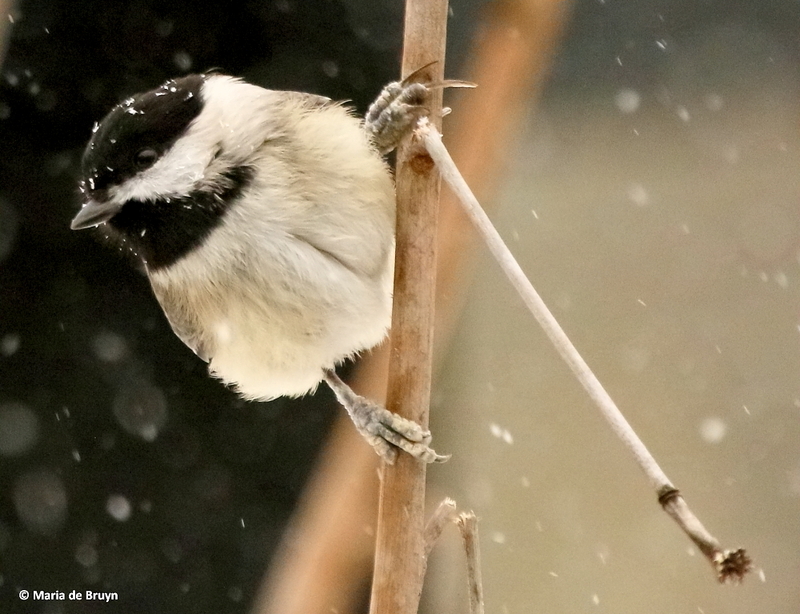 The chickadees especially will feed alongside others, like the house finches and Northern cardinal below. 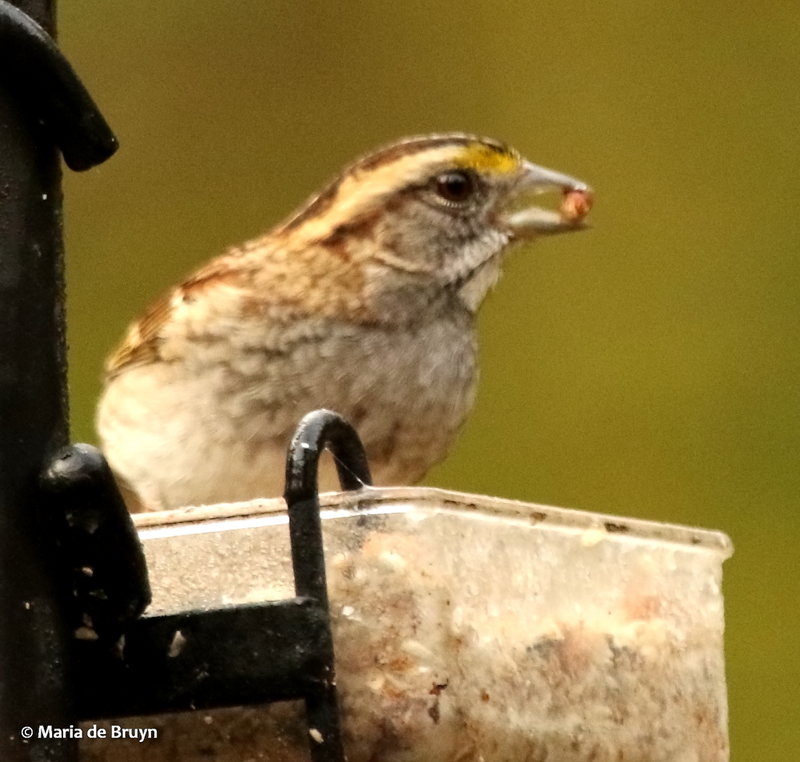 Species that usually forage on the ground, like the white-throated sparrows (Zonotrichia albicollis), also make occasional forays to the nut feeder. 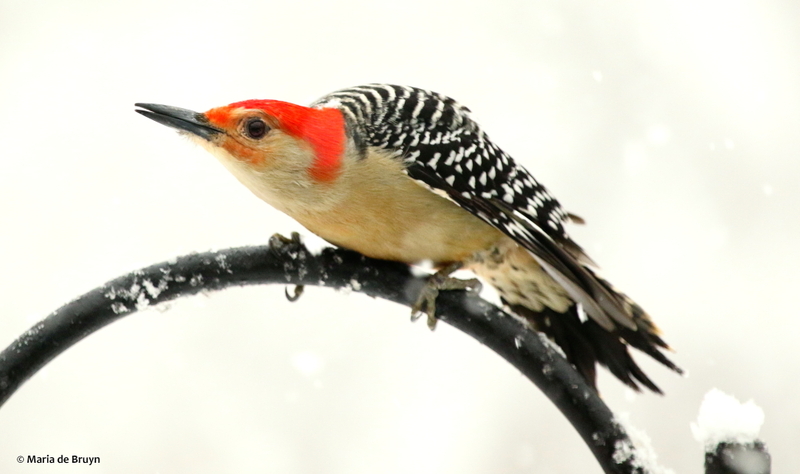 When the nut feeders are empty, it’s not uncommon to see birds sitting atop them; when they see me, some will call out, as if saying, “Hey, fill up that feeder, please!” And I usually accommodate them, especially when it is very cold, as has been the case the first days of 2018 – we have had a record-breaking stretch of days in which the temperature did not rise above freezing, an unusual occurrence for our southern state of North Carolina. 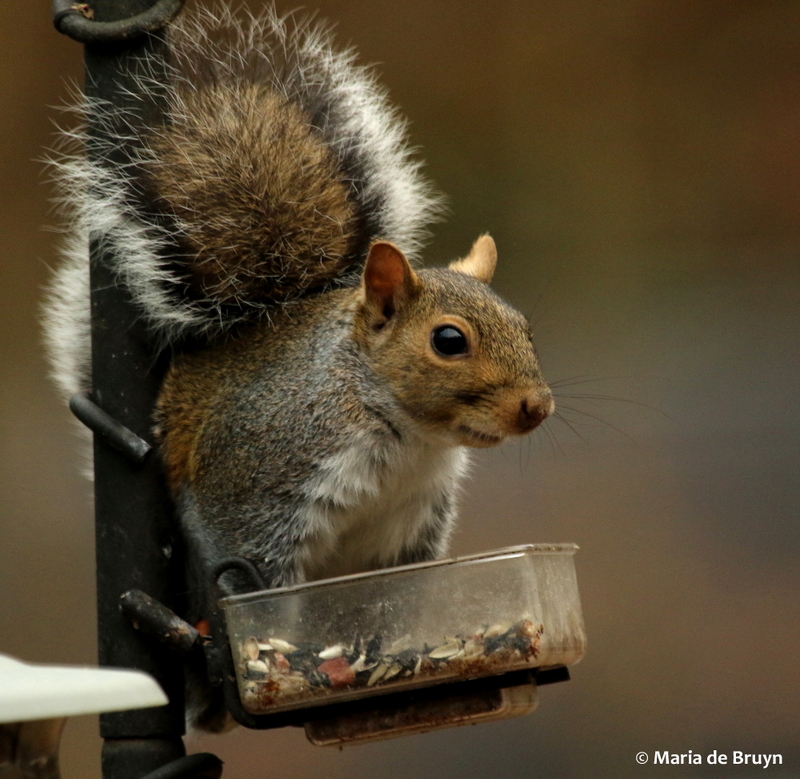 The nut feeders have also been very attractive to the resident Eastern gray squirrels (Sciurus carolinensis), one of whom has been VERY persistent in devising ways to get onto the feeders. 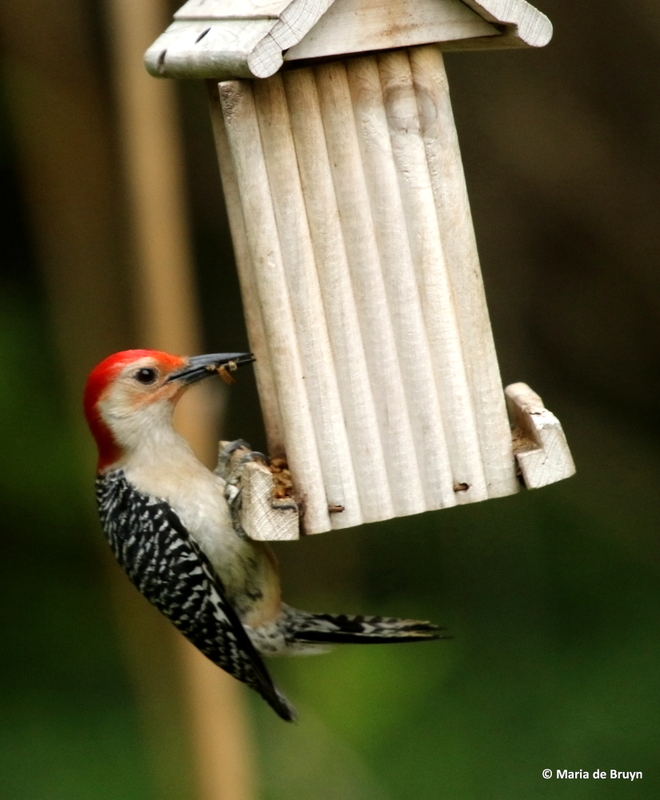 Each time s/he succeeds, I change the position of the feeders or stumps and branches nearby. Currently, that clever rodent hasn’t been able to get up there. In compensation, I occasionally throw a handful of nuts on the ground. 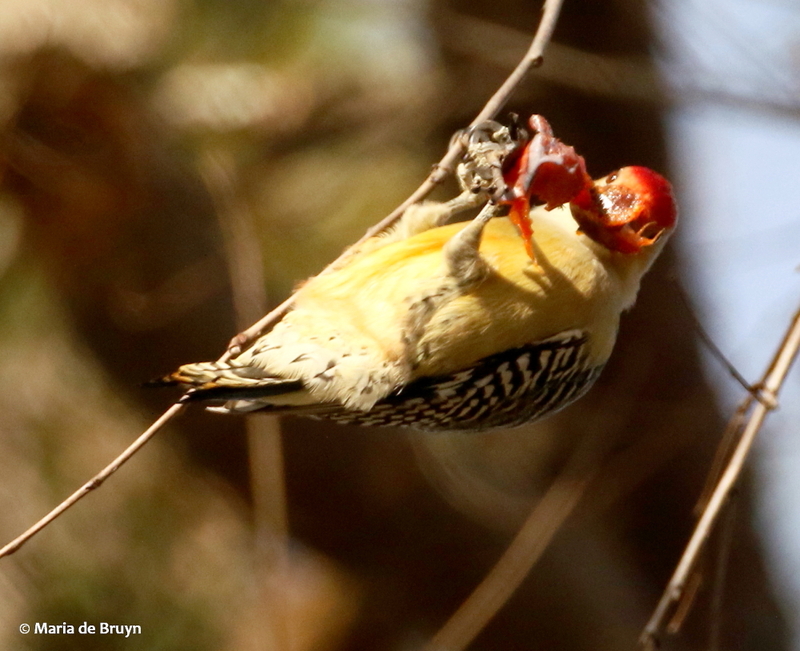 So, not all the birds are “nuts” for nuts, but plenty of species think they’re mighty fine! 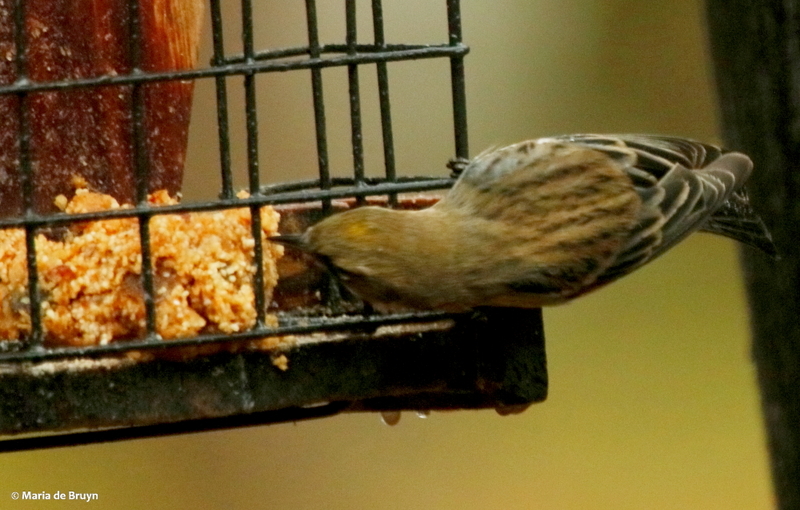 They are definitely a worthwhile addition to the birders’ array of feeder offerings. So this past weekend, our part of North Carolina dealt with Winter Storm Helena, which brought us 83 straight hours of below-freezing temperatures (e.g., -9C/15F but we had lower) and a need to bundle up really well if venturing outside. 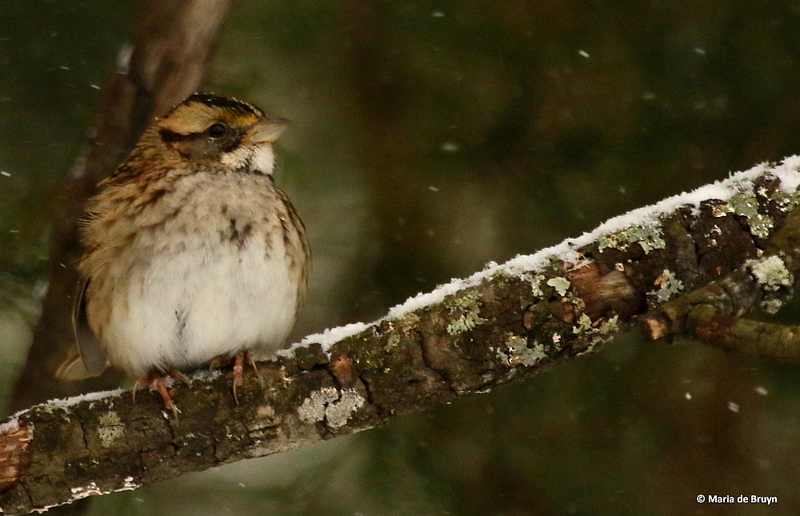 (It also brought me a realization that winter storms are being named like hurricanes.) 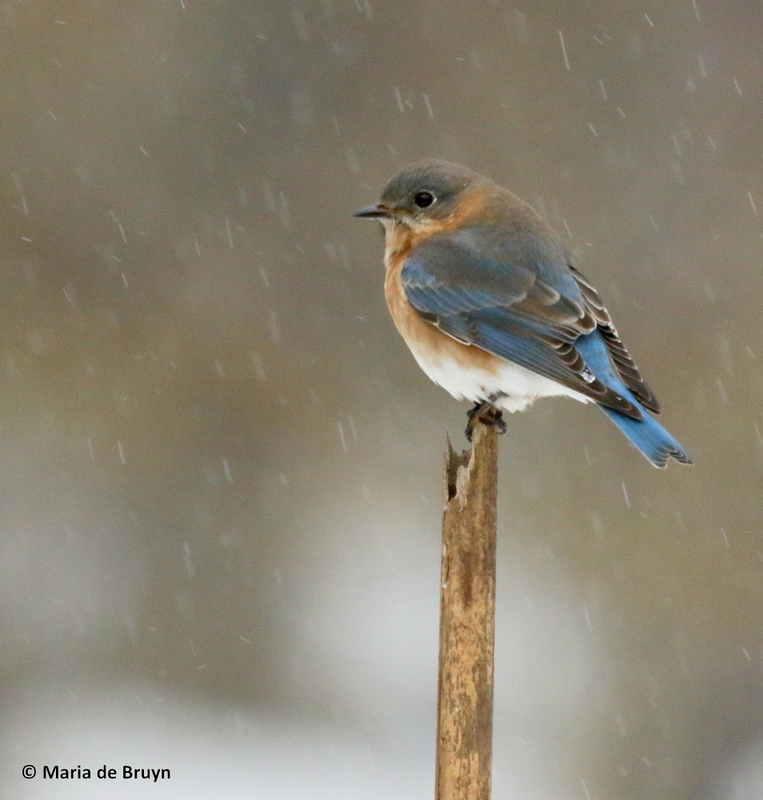 The first morning, when I went out to fill the bird feeders, I didn’t put on gloves or a cap and dealt with hypothermia symptoms when I finally went inside. I had on triple layers after that! 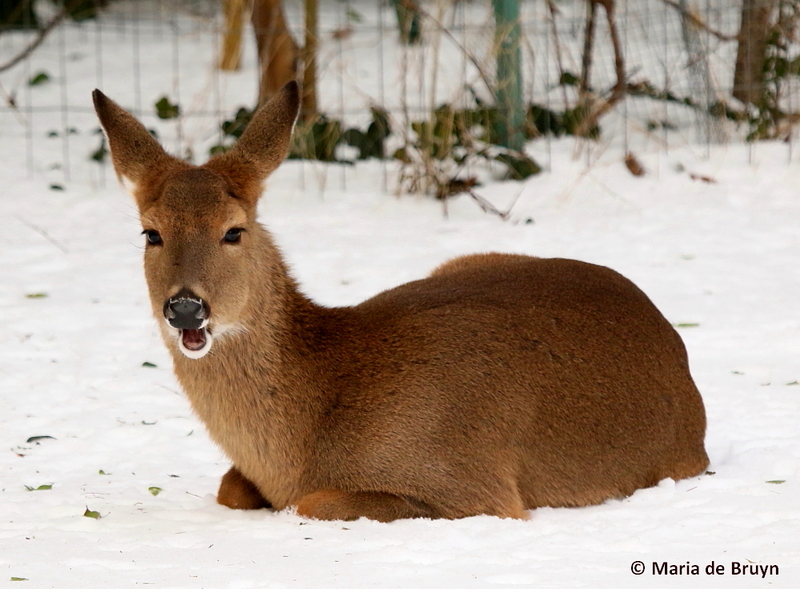 The deer had their fur puffed up and seemed to be coping well. 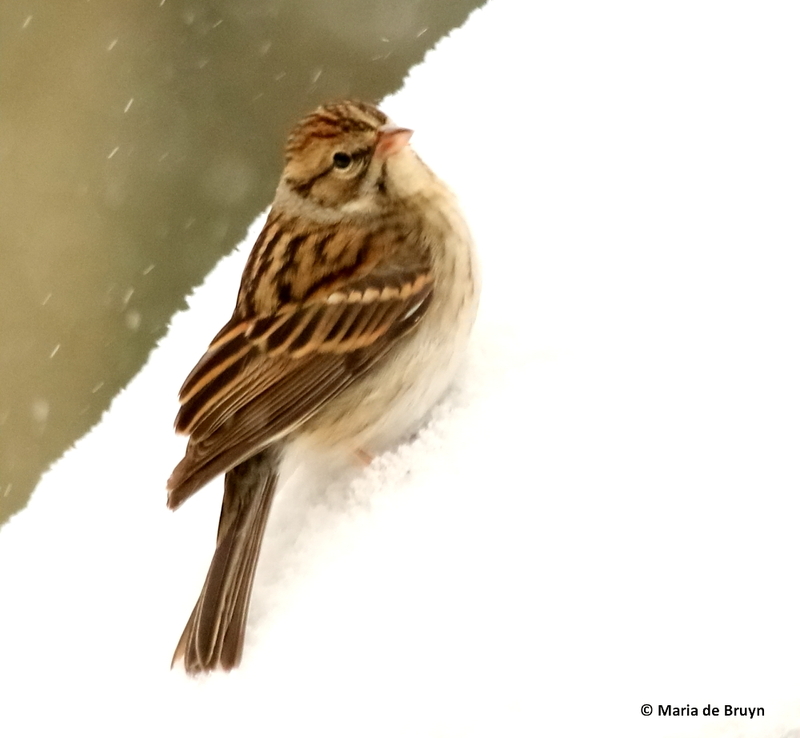 The frigid air made me feel very sorry for the wildlife, although living outdoors is, of course, what they do and what they have evolved to accommodate. 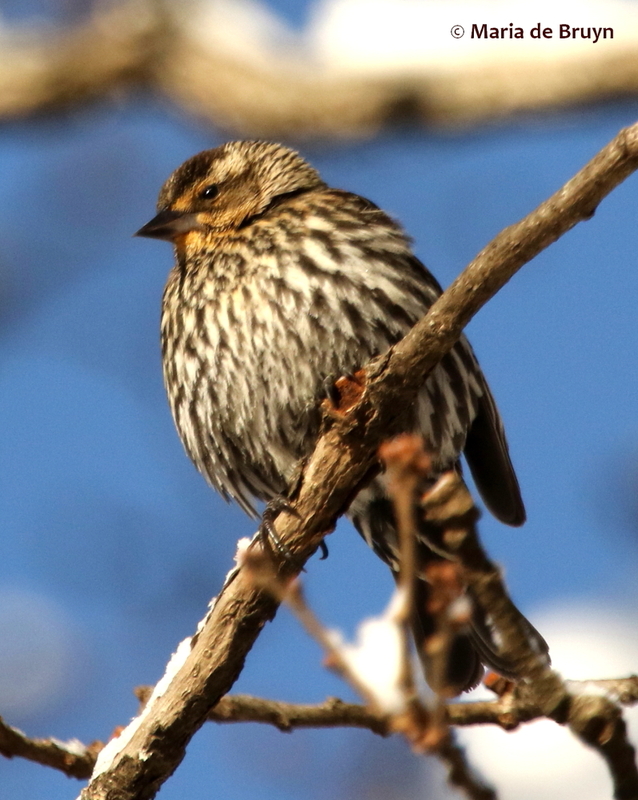 (I did hear today, however, of some birds and small animals that were found frozen to death!) 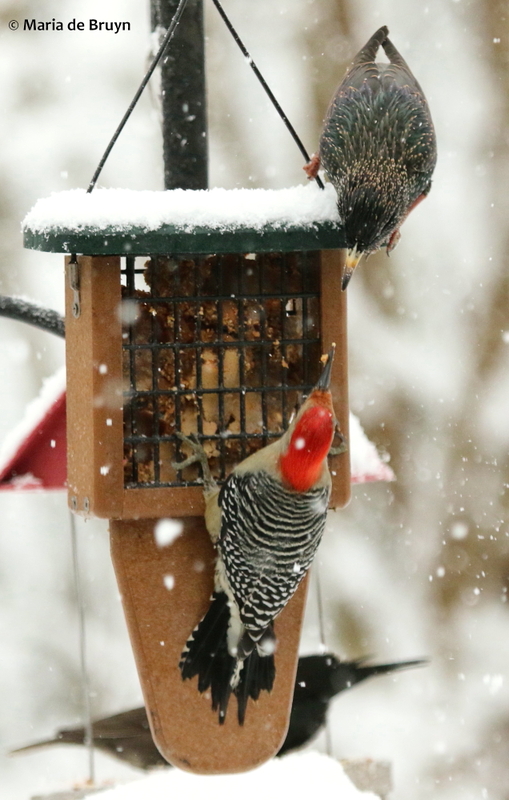 With the snow covering the ground, it turned out the birds were more than happy to visit the feeders and piles of food I had strewn on the snow for the ground feeders. 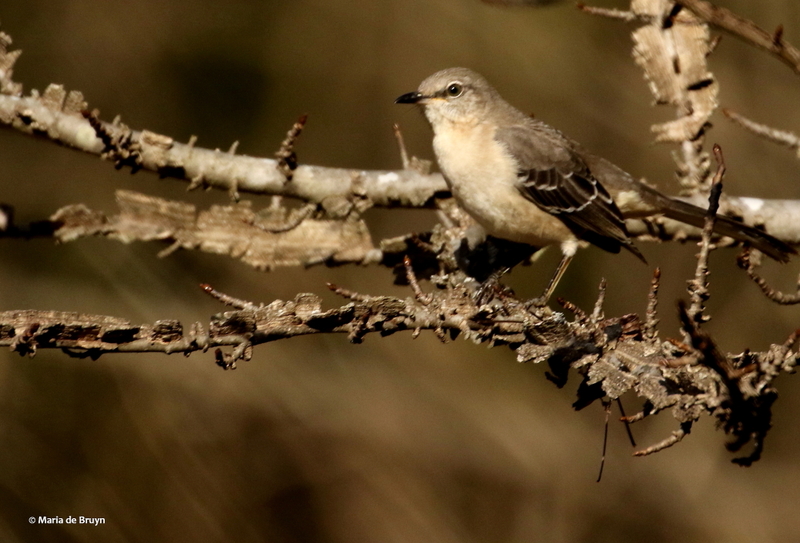 Not only did I have many types of birds coming round, but also record numbers of them. 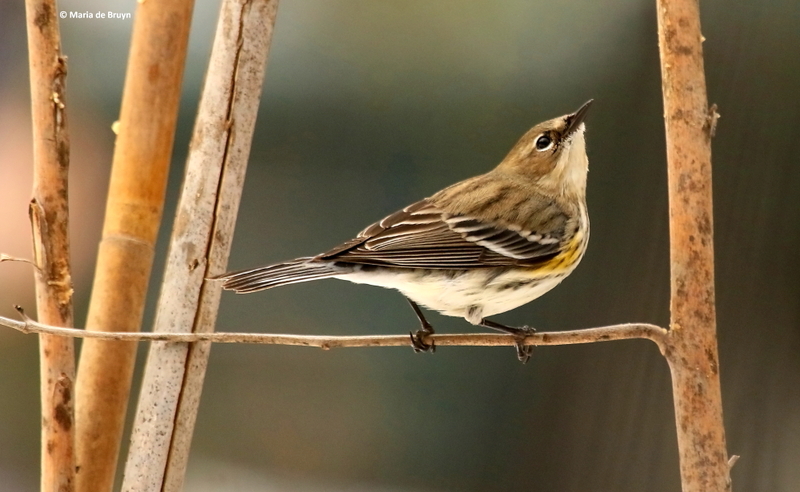 Some birds, like the yellow-rumped warblers (Setophaga coronata, above), usually tend to visit on their own and are not happy with their species mates in the vicinity but during these days, I had four of them alighting near feeders at a time. 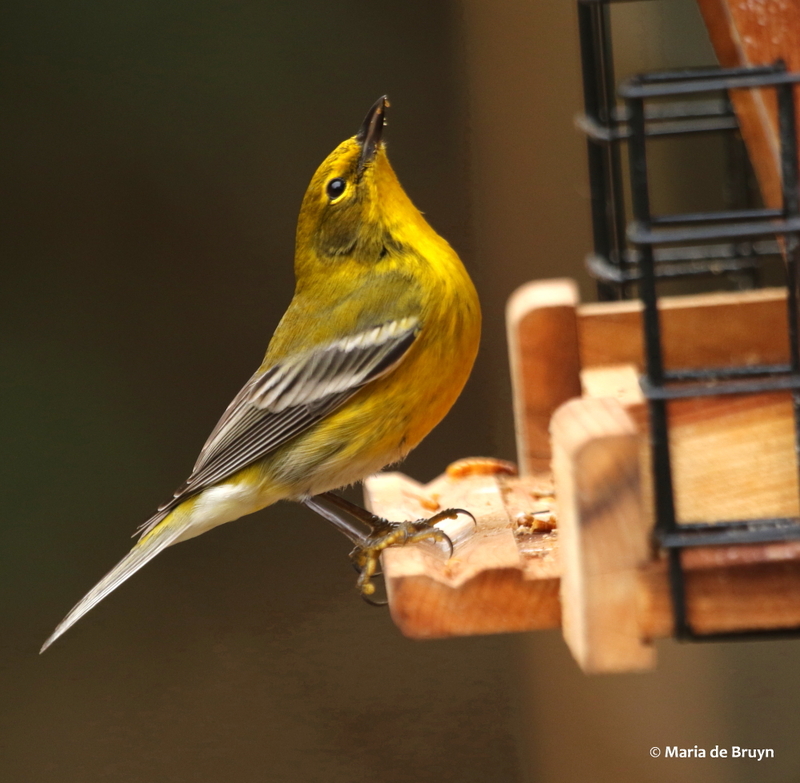 The same was true for the colorful pine warblers (Setophaga pinus) although they didn’t come close to each other. 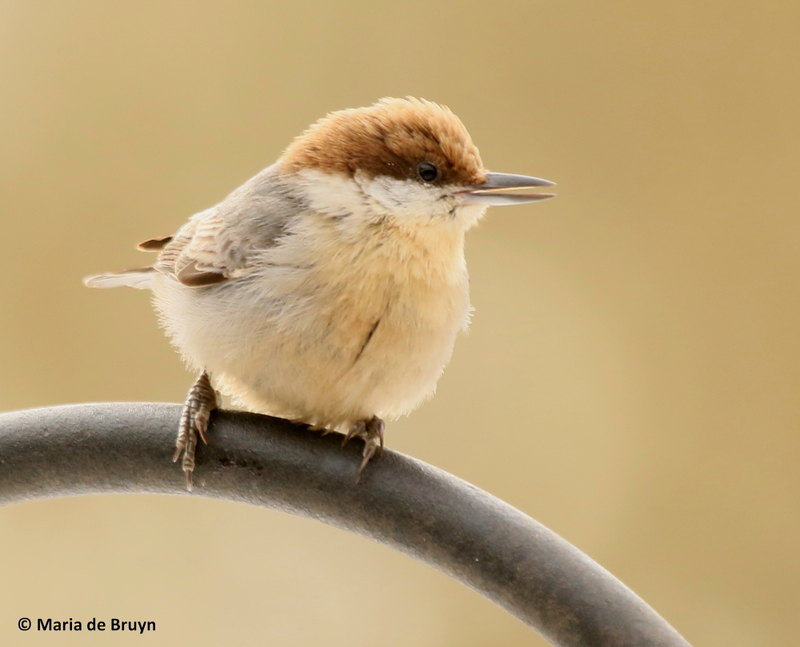 The Carolina wrens (Thryothorus ludovicianus) and Carolina chickadees (Poecile carolinensis) don’t seem to have too many problems with sharing space and visited the feeders in the same way they always do – quick flights to and fro from nearby tree and shrub branches. 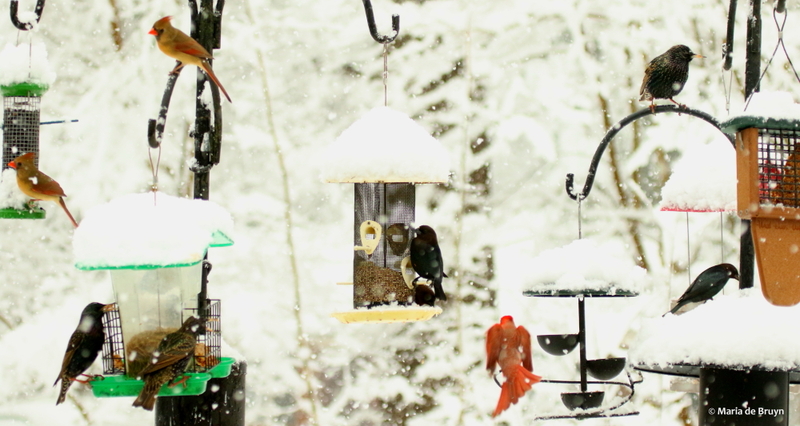 Most of the birds were fairly content to be in close proximity to one another during the snow days. 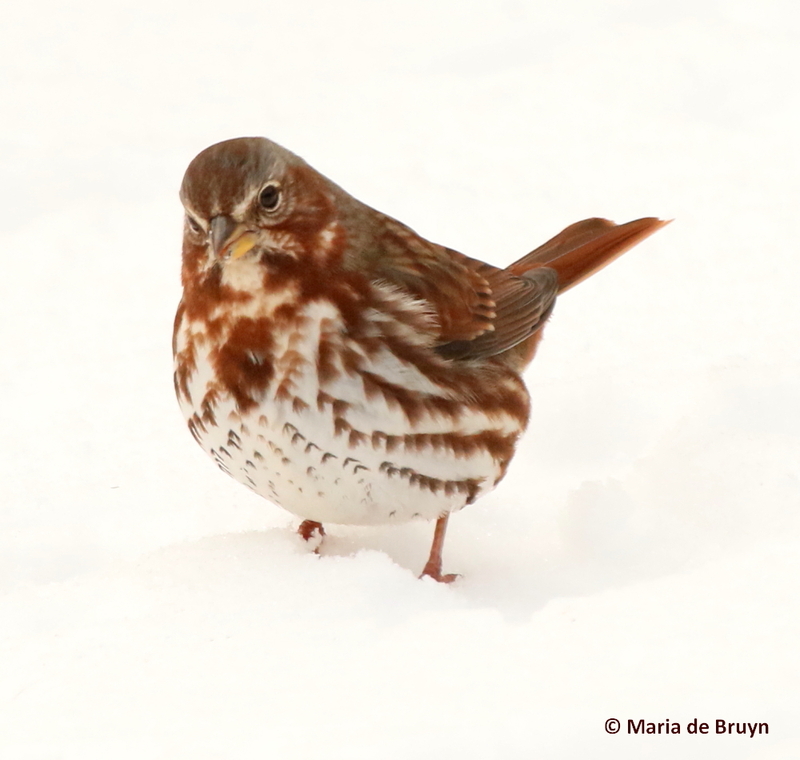 The brown thrashers (Toxostoma rufum) did get very cross with one another, however, when they came too close to one another and chased their rivals away. 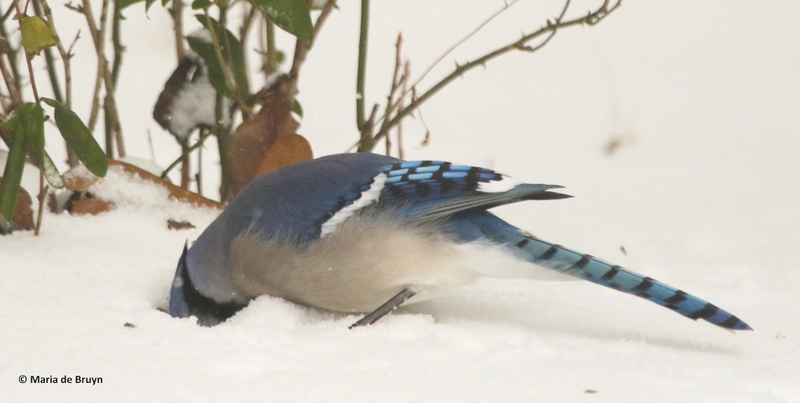 Sometimes a bird would go off and rummage in the snow, like this blue jay (Cyanocitta cristata). 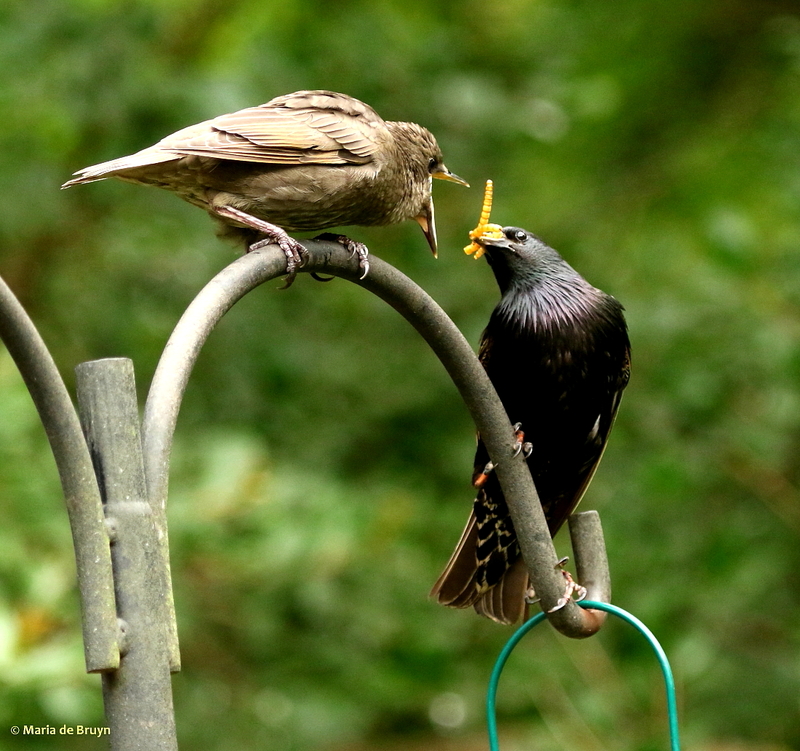 The biggest challenge for me was keeping the suet and meal worms in supply, mainly because the European starlings (Sturnus vulgaris) show up in large groups and gulp down food at a speedy pace. 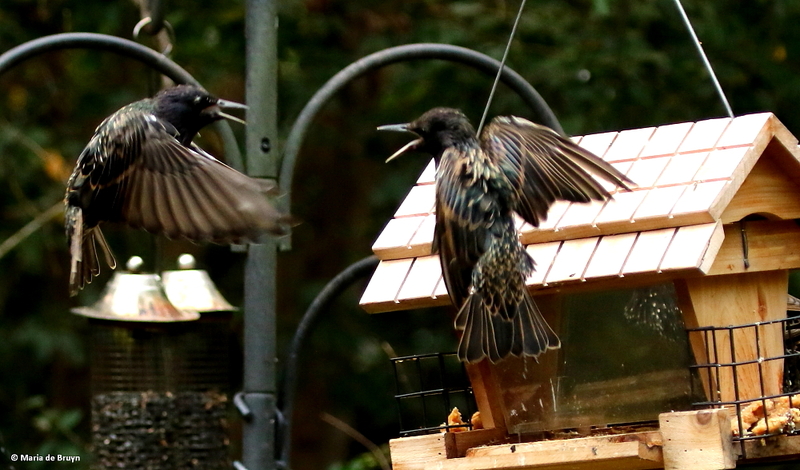 The other birds nibble but the starlings seem to inhale food as if they have vacuum cleaners in their throats. 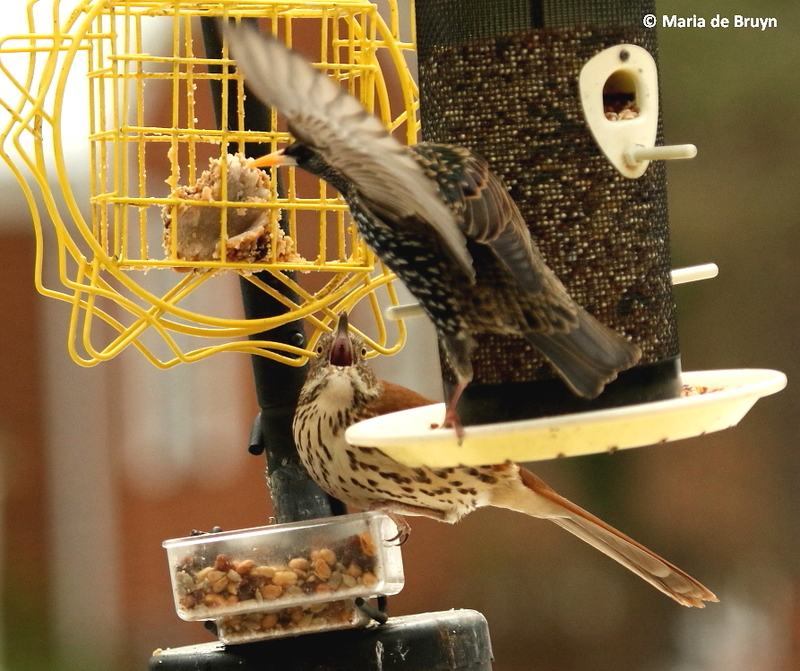 They can get grumpy with one another and don’t mind landing atop each other to get a foothold on the feeder. 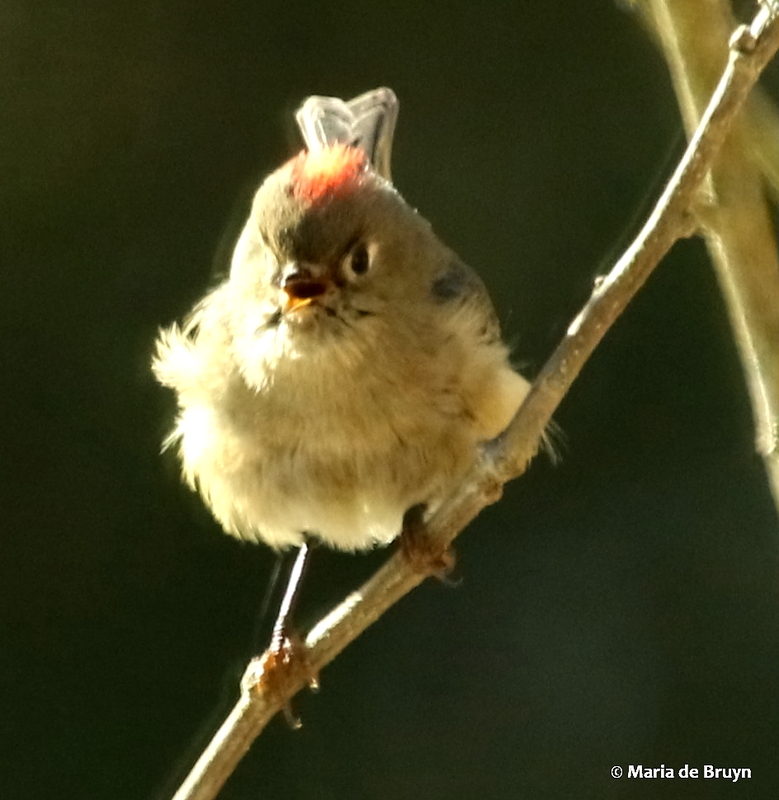 I was pleased that the other species of birds are learning to cope with them, no longer being intimidated to fly away when these greedy avians arrive. 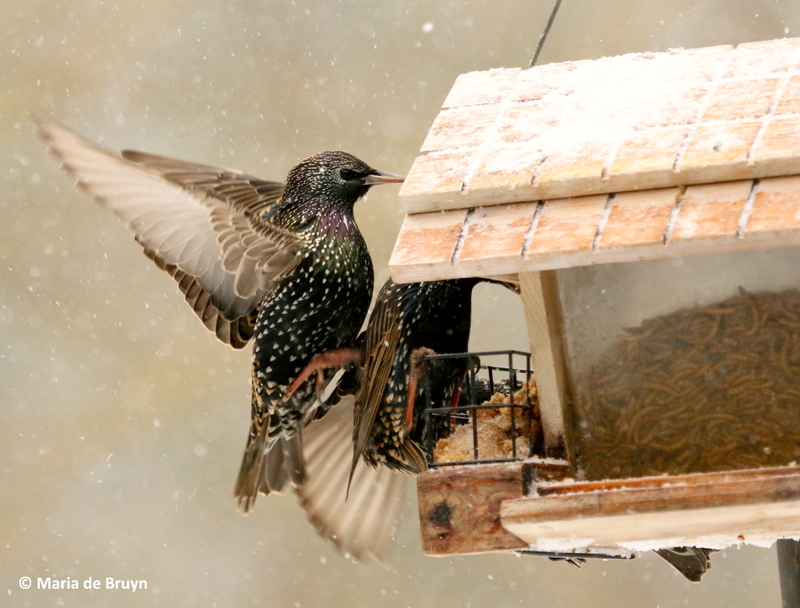 However, they may get displaced from a feeder just because the bulky starlings take up so much room and never wait their turn to get a spot. 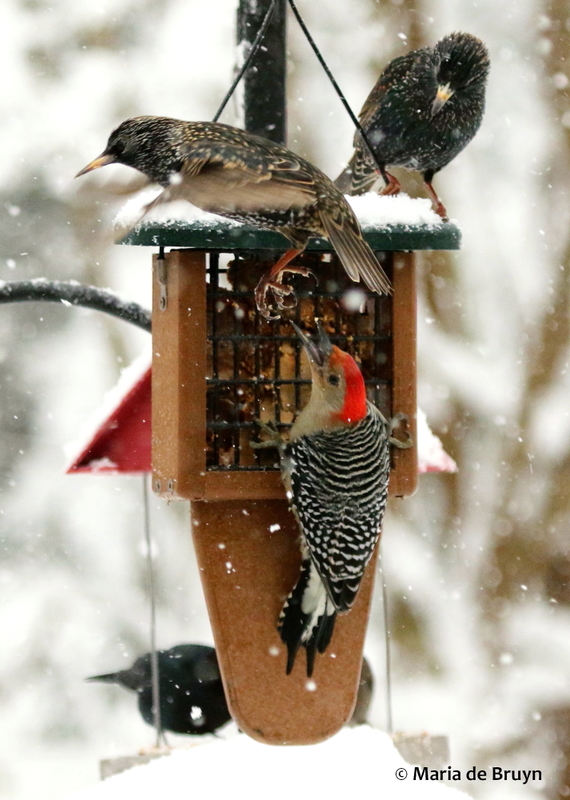 The larger birds, like the thrashers and red-bellied woodpeckers, may express their displeasure to the starlings while trying to hold their ground. 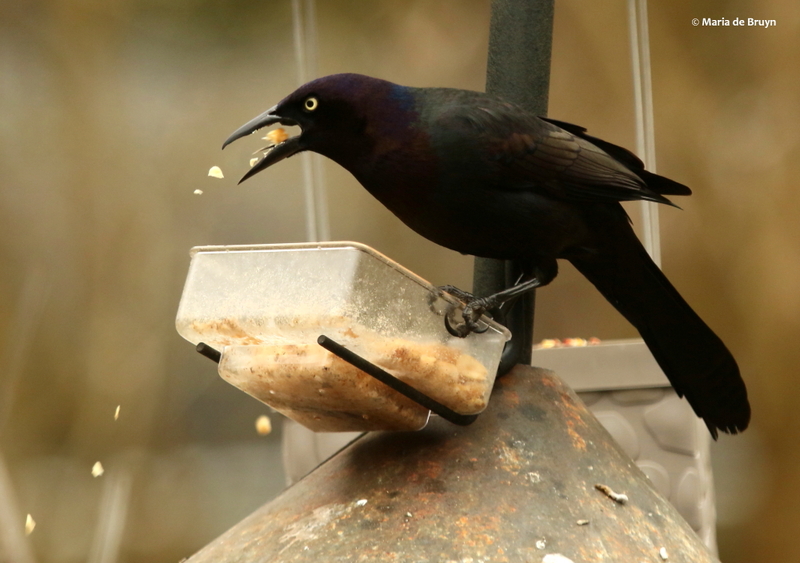 Other people report common grackles (Quiscalus quiscula) as feeder dominant birds but they are well behaved at my house. So, what was I going to do? 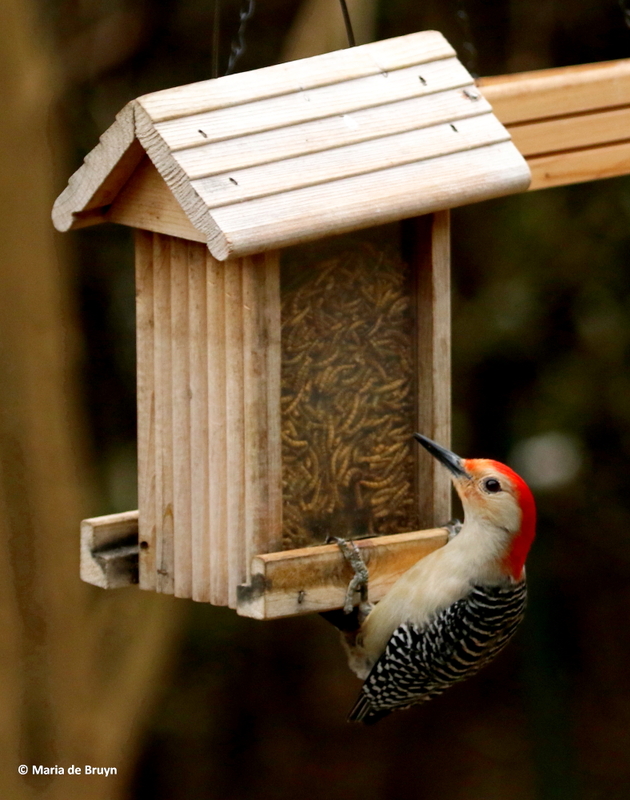 Some of my feeders are set in a flower garden and I had left the dried stalks of sage, butterfly bush and scarlet mallow standing. 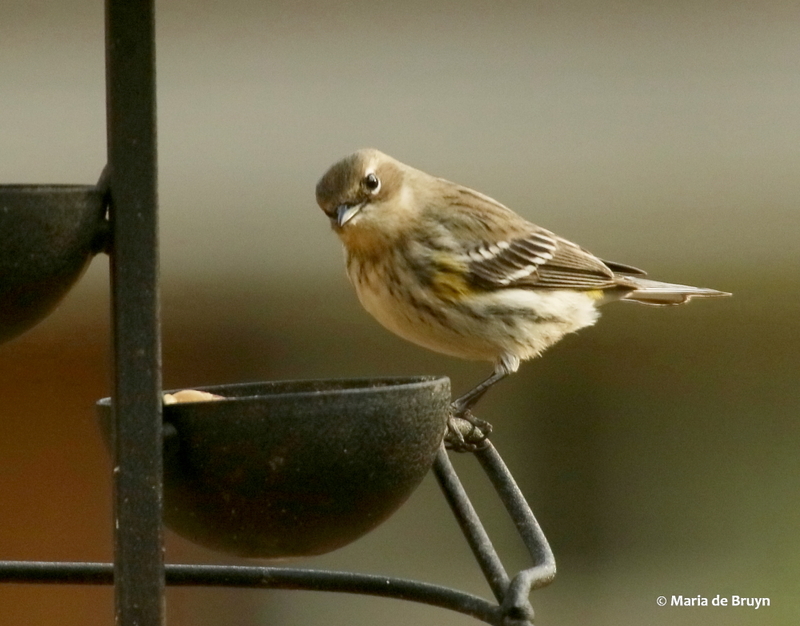 They don’t look pretty but the birds love sitting on them near the feeders as they digest a bite before getting another. 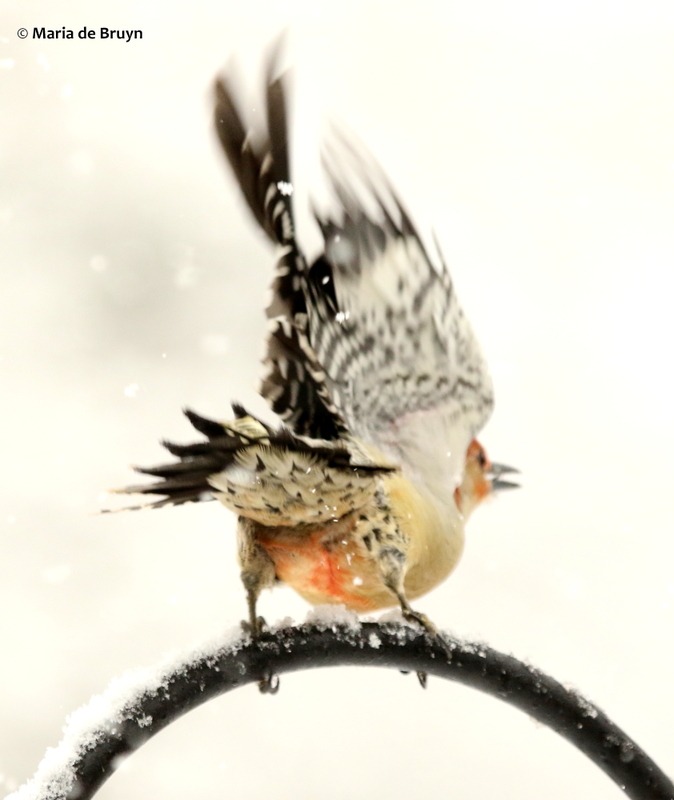 So I began smearing suet on the stalks, which are not sturdy enough to hold the starlings. 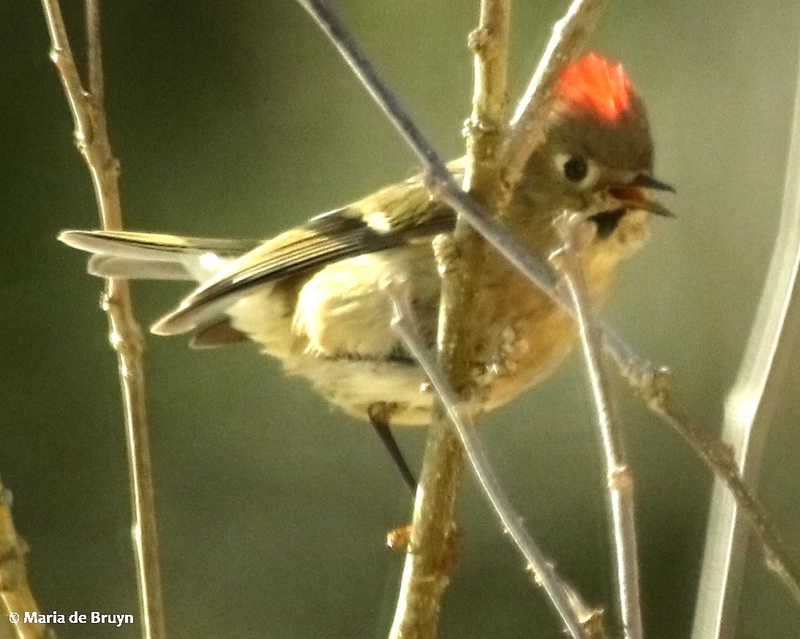 The yellow-rumped warblers and chickadees were pleased, as was my faithful ruby-crowned kinglet (Regulus calendula) and the Carolina chickadee. 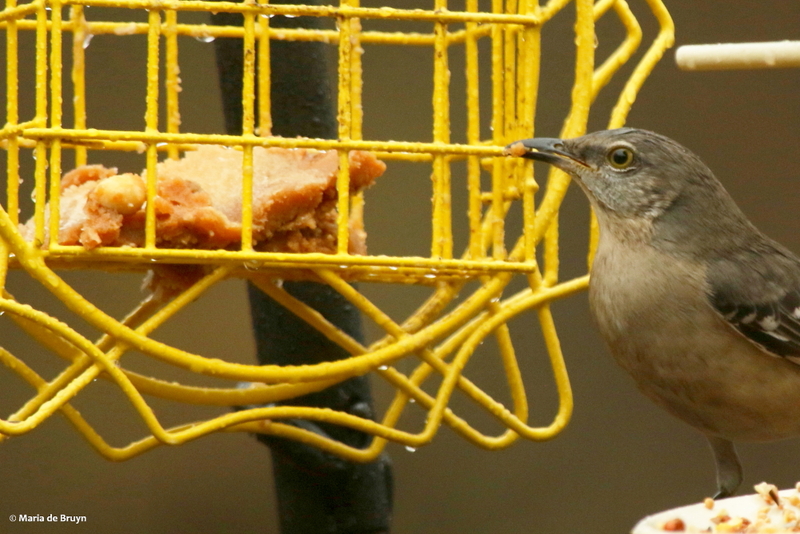 To my surprise, even the larger Northern mockingbird (Mimus polyglottos) and brown thrashers discovered and sampled the suet-laden stalks. 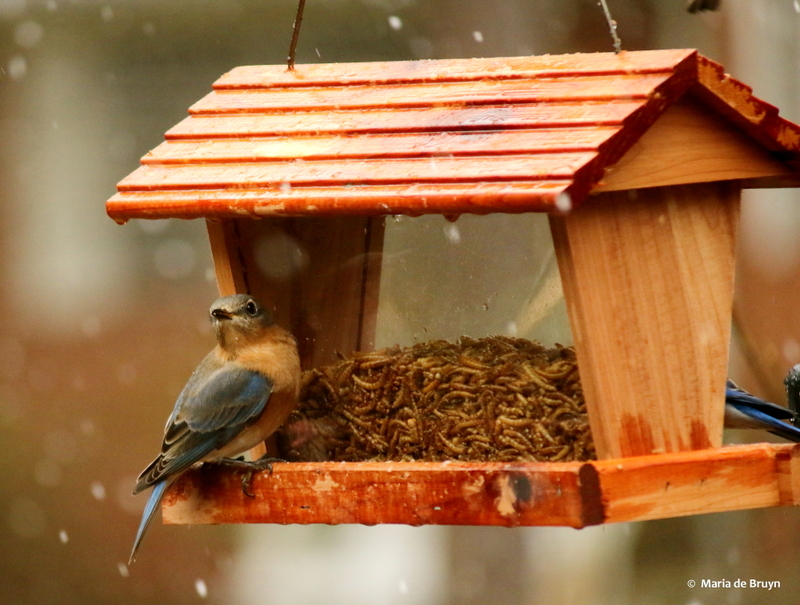 Following advice from the Bird Sleuth program, I had stuffed the bluebird and nuthatch boxes with pine needles and wool in case the birds wanted to shelter there overnight. 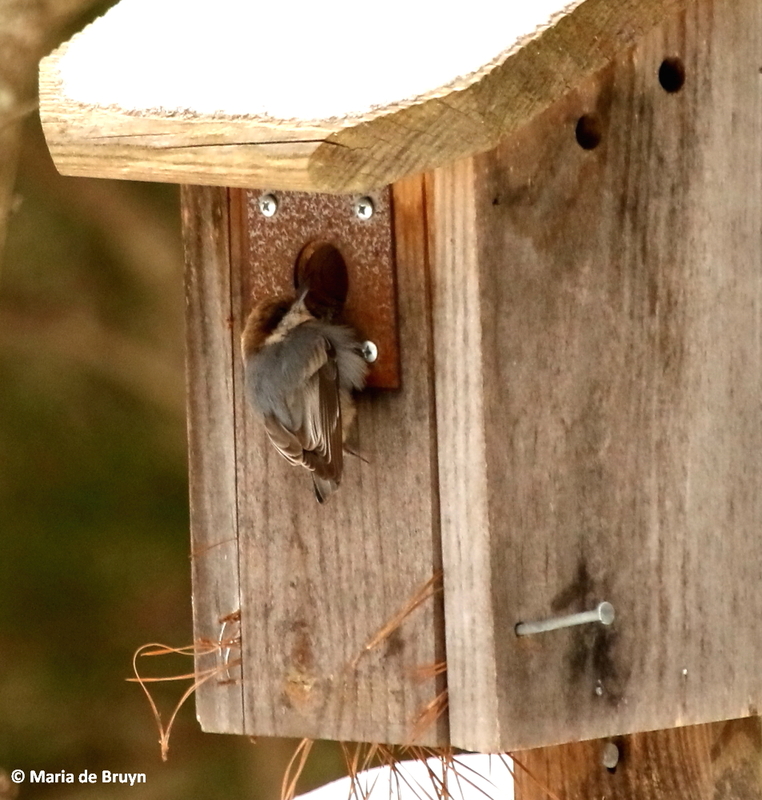 I don’t know if any of them did, but the brown-headed nuthatches (Sitta pusilla) were again checking out their preferred nest box, so perhaps they did roost there overnight. 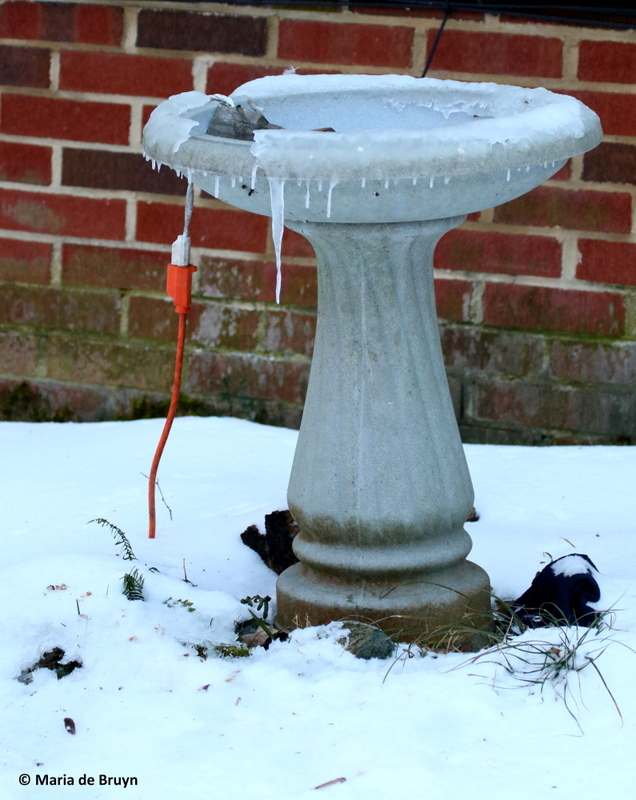 I was filling the heated bird bath daily, too, as it became a popular drinking fountain. 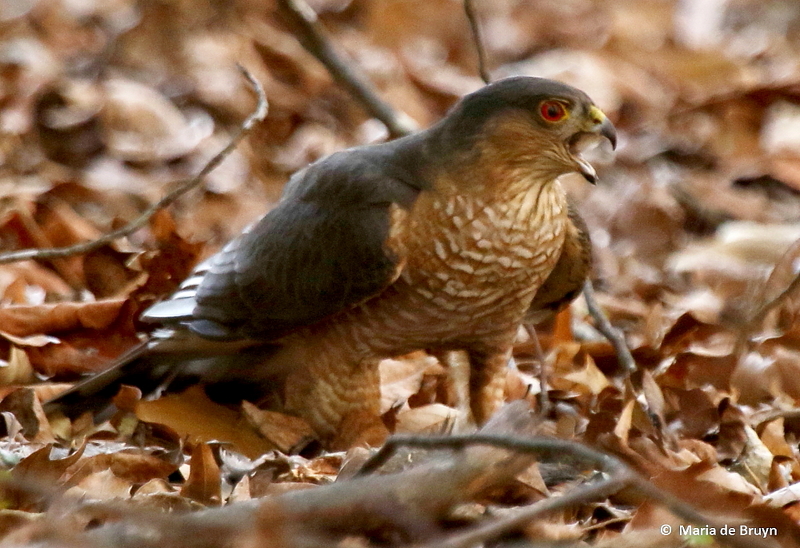 The birds “missing” from the storm gathering were the hawks. 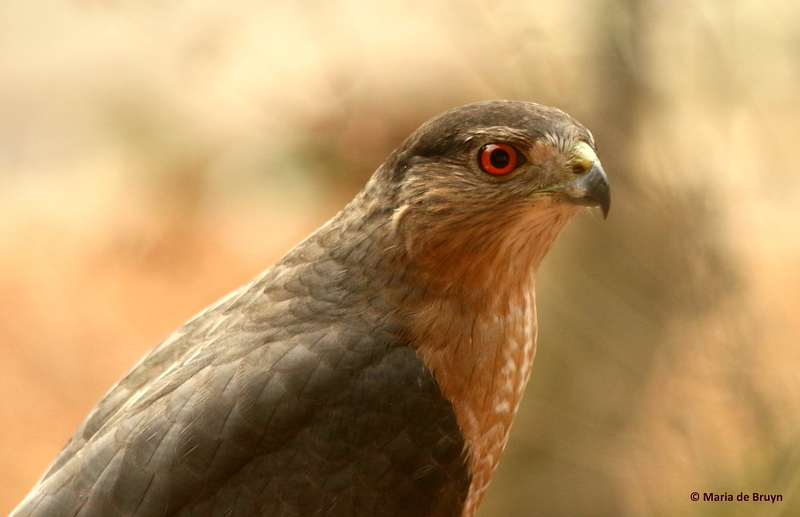 I’ve had a Cooper’s hawk (Accipiter cooperii) visiting for years, but recently discovered that a sharp-shinned hawk (Accipiter striatus) is also taking birds from my yard. As they look quite similar, the sharpie may have been coming around for some time and I just never realized it. They were both here in the last couple weeks, but neither one made an appearance during the storm. 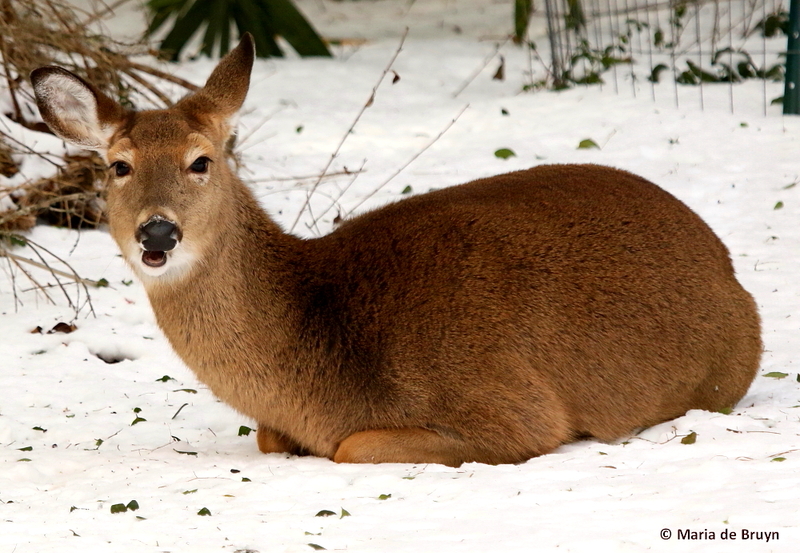 Our two neighborhood white-tailed does (Odocoileus virginianus) and their three offspring came by, obviously finding my yard a peaceful and safe space to rest. 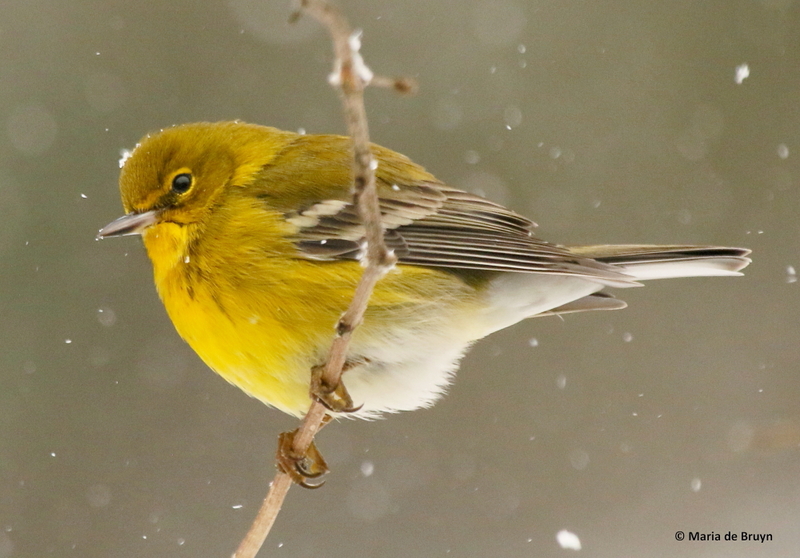 So I’ll end with some “beauty shots” from the snow days as the snow and ice are now melting. 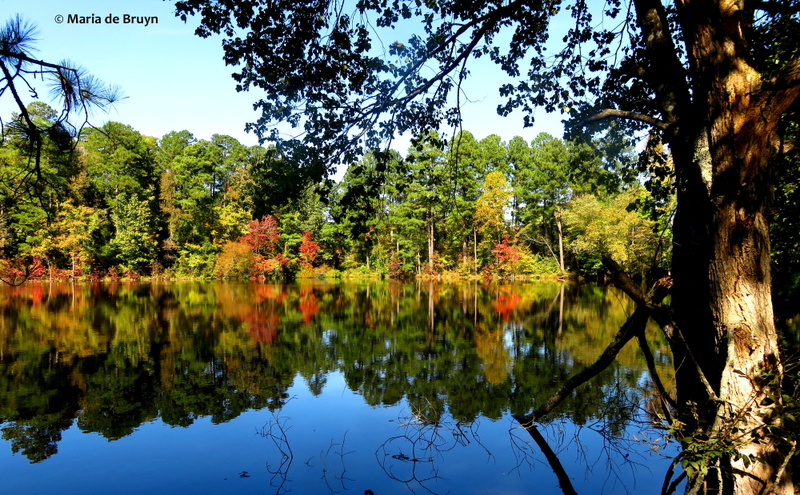 In two days’ time, we are supposed to be having temperatures of 68F/20C or higher! And then we can wait out the rest of January as well as February and March to see if we get any more winter storms. 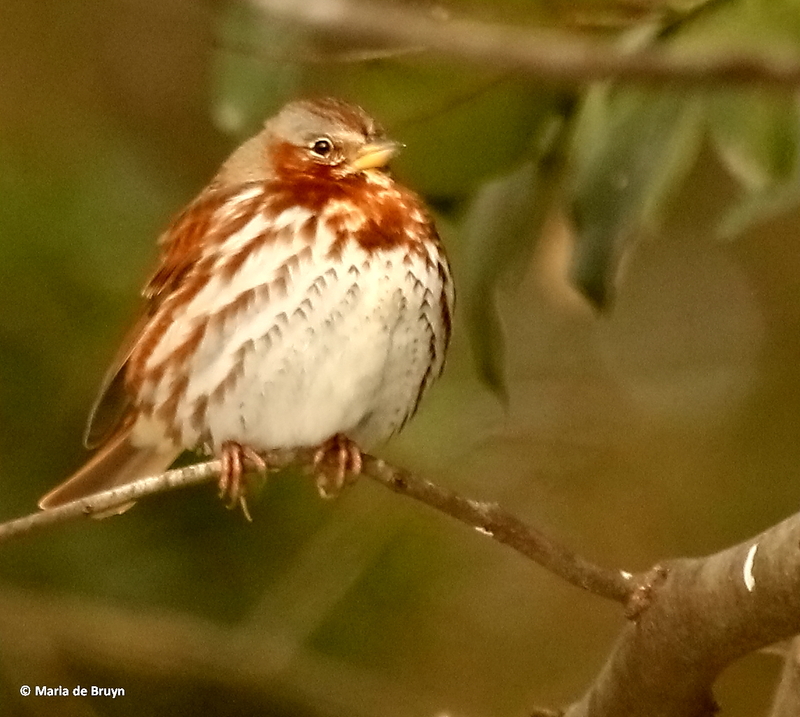 In the birding world, a “nemesis bird” often refers to a species of bird that is eluding a birder intent on adding to their life list of bird species seen in person. 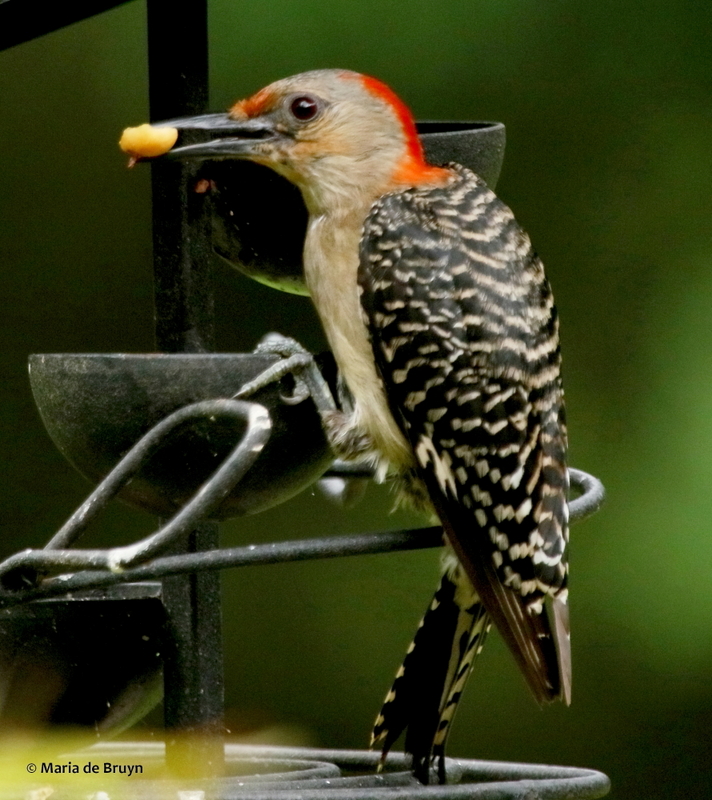 For me, however, a nemesis bird is one that is emptying my feeders and depriving other birds of their bit of nutritional goodness because it descends in such great numbers that no one else has a chance. 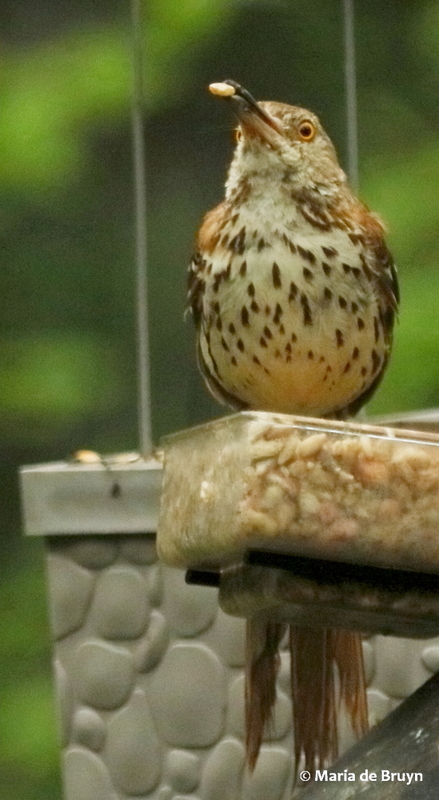 Which bird is this? 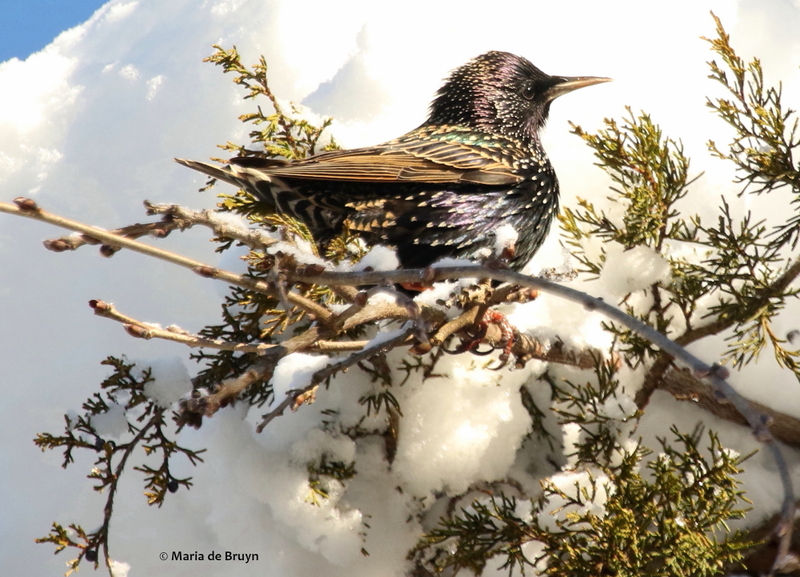 It’s the European starling (Sturnus vulgaris), a bird which I admittedly find visually beautiful but rather unattractive as far as temperament goes. 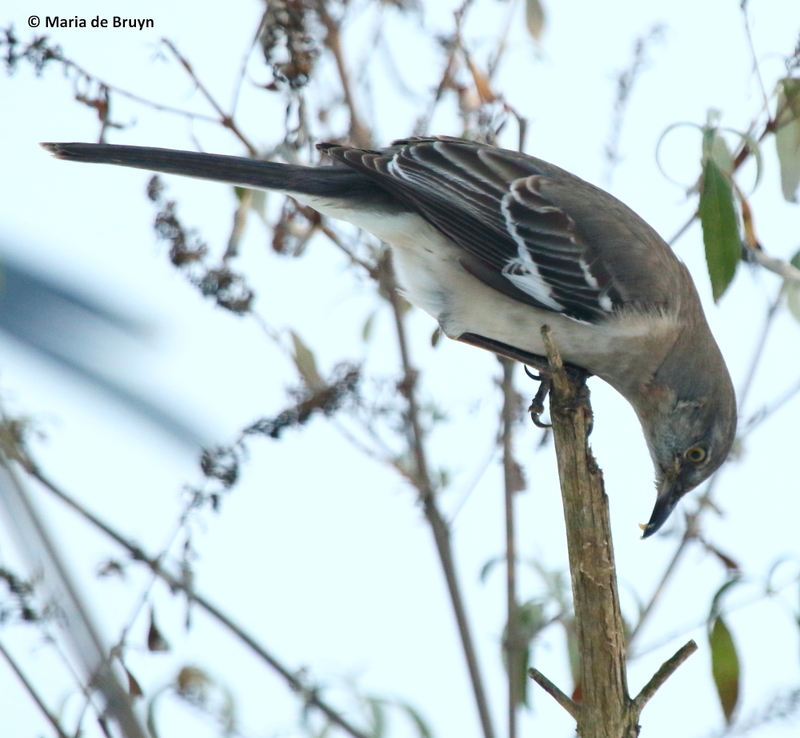 Other birders who spend time attracting birds to their yards often comment on how Northern mockingbirds (Mimus polyglottos) chase other birds away – those in my yard feed quite happily alongside other species, however, and even wait their turn for the suet feeders. 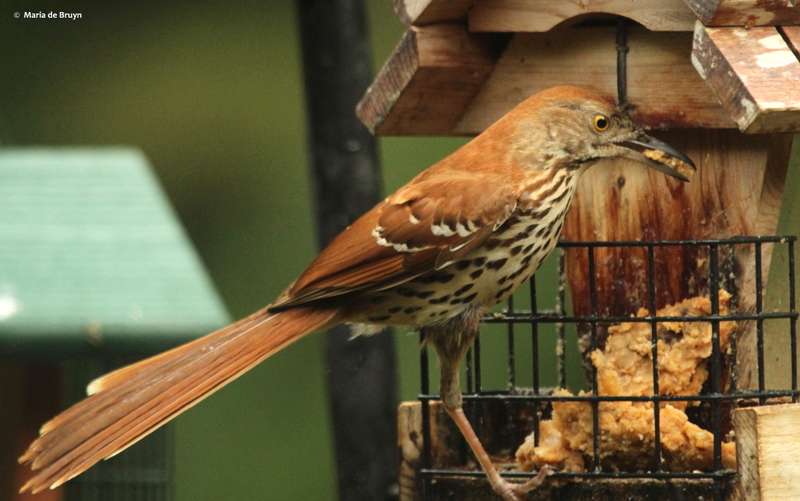 Another large bird, the brown thrasher (Toxostoma rufum), does the same. 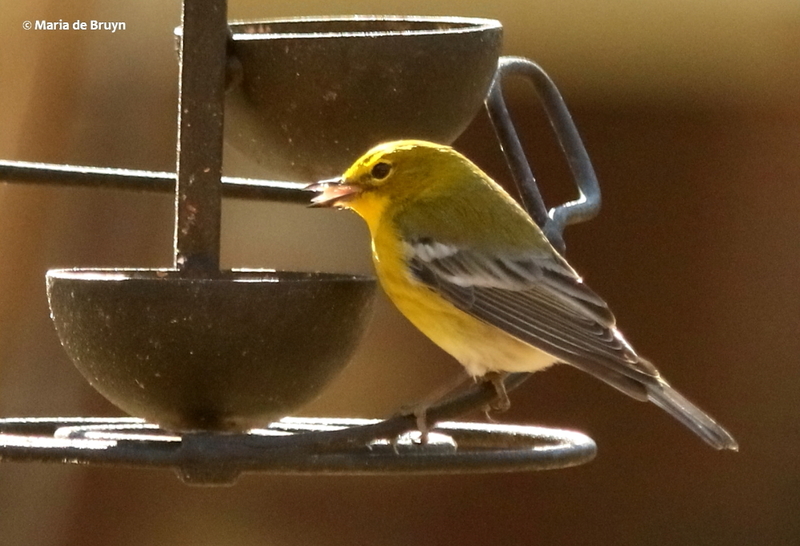 In fact, most of the species that visit my yard are content to share feeder space and/or wait their turn. 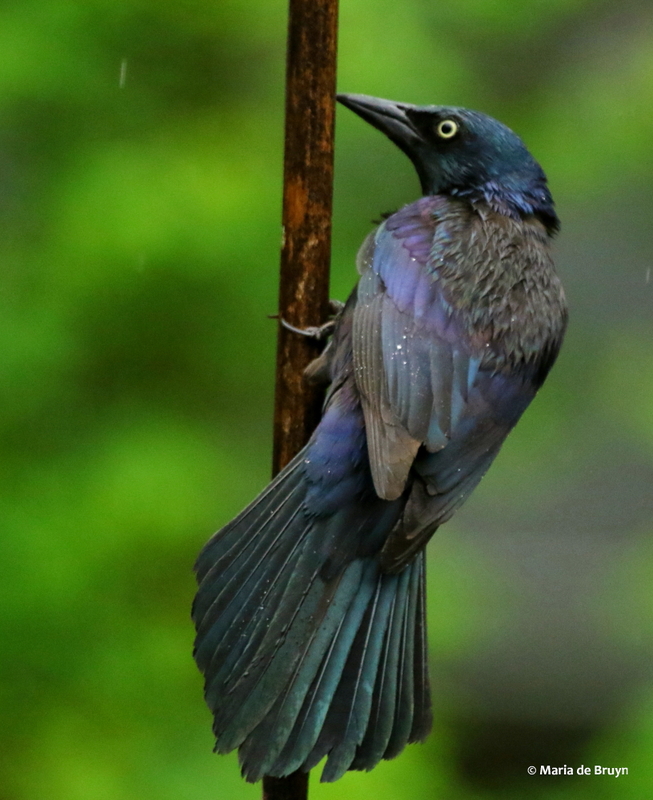 Other species that are called “bully birds” include common grackles (Quiscalus quiscula, below), who can look quite beautiful with iridescent feathers, blackbird species and house sparrows. 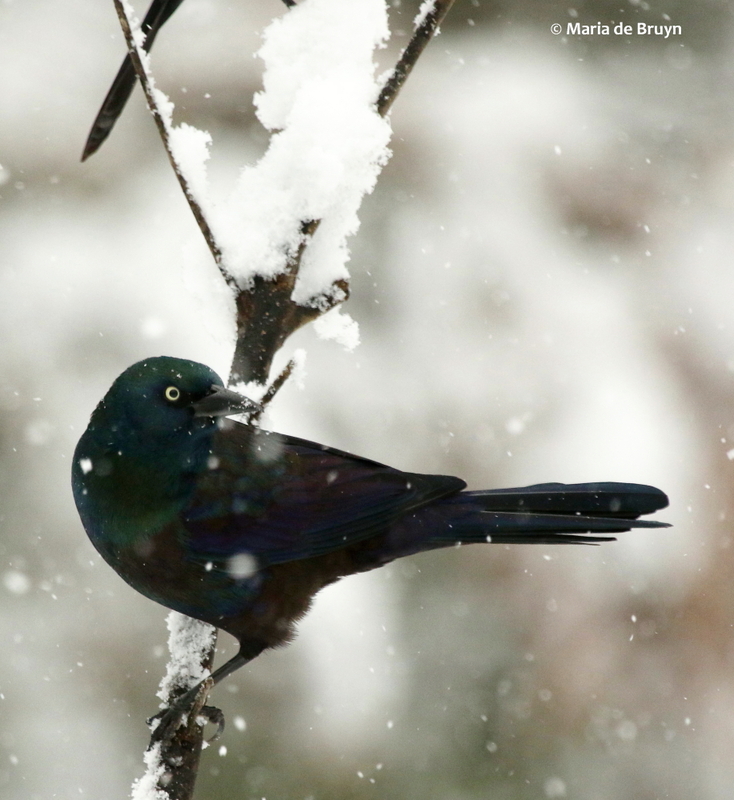 The grackles and red-winged blackbirds (Agelaius phoeniceus) in my yard have not been too dominant; they do sometimes come in numbers but let other birds near. 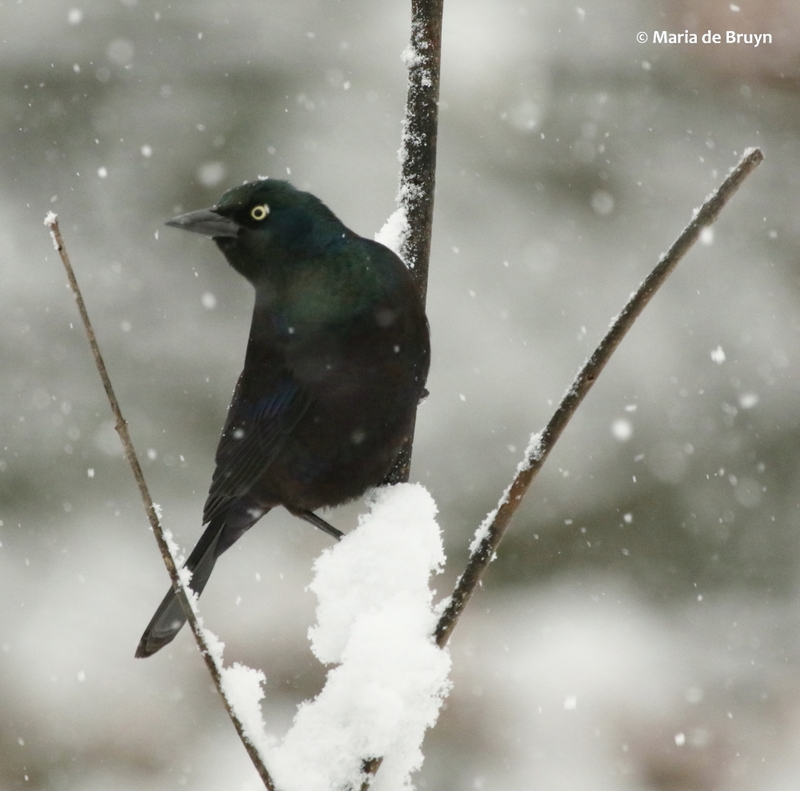 I haven’t had crowds of grackles lately and when they’ve come, their main concern was to attempt to drive away the American crows (Corvus brachyrhynchos, above), so my main foe has been the starlings. 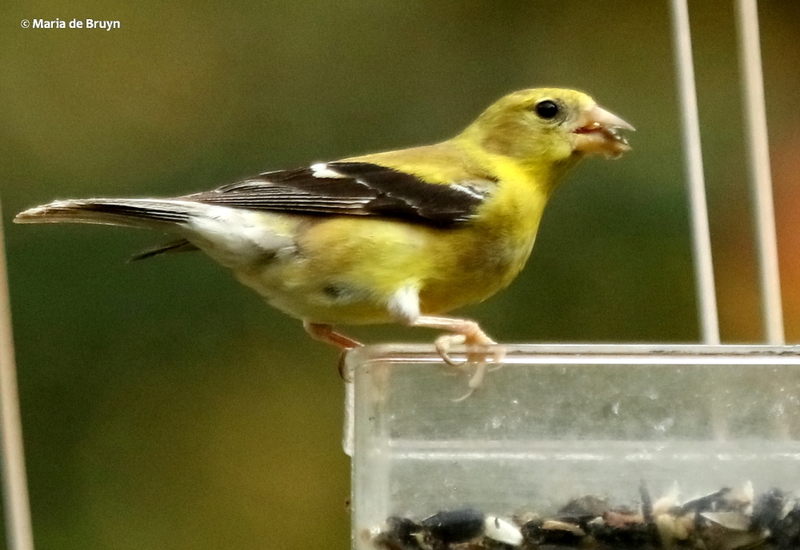 They discovered my yard as a buffet about a year ago and introduced their young to the feasting area this past summer. 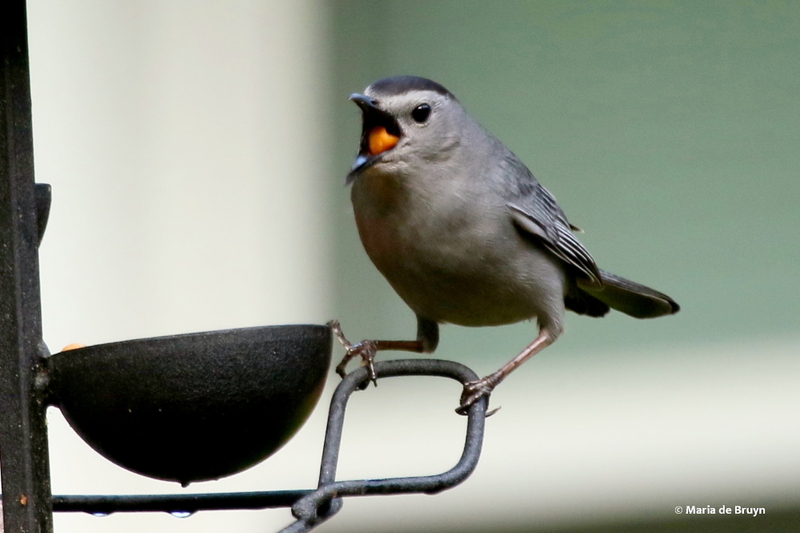 What is striking to me is the fact that they not only will “yell” at other species to go away but also compete vigorously with one another for a spot at the platform and other feeders, indicating a rather nasty disposition. 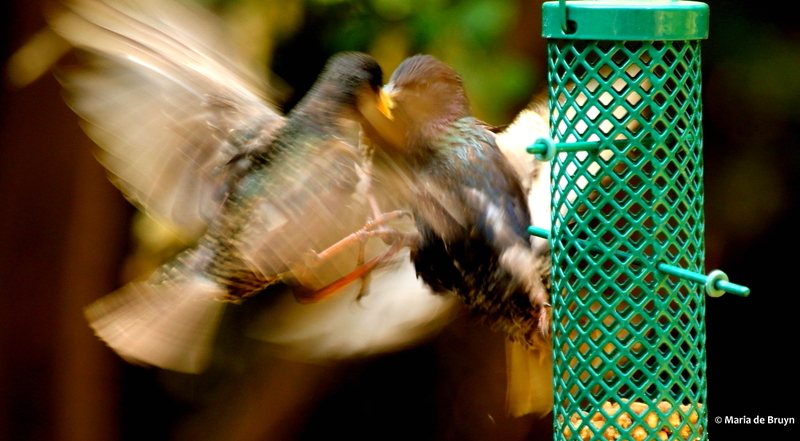 The young starlings pick up on this behavior quickly. 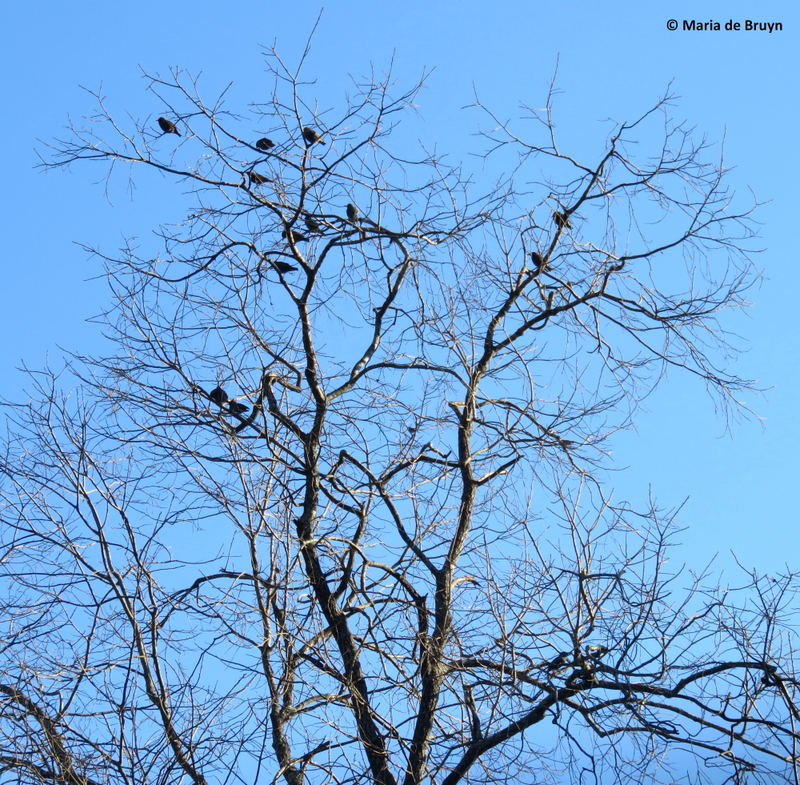 If I come outside, they quickly fly off and roost high up in the tallest trees; sometimes, they will actually fly off to another place in the neighborhood. Clapping my hands and banging on the window will also get them to leave. However, they stick around to assess whether I will appear and if I don’t come out, they are back in short order. 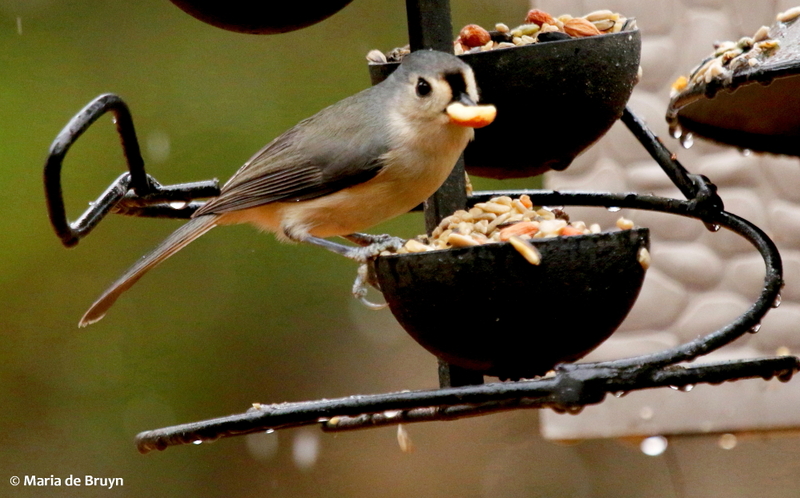 Their first love turned out to be the dried mealworms, which are a big hit with the Eastern bluebirds (Sialia sialis), tufted titmice (Baeolophus bicolor), Carolina chickadees (Poecile carolinensis), Carolina wrens (Thryothorus ludovicianus) and pine warblers (Setophaga pinus, left) among other species. 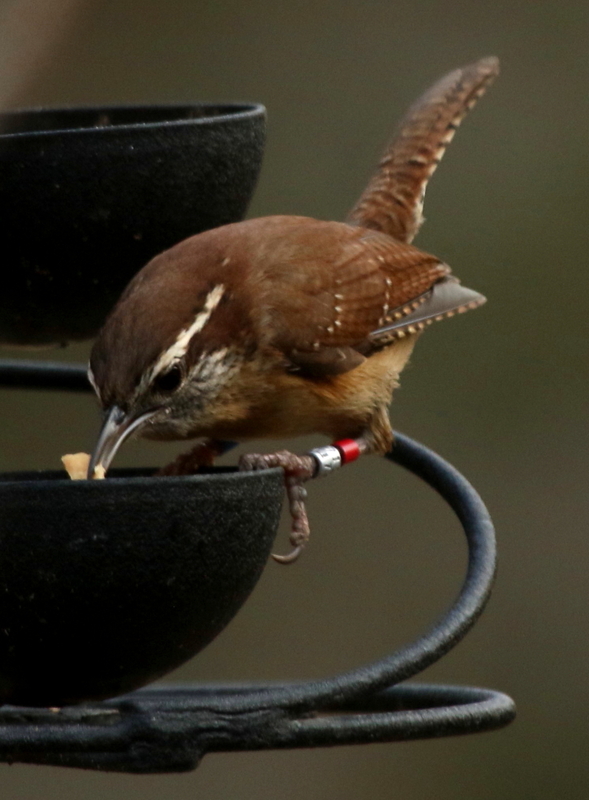 It’s always a pleasure to see the banded birds return, like the Carolina wren below. 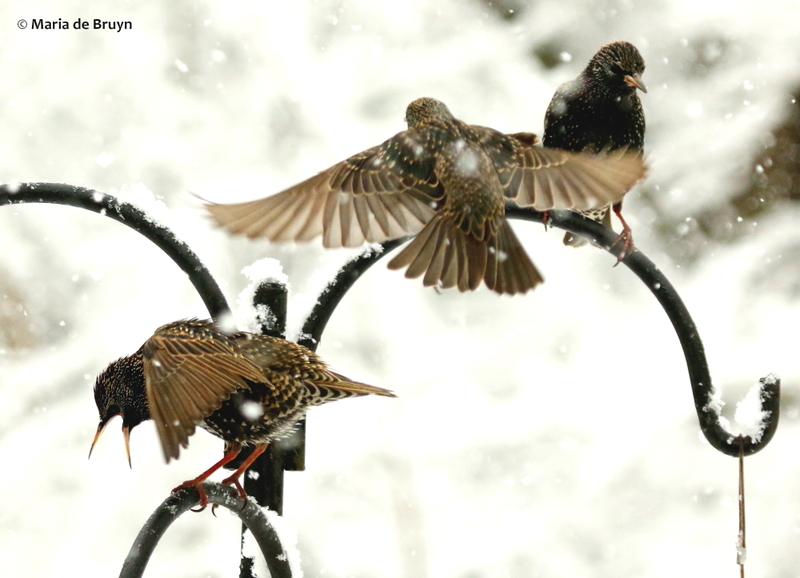 When five or more starlings gather around a feeder, they literally gulp the mealworms down, making short shrift of a good-sized supply. 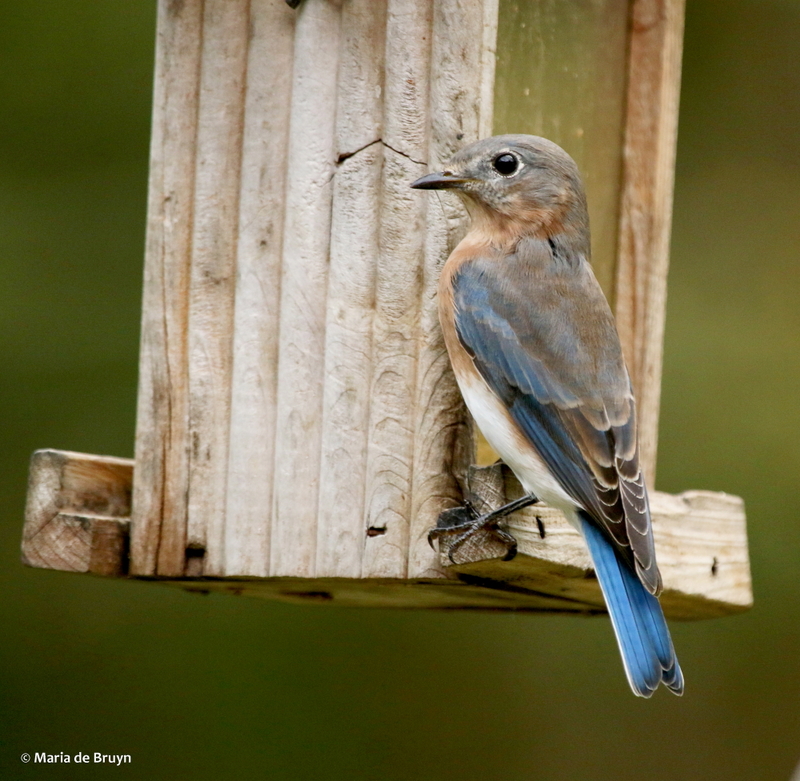 I began putting out only mixed seed, sunflower seeds (Helianthus annuus) and my home-made vegetarian suet, the latter being a favorite for many species: the bluebirds, chickadees, wrens, titmice, yellow-rumped warblers (Setophaga coronata), brown-headed nuthatches (Sitta pusilla), Northern cardinals (Cardinalis cardinalis, left), and downy and red-bellied woodpeckers (Picoides pubescens and Melanerpes carolinus). 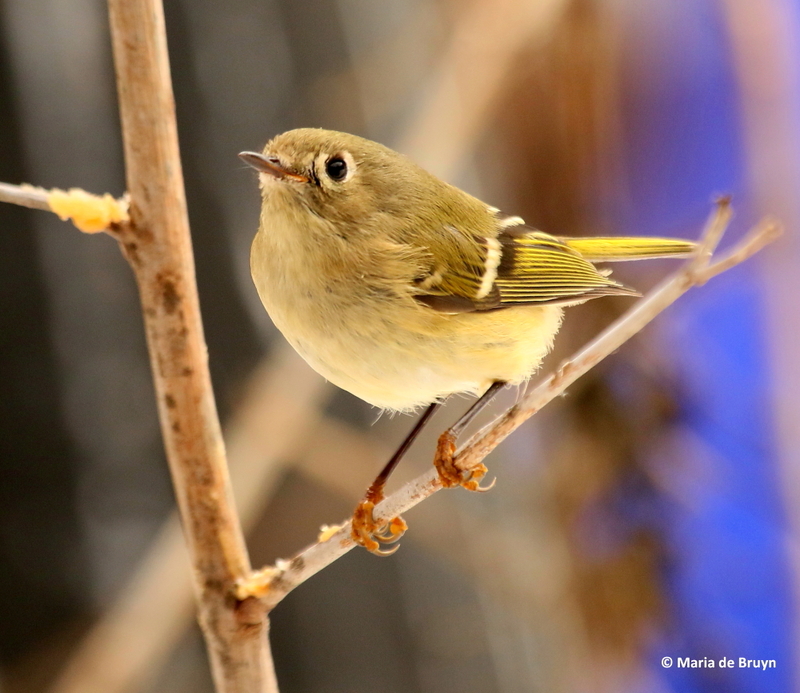 My resident ruby-crowned kinglet (Regulus calendula) hasn’t returned this winter (though I hope he is just late), so he doesn’t have to compete with the much, much larger starlings for his beloved meals. 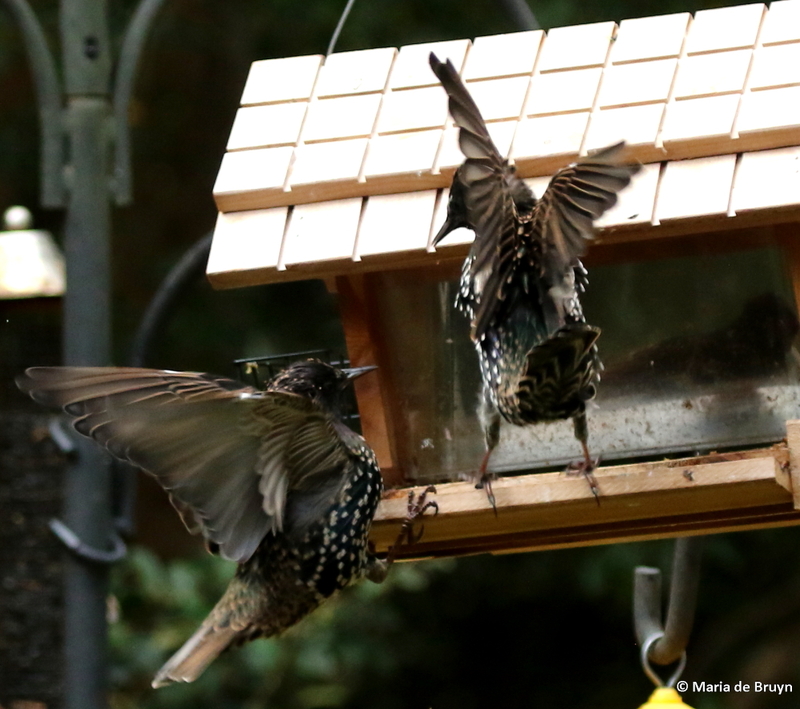 To my dismay, when the starlings discovered no mealworms were available, they decided that suet could be a nice substitute. Oy vey! 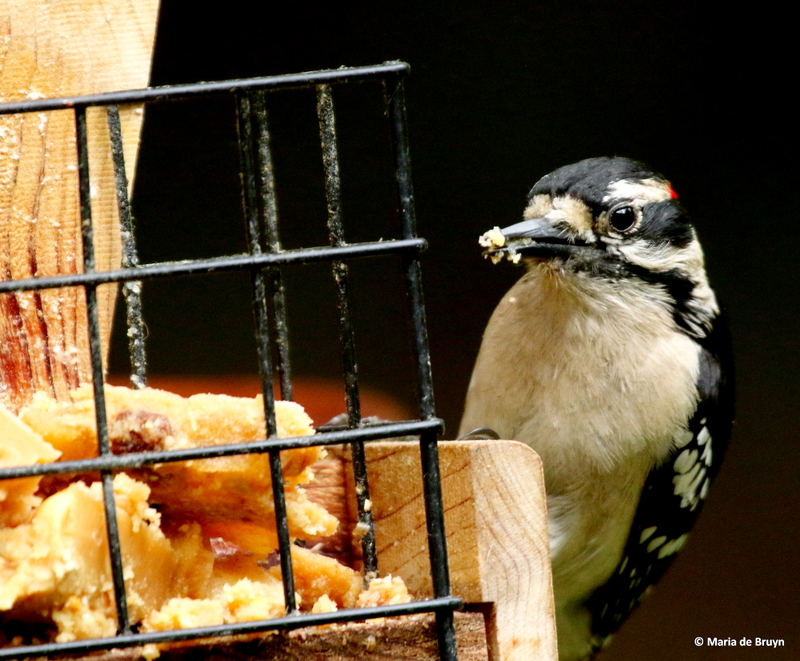 They manage to empty the suet holders in record time. 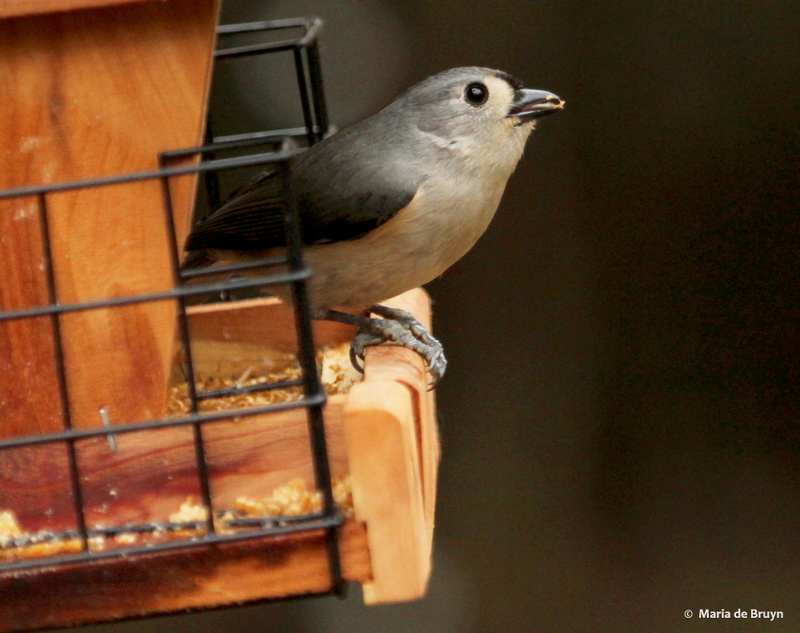 I waited to put out the suet until I saw no starlings in any of the tall trees surrounding the yard. 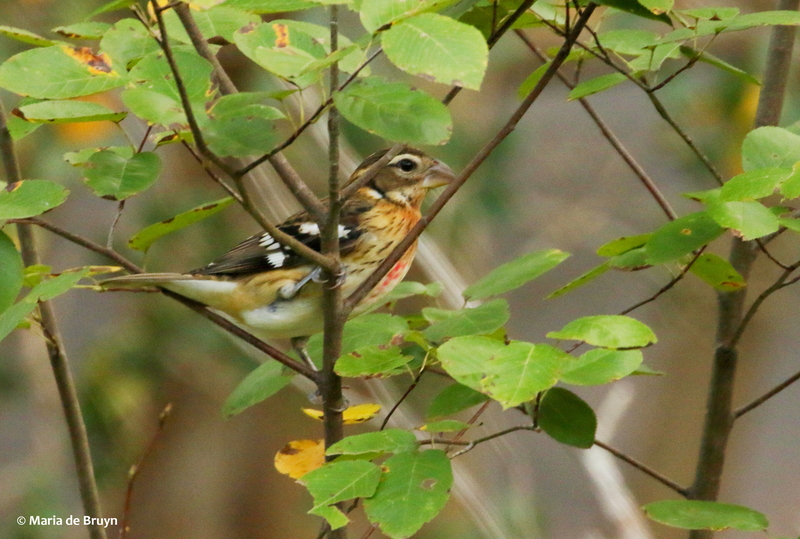 The smaller birds came but this lasted only a little while. 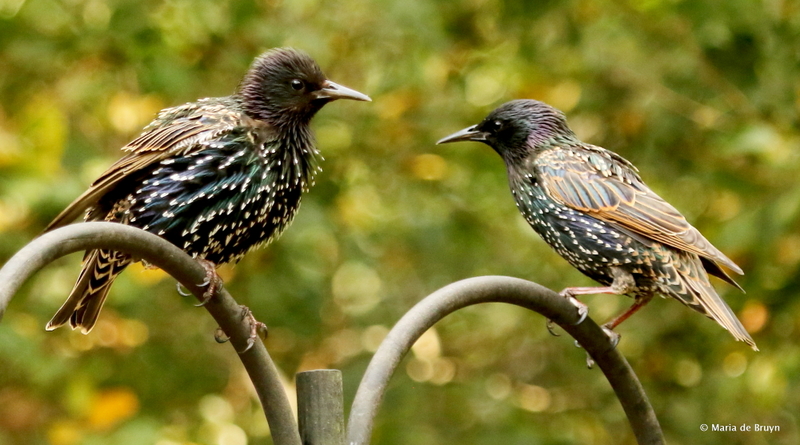 Soon the starlings showed up, leading me to think that either “scout” or “watch birds” were left behind to warn the flock when preferred food arrived, or they had a tremendous sense of smell that led them to my yard. 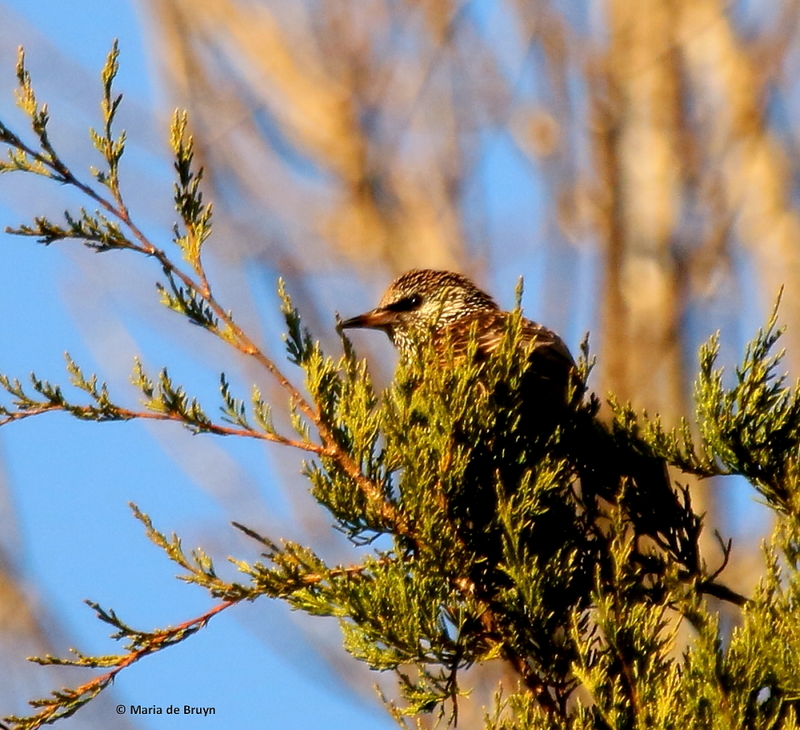 It does turn out that starlings use their sense of smell to identify plants for their nests, so who’s to say they don’t use it to find food, too? 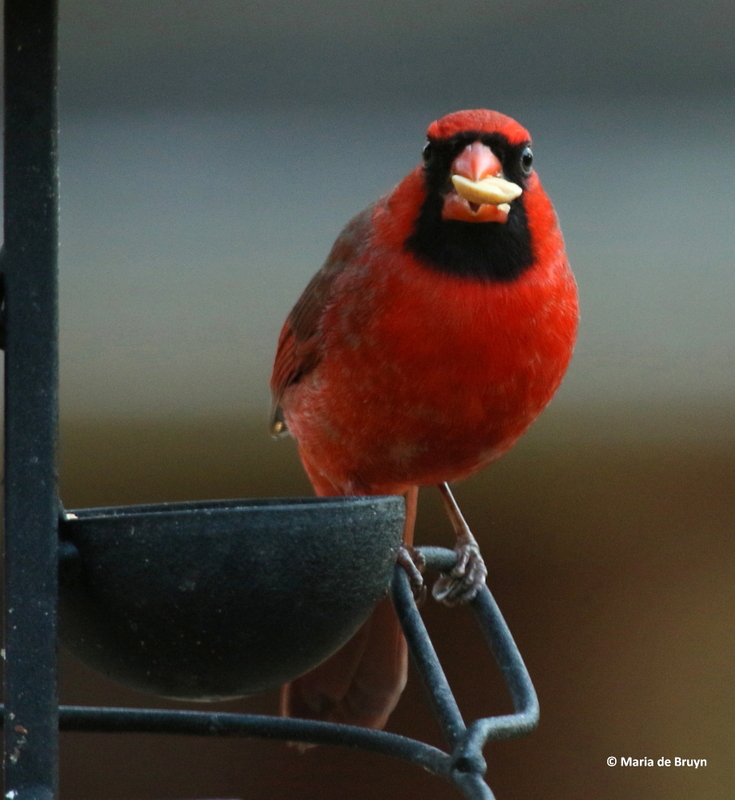 One bird advice website recommends avoiding sunflower seeds as “bully birds” prefer them. 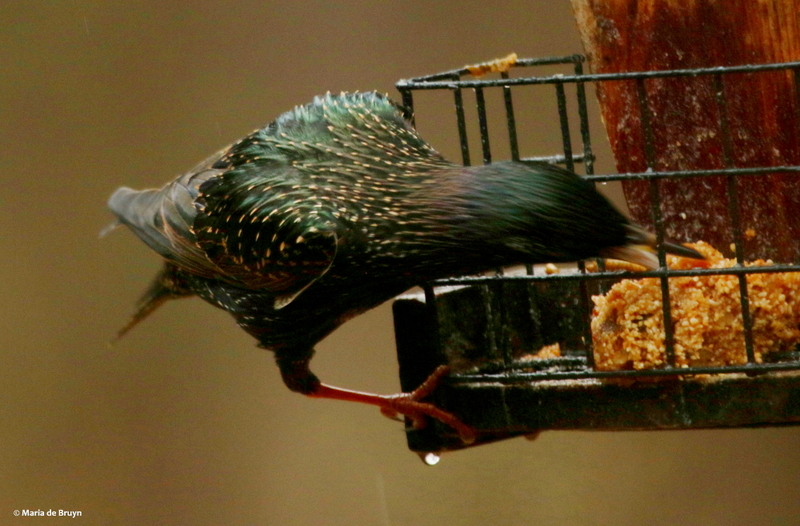 Well, so far, the starlings have assiduously avoided any seeds. 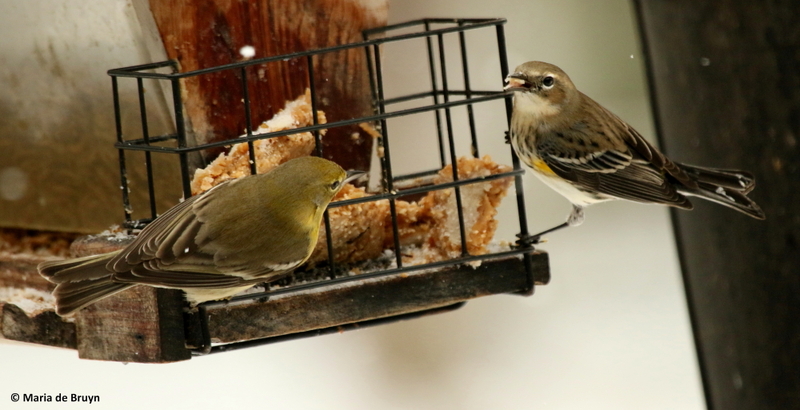 So a couple days ago, I filled all the feeders with seed except for the suet feeders – and I stood outside next to them so that the songbirds could have a go at the suet without their bigger avian neighbors chasing them away. 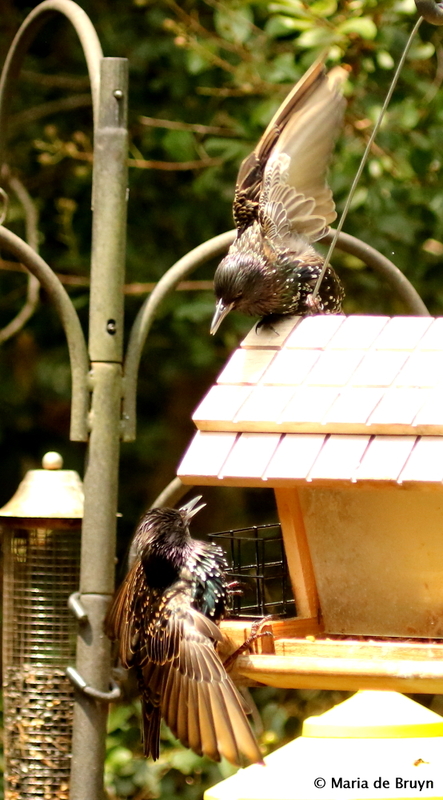 It was gratifying to see the little ones enjoy a bit of suet while the starlings perched high above, unwilling to come down in my presence. 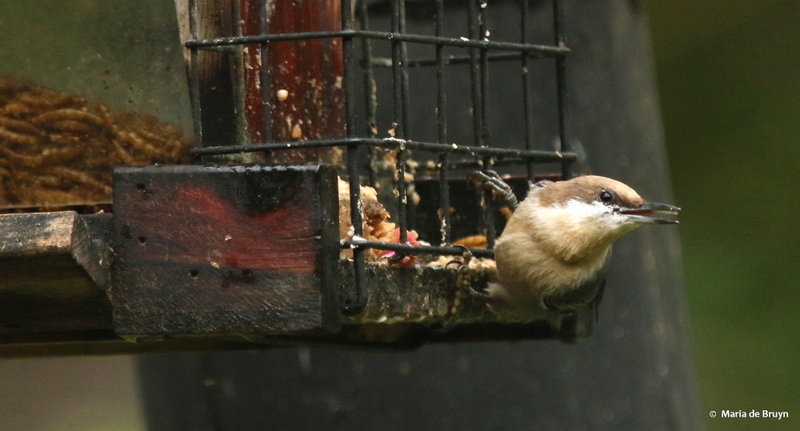 Today, it was raining persistently but the songbirds were flying to and fro among the feeders so I put suet in three holders and some mealworms in one. 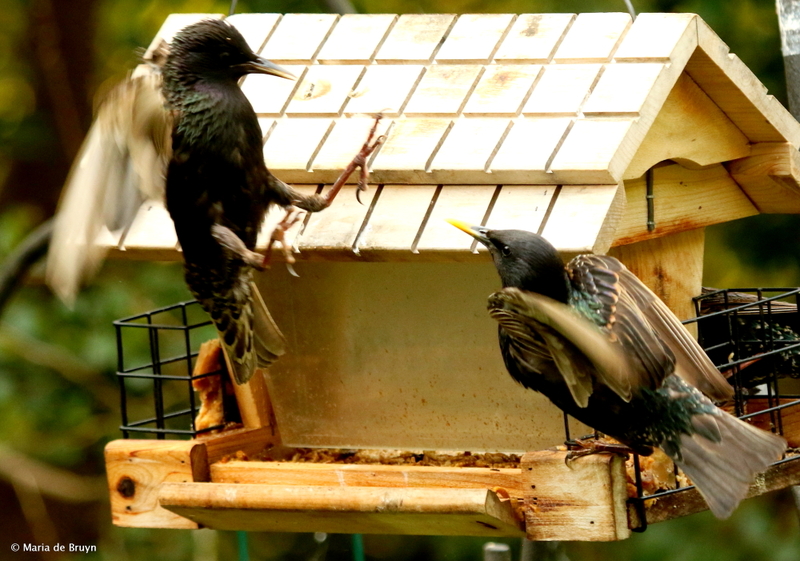 For an hour or so, they had the dried worms and peanut butter-based treat to themselves; then a starling appeared. 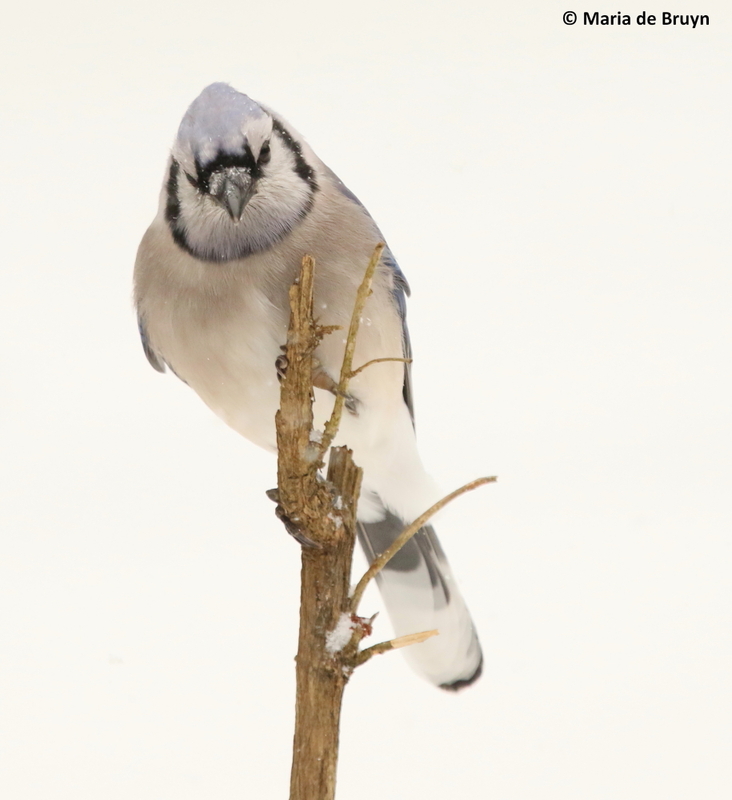 I went outside but this particular bird didn’t seem to mind. 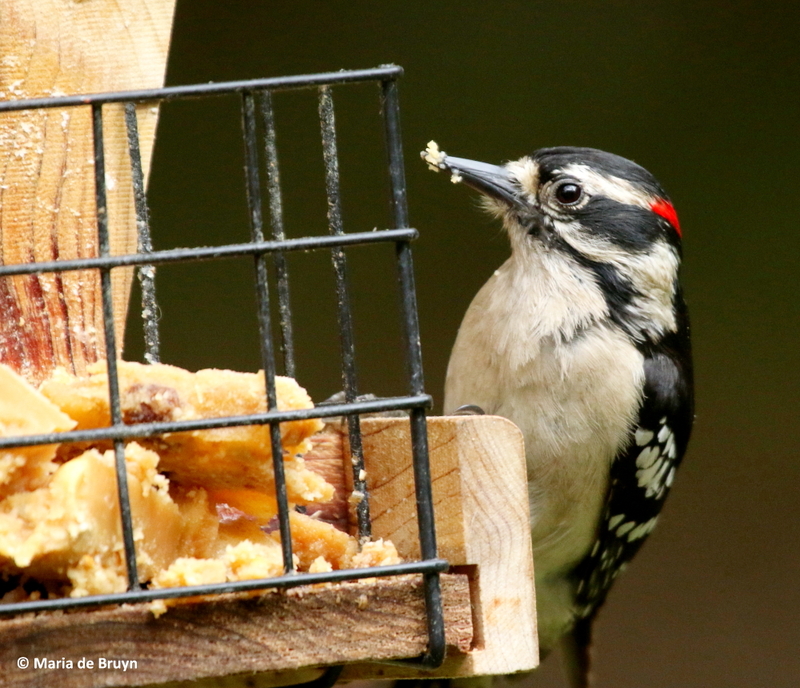 When three of its compatriots arrived and saw me, they swooped away so the little birds still could grab some suet and mealworms. 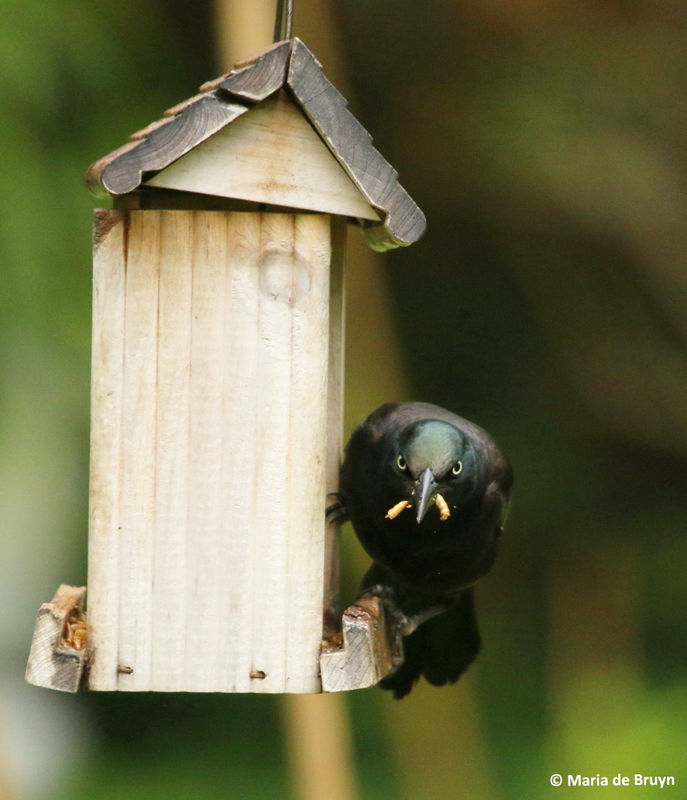 Now I’ll wait to see if the starlings begin eating the seed or finally move on or stay away for longer periods. 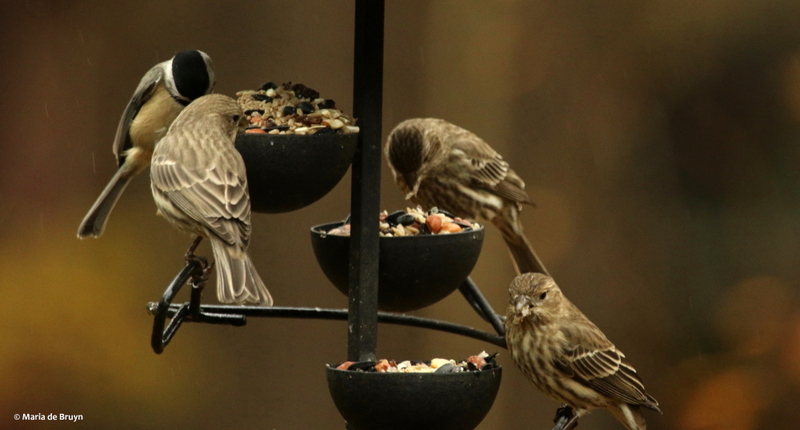 I’m guessing as long as there is occasional suet, they will leave their scouts in place to warn them when a tasty meal is available. 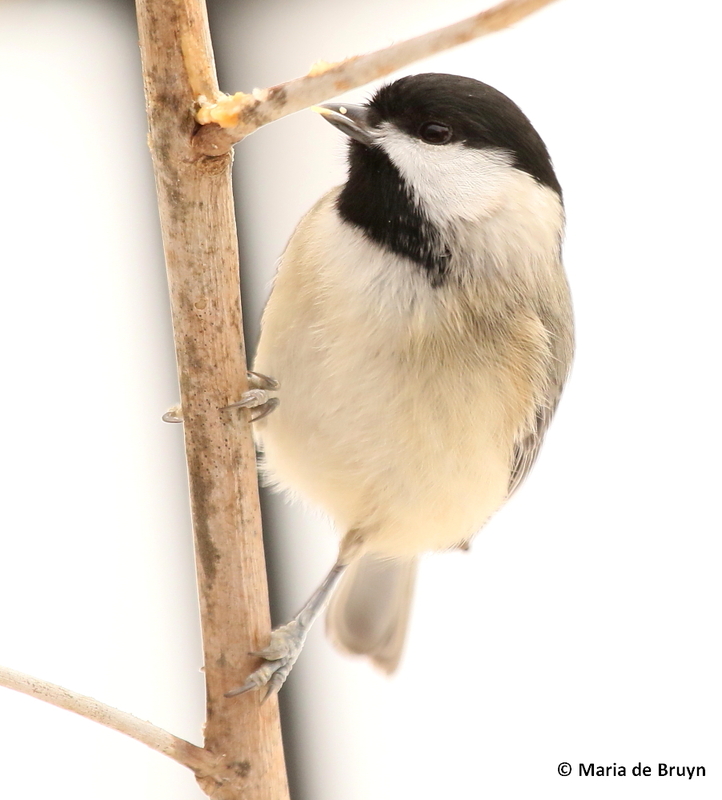 And I do want to put out some mealworms now and again so I don’t disappoint the chickadees and wrens who greet me with loud twittering when I approach empty feeders. 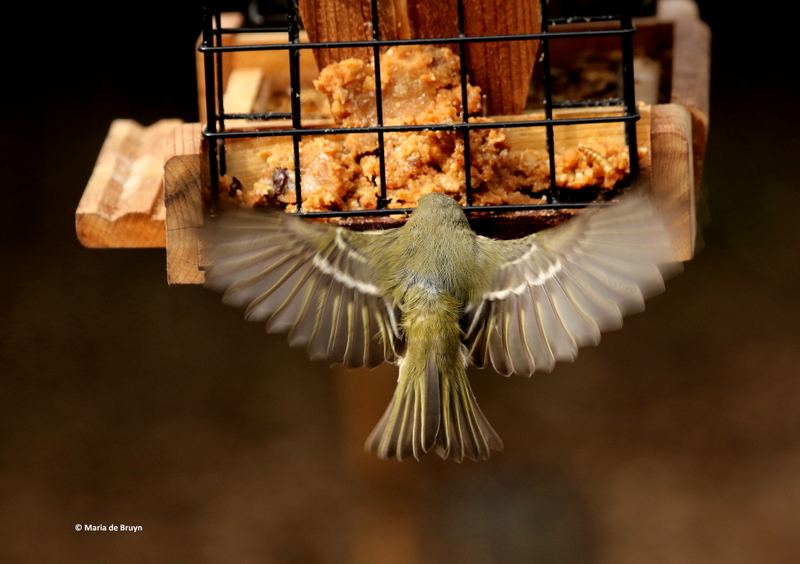 Non-birders probably think that’s silly (to put it mildly) but I think bird lovers will understand….